I was actually in bed when Alfie arrived today. He looked so happy to see us. The lady of the house gave him his drink and dressed him and he was presented to me to look after for the day. What an exciting prospect! After taking the dear lady to work, we had breakfast together before Alfie had a little play and then a sleep – I am not sure he had much last night – before we went off adventuring. 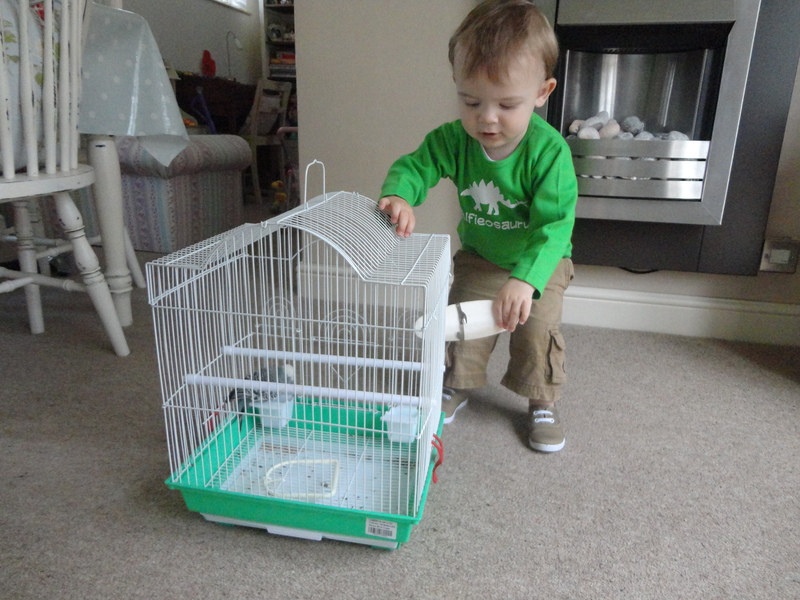 Alfie decided to play with the little pink pushchair again this week as well as the mini dyson. Quite a domesticated little fella! He was also fascinated by Fergie. Fergie is a blue budgerigar that Mia and Millie’s dad rescued in their garden. Fergie was in distress, having been attacked by two magpies, until he was rescued and adopted. The magpies had gouged his eyes out and now he is blind and has lost some of his tail feathers, but has been given a new home and new hope. 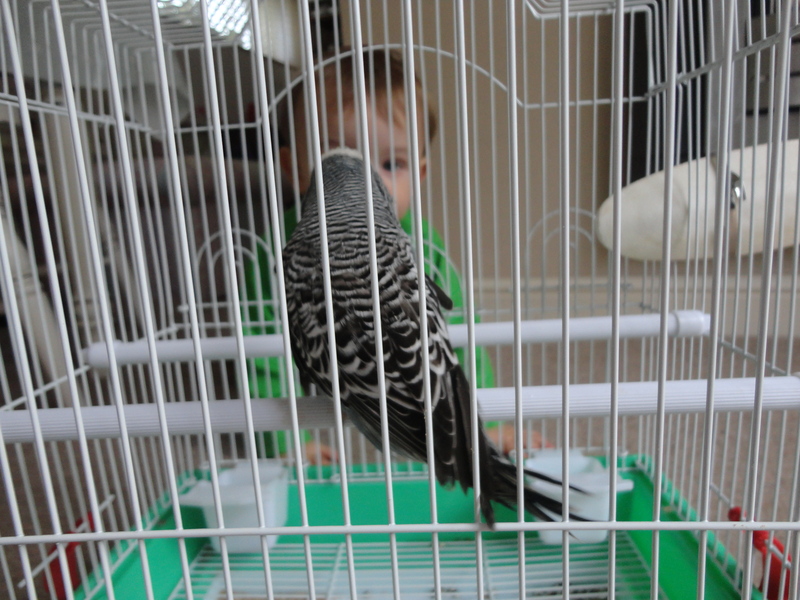 The lady of the house is budgie sitting for a week. 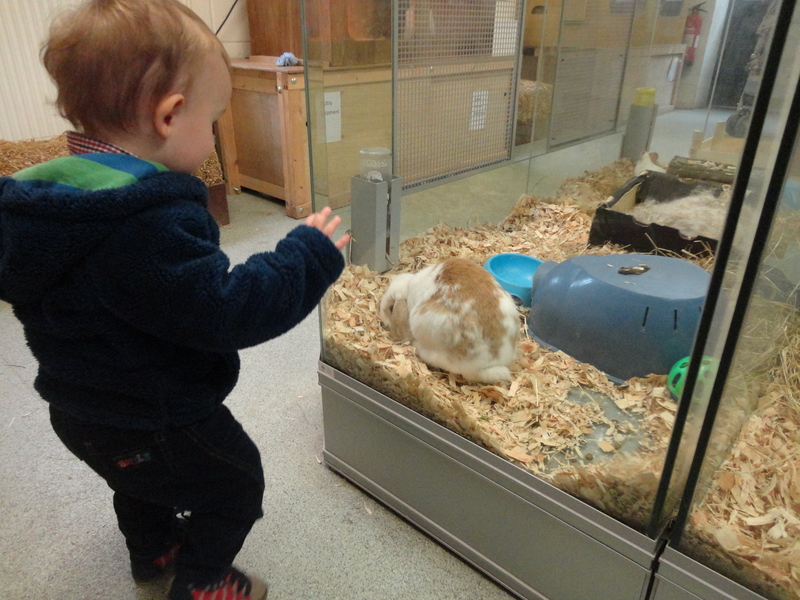 Alfie was fascinated! We had decided to go to Barry today on the train, but several things happened to change things. I received a text from my old buddies Graeme and Llinos who are home from Scotland for a few days. Also the weather looked a bit bleak and I did not fancy being stranded somewhere in the rain with no car. I am falling back in love with Barry after a long time when I thought the place was a dump. I was wrong Barry is a small town, rich in history. Barry was very let down in the old South Glamorgan days when all the local money went to develop Cardiff Bay and places like Barry were left to decay. 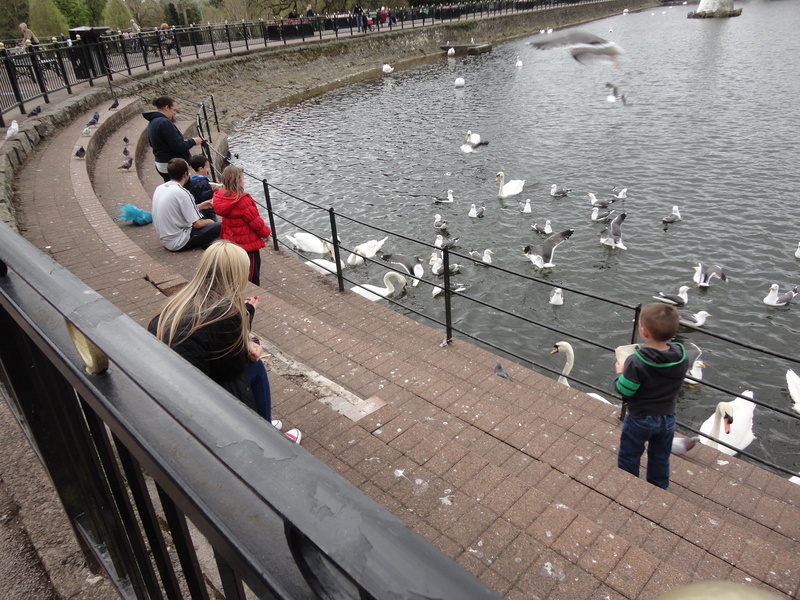 I love Cardiff Bay, but it’s a shame Barry wasn’t helped at all. As a young lad I absolutely loved Barry and I think I do again. Train enthusiasts love Barry too, because old Dai Woodham bought many of the old steam trains and stored them in his scrap yard. Loads were cut up, but lots were sold to Preservation Groups. I remember well, sitting in lectures in my old Barry Training College and gazing out as the huge low loaders crawled up the hill with massive steam locos strapped on the back. They now proudly work again on the preserved lines around Britain. I suggested therefore to Graham and Llinos that I meet them in Charles Place, where my old friend Beryl lives. Beryl is Llinos’s mum. When we got there, we were greeted by Beryl and a family friend Cyril; they were great with Alfie and he appreciated seeing them so much. 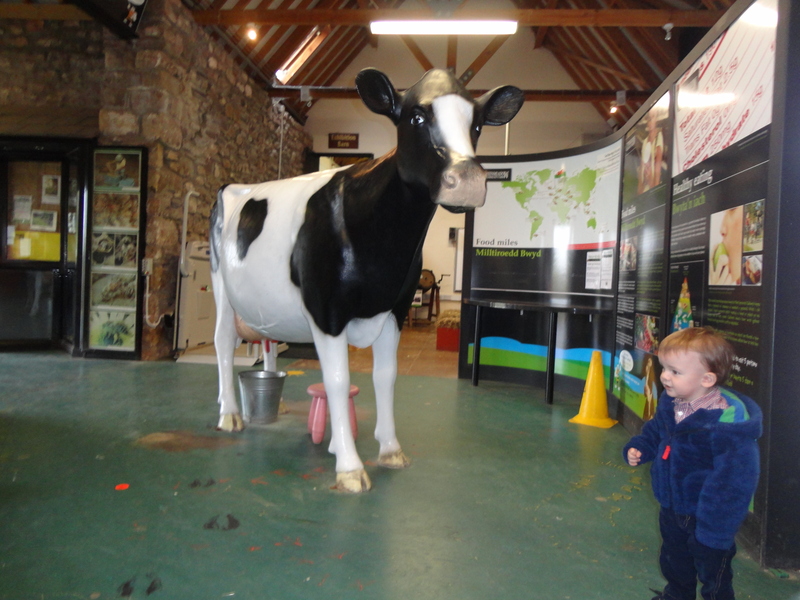 We hadn’t been there long when Rhys, made a pertinent observation and told me that Alfie had snot on his nose. He was exactly right and I took the liberty of pulling out a tissue from a box on the table. I was embarrassed when half the box came out. Everyone laughed! I removed the offending snot and gave Rhys the job of snot spotter for the day. 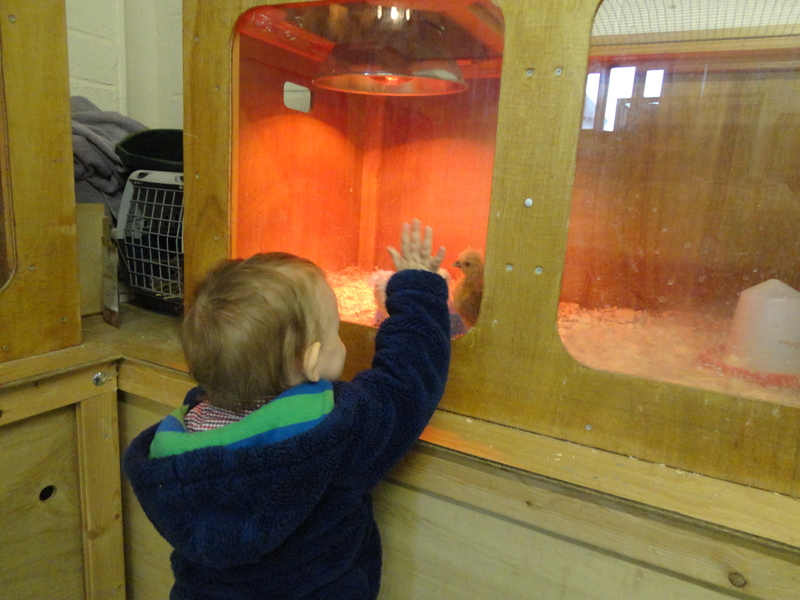 The lad did his job very well and cries of ‘SNOT!’ could be heard most of the time we were together. 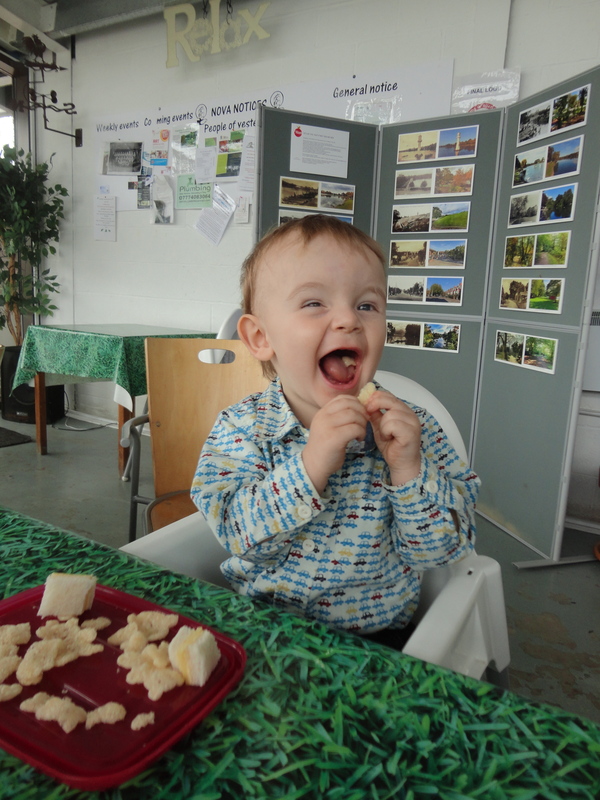 I like Rhys, you cannot beat a good snot spotter; they are hard to find these days. 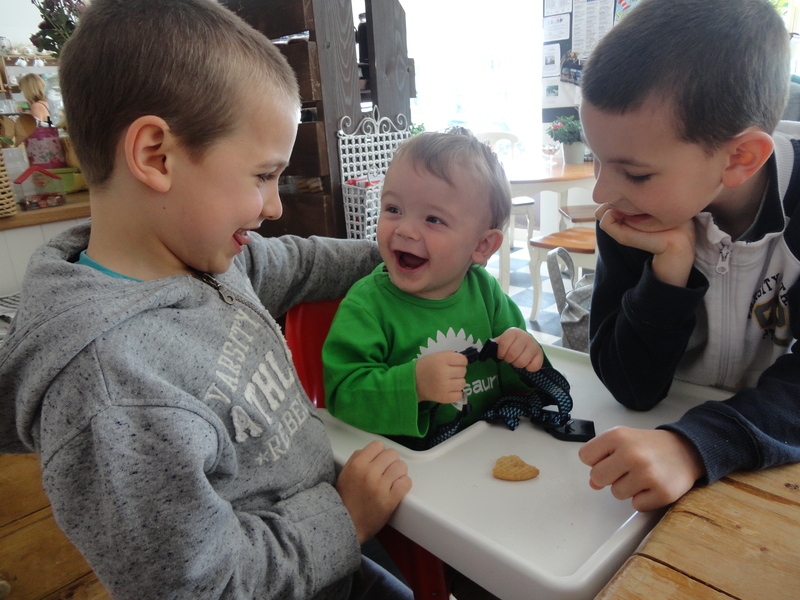 When we were outside near the car Rhys and Noah had the giggles when I showed them the roll of toilet paper I kept in the car to remove any snot I saw. I liked them to know I too had come prepared. 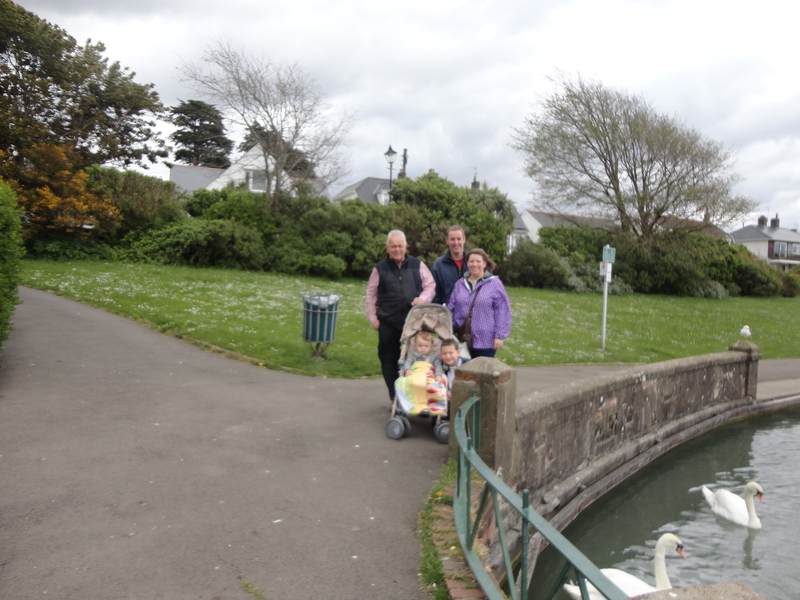 After a natter we set off down for a walk around the Knap. Cold Knap has a coastal pebble beach, approximately a mile west of the sandy beach at Barry Island, which attracts visitors during the summer months. It was founded by the Romans who used it as a port. The Knap Swimming Pool, Barry’s “Jewel in the Crown”. This was the largest and one of the best known outdoor swimming pools in the country, with at one time a water polo team, a swimming club and a lifeguard club, with a combined membership of over 250. Barry Rowing Club, formed in 1897, must have one of the longest sporting histories in the town. The grounds of the Knap Hotel, which, some summers, were covered with tents of Scout groups visiting the area. The open air swimming pool has now been closed and been filled in, and the area turned into a tourist trail. I loved going to the pool as a youngster. We used to buy a mug of Oxo after swimming. The pool was built in the 1920s by unemployed workers on a docket system, with funds from the Unemployed Grants Committee. 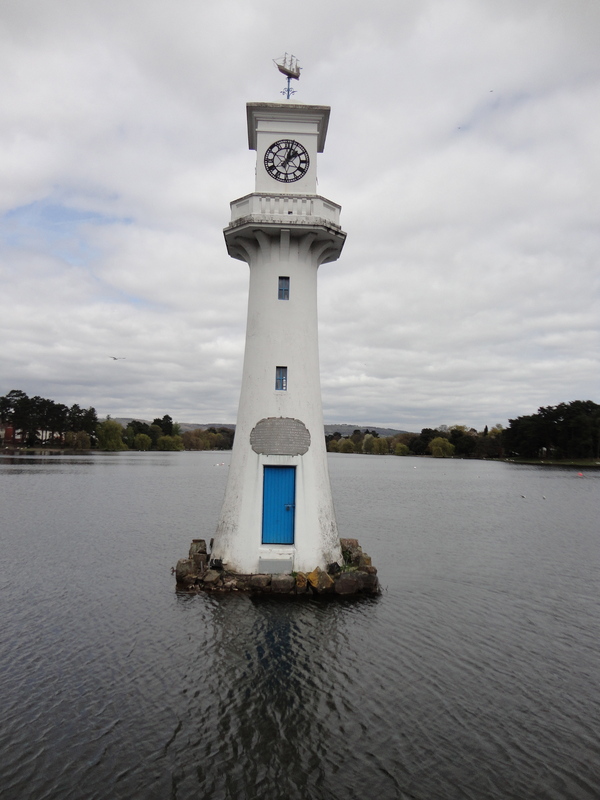 The Lake and Pool was built on the bed of the old Cadoxton River which flowed from the Watchtower Bay end of the pool, towards Bindles, joining the brook which used to run through Romilly Park and out to sea at the Pebble Beach. 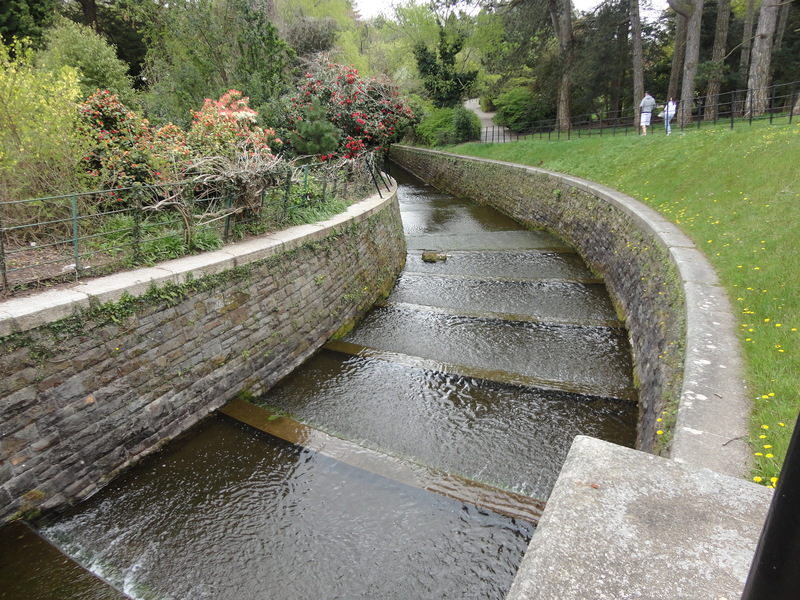 The Knap Pool was built as a tidal pool, designed to be filled at high tide by means of a sluice gate, which opened when the pressure of the water outside the pool was greater than pressure of the water in the pool. 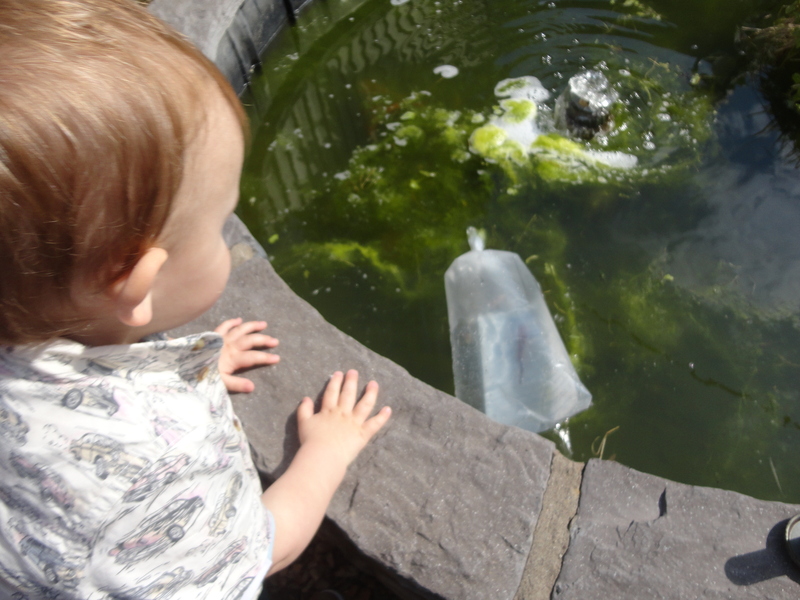 This system was discontinued when a gas engine was installed, allowing water to be pumped into the pool at high tide. This pump was installed at the deep end near the diving boards. The pool is one of the largest open-air pools in Britain, is 120 yards long and 30 yards wide, and contains over 1,000,000 gallons of water. I always remember the crowds and the fact the water was salty, like the water in Penarth Swimming Pool. I have always thought The Knap was such a strange name. I used to call it Cold Knap when I was younger and many people still call it that, but all the road signs just say The Knap. The name always caused some sniggering in the back of the car when I was young. Youths used to scribble out part of the n to make it look like an r on the road signs, so Cold Knap became something else a little ruder. Isn’t it funny how some silly things stick in your mind years later? Maybe it is just me, although the lady of the house says there’s no maybe about it! We had a lovely walk down through a kind of park along the seashore; we noticed a sand dredger parked on the beach against the harbour wall. 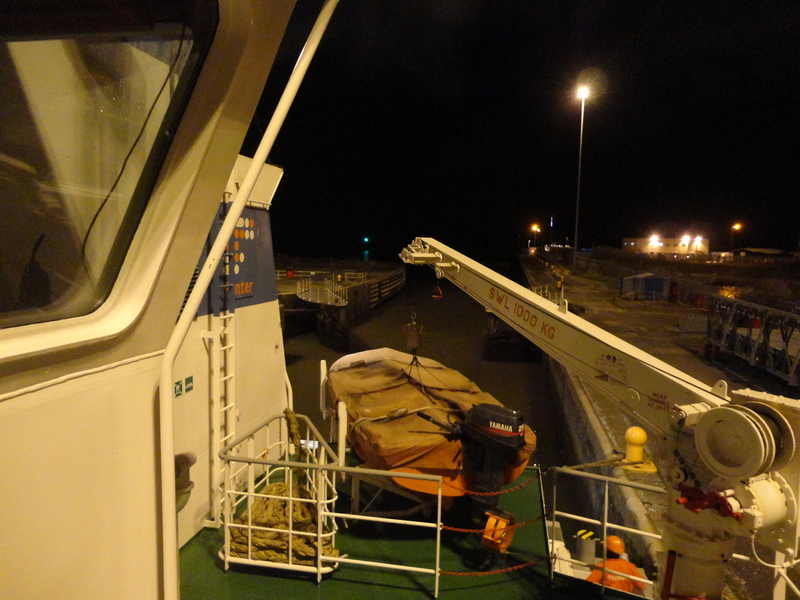 The captain is not doing his job properly I could see, as the tide was miles out and the boat was stuck on the sand! We soon came to the lake at The Knap; it’s quite interesting as it is built in the shape of a harp. You can’t tell when you just stand on the edge. 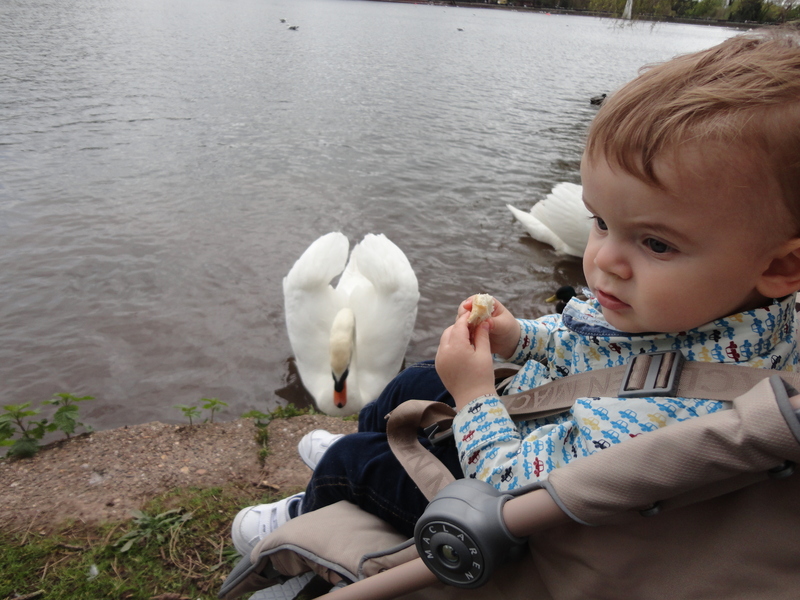 Alfie loved the swans and ducks and I was kicking myself for not bringing some bread. I noticed that a small stream fed into the lake, just near to where we were standing. 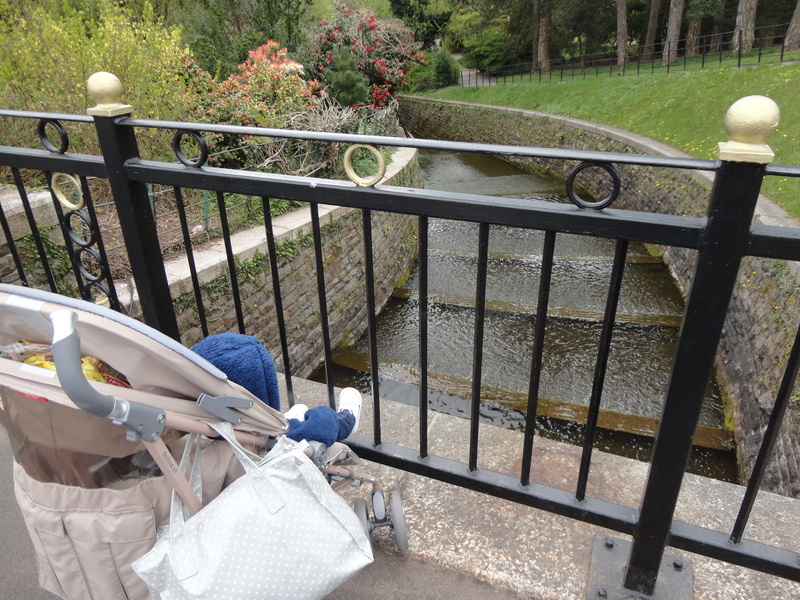 Great, here was my chance to introduce Rhys and Noah to Pooh sticks. 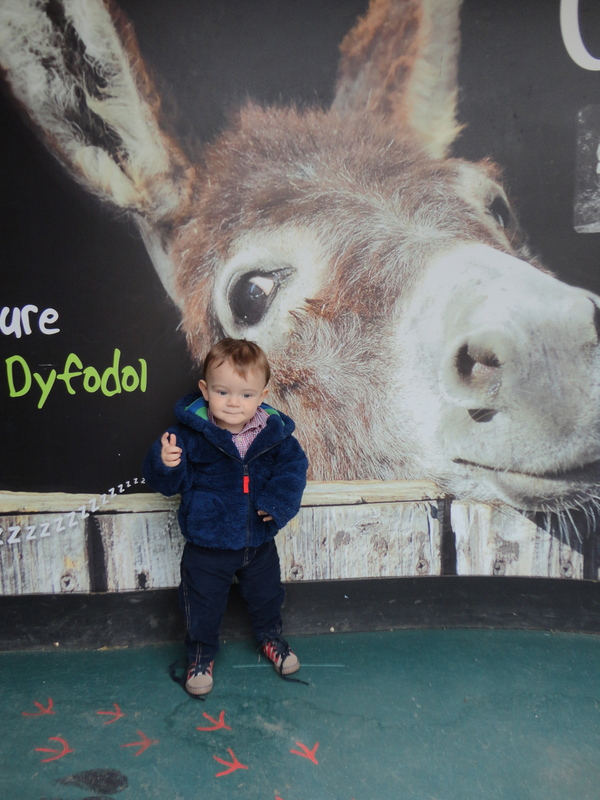 I played Rhys as Noah was busy having fun with Alfie. I won the first race and the second…Wales 2 v 0 Scotland. I felt good but Rhys pulled one back before we had to leave to have our lunch in a nearby café. Still, beating the little lad 2 v 1 felt good and some revenge for the defeat Wales Football Team suffered in Hampden Park a couple of months ago! my mother gave a stranger’s child her breath. and rosy in my mother’s hands. in that lake with the poor man’s daughter. Gillian Clarke says the poem is a true story, or “as true as I and my memory can make it”. (Clarke was a young girl when the main event happened, perhaps the same age as the child in the poem.) It is about a girl who nearly drowned in a lake and was given the kiss of life by Clarke’s mother. When the child was taken back to her “poor house”, she was “thrashed for almost drowning”. My word those times were tough. 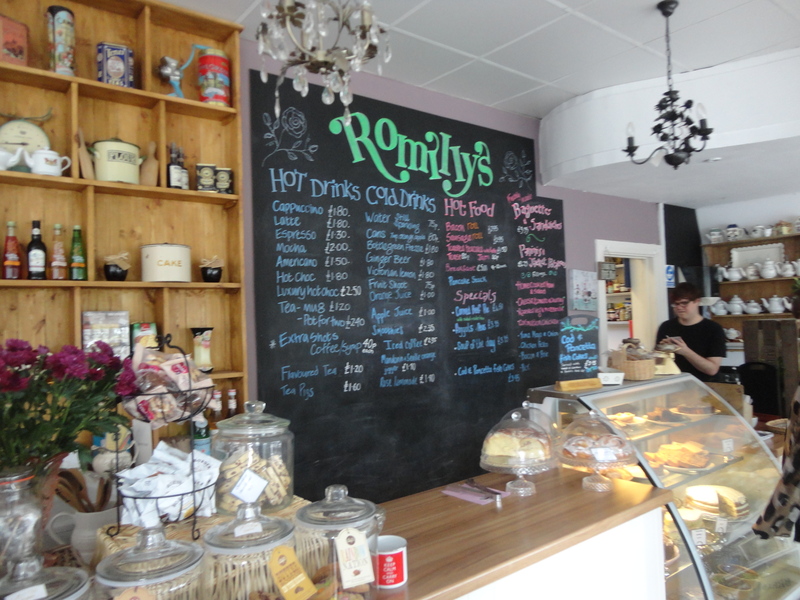 We made our way to Romilly’s, which I think is a new eating place. When I walked in I though how much the lady of the house would like this… it was all shabby chic. 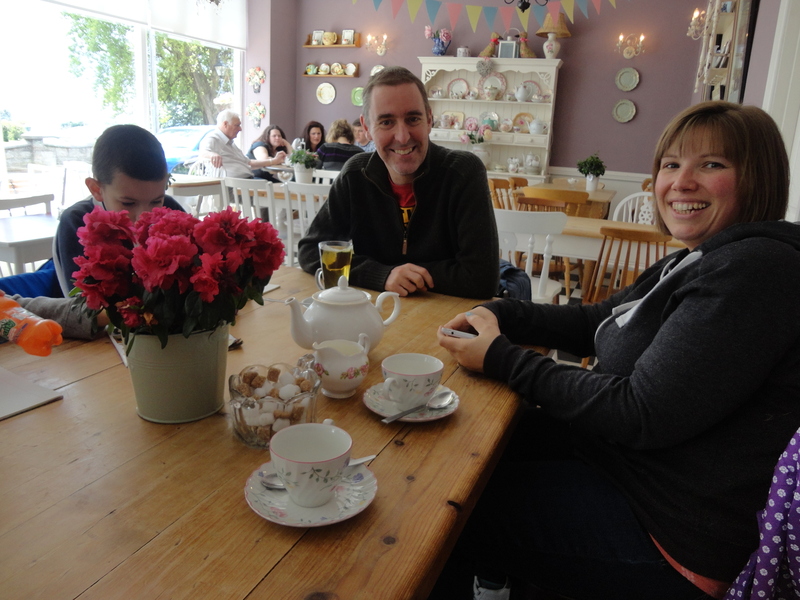 Very kindly Graeme and Llinos paid for my lunch, they are such kind friends; they obviously enjoy feeding the elderly. 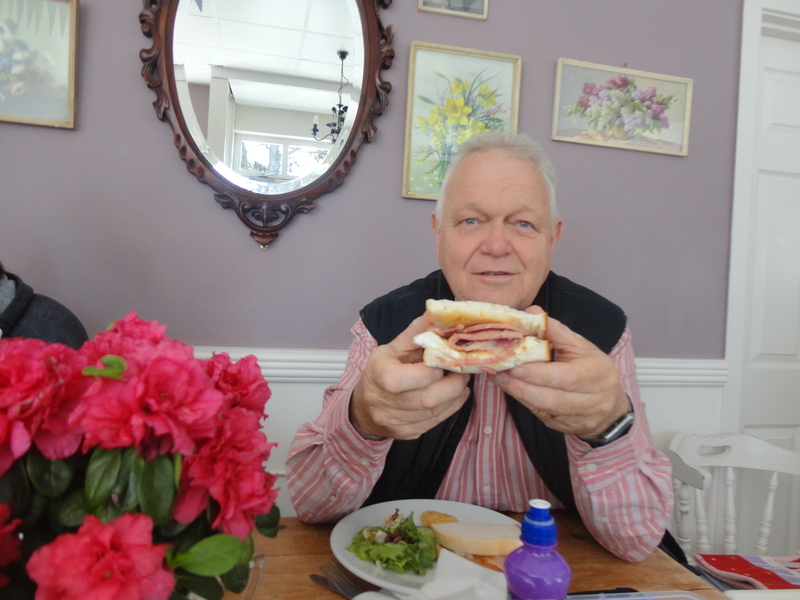 The food was superb; I had a bacon and Brie sandwich and shared a pot of tea for two with Llinos. 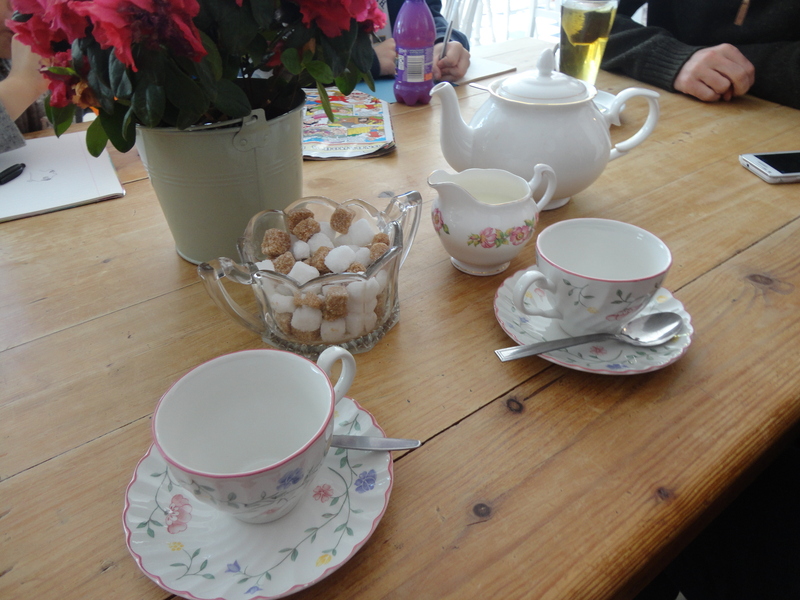 It was served in a pot, complete with fine bone china cups. All that was missing was Mr. Hungate saying, ‘May I…” I thought I was in heaven! I had brought Alfie’s lunch, so he tucked in happily. During the meal Rhys drew a picture of Alfie, it was pretty impressive. 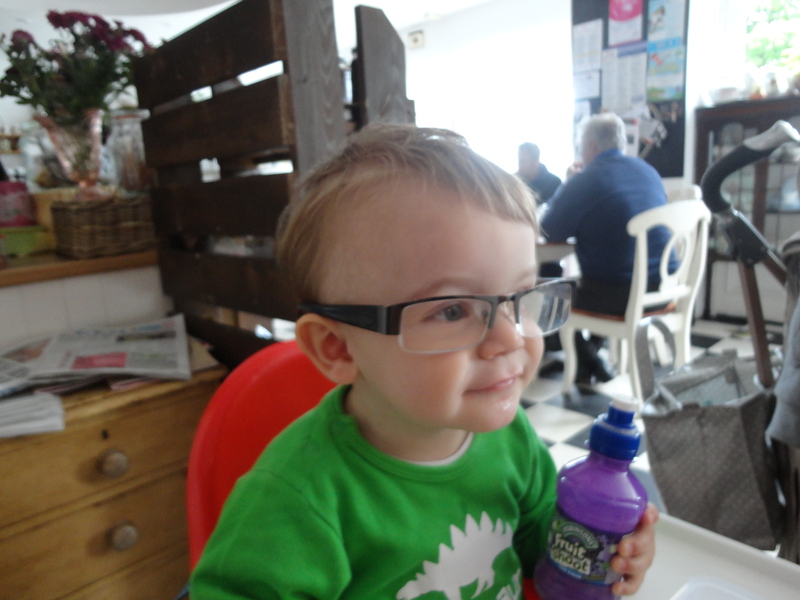 I noticed during the meal, and all the others noticed it too, that Alfie is getting to look more like me every Friday! Graeme and Llinos are such wonderful friends to us. Llinos was a youngster when the lady of the house and I were Youth Leaders in our church. She found a Scottish boyfriend and went to live in Glasgow or just outside somewhere. We miss them a lot and hope one day they will come to Wales to live. Graeme is a great lad and I appreciate his gentle, friendly nature so much. Alfie and I were so happy enjoying lunch with such beautiful people. 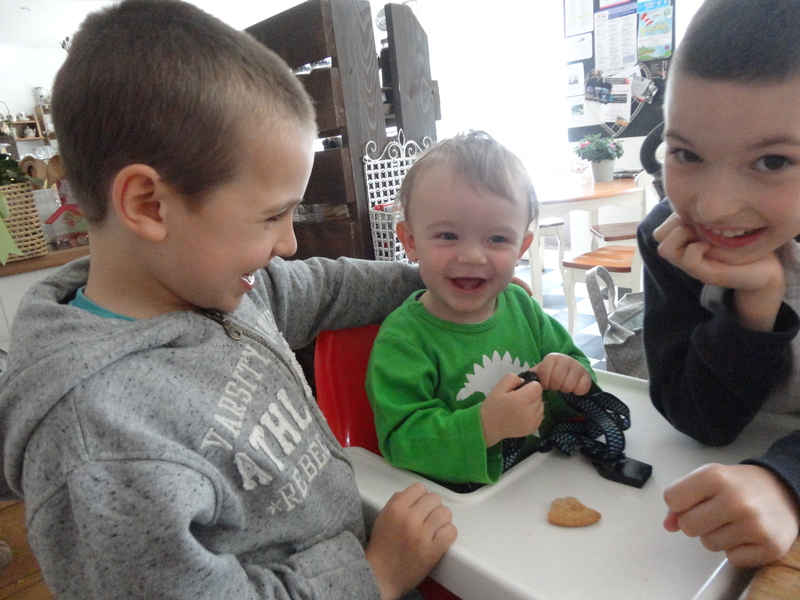 The boys too were so fantastic with Alfie… he has not enjoyed such a great lunch for a long time… three happy boys together. 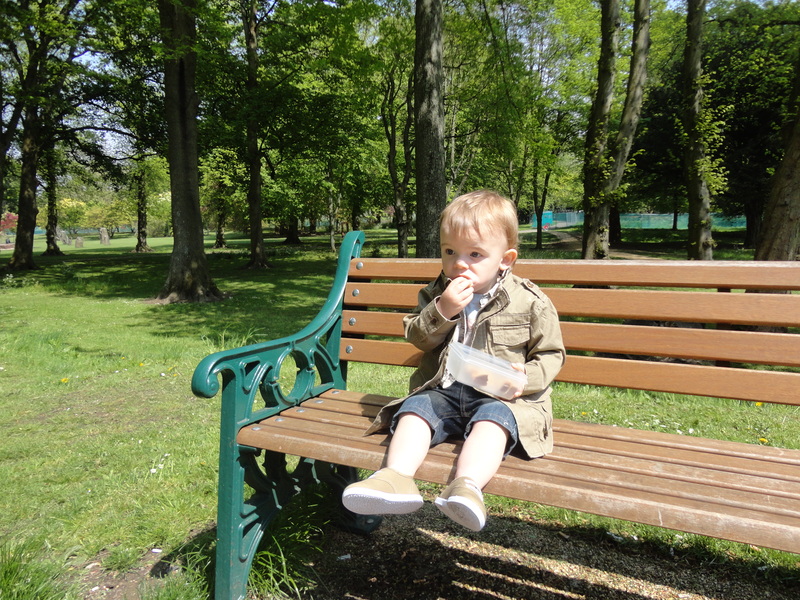 After lunch we made our way up to Romilly Park. 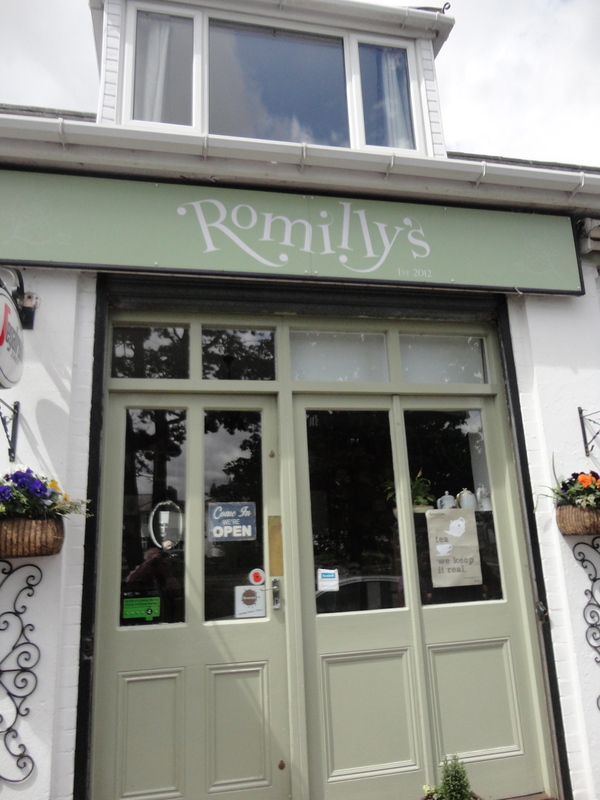 Lots of things in Barry are called Romilly, I think he was some kind of Baron. The first Baron of Barry was John Romilly but it seems his dad was more famous, Sir Samuel Romilly. He has a public house named after him, so he must be well known. 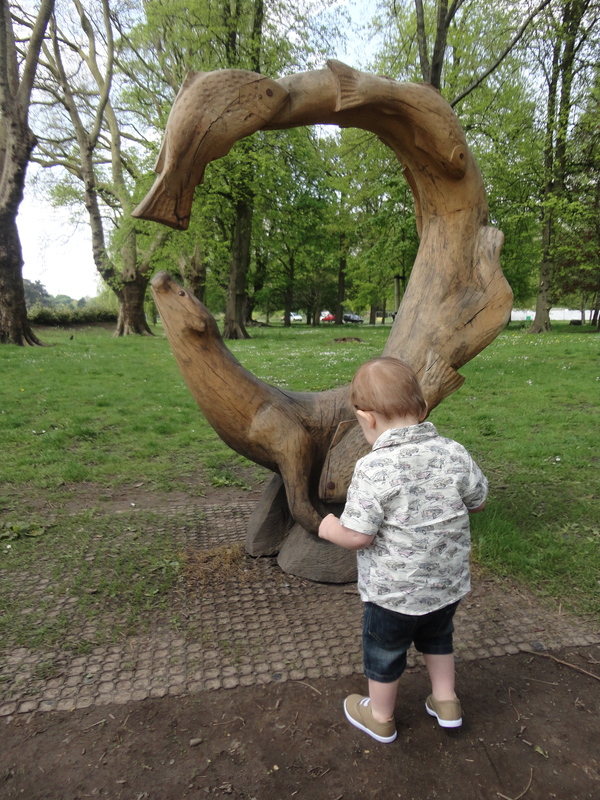 Romilly Park was beautiful even if a bit windy. 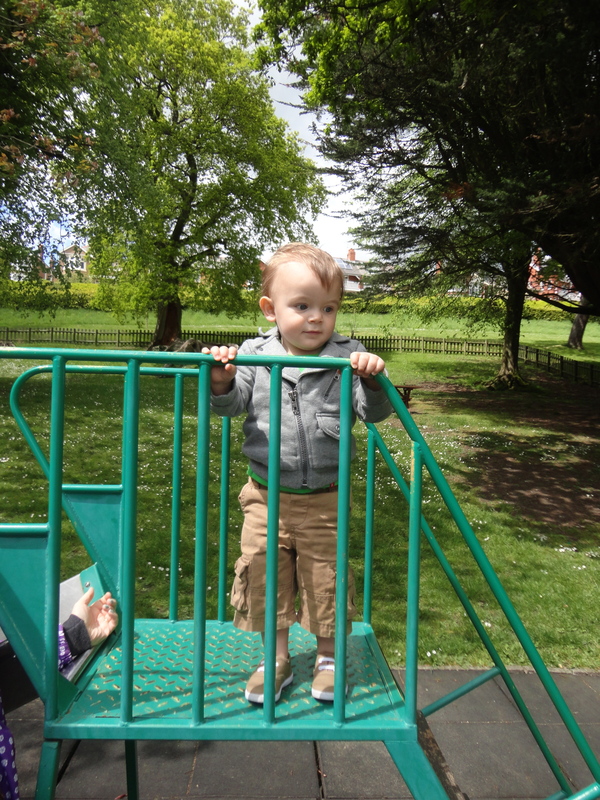 Alfie loved the open spaces and walking around the play area. 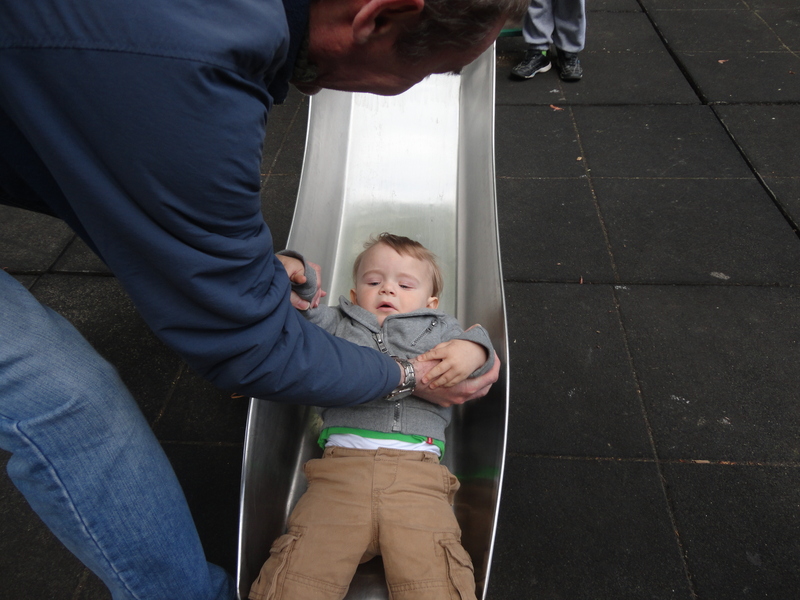 I am not sure he loved the swings and seemed more anxious to get off than get on and certainly one go on the slide was more than enough. 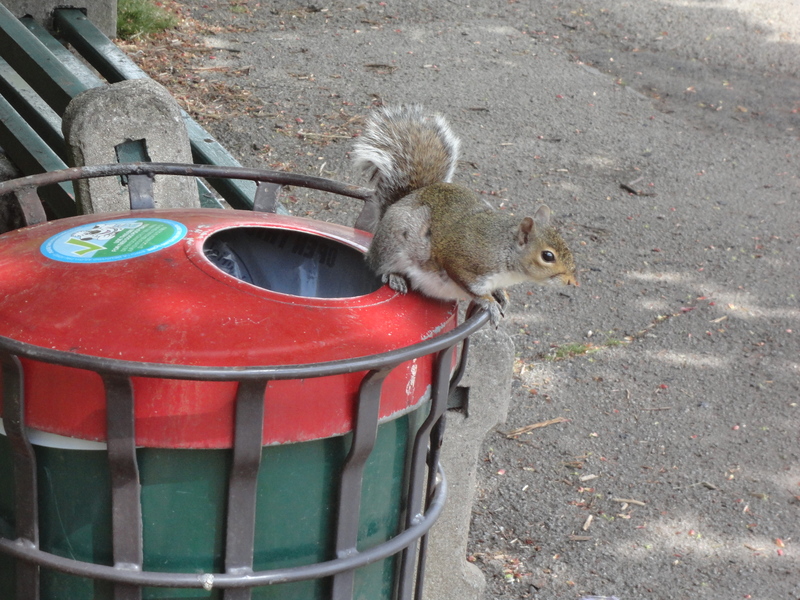 Alfie spent ages watching a squirrel that was busily devouring the contents of a waste bin. 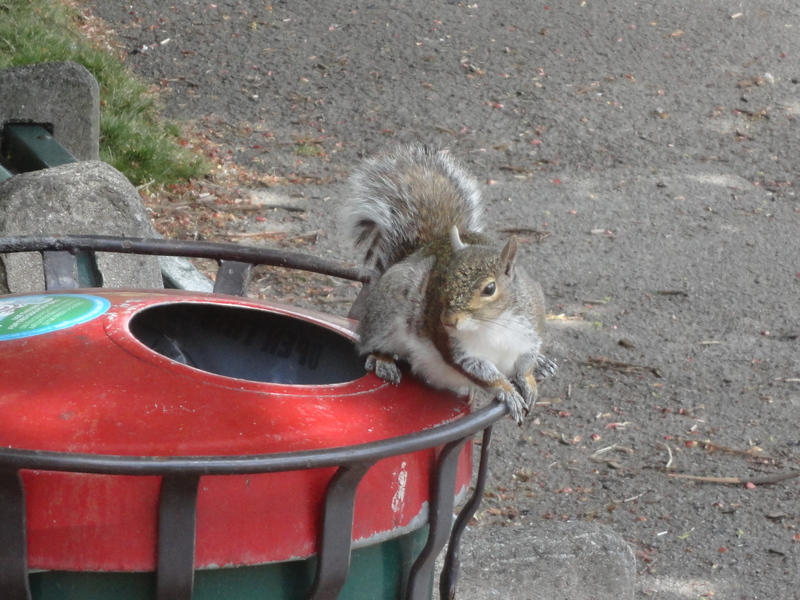 He would look around; disappear into the bin and a few seconds later reappear with a tasty morsel or two. After the park we made our way back to Charles Place, before thanking our friends for a delightful day. 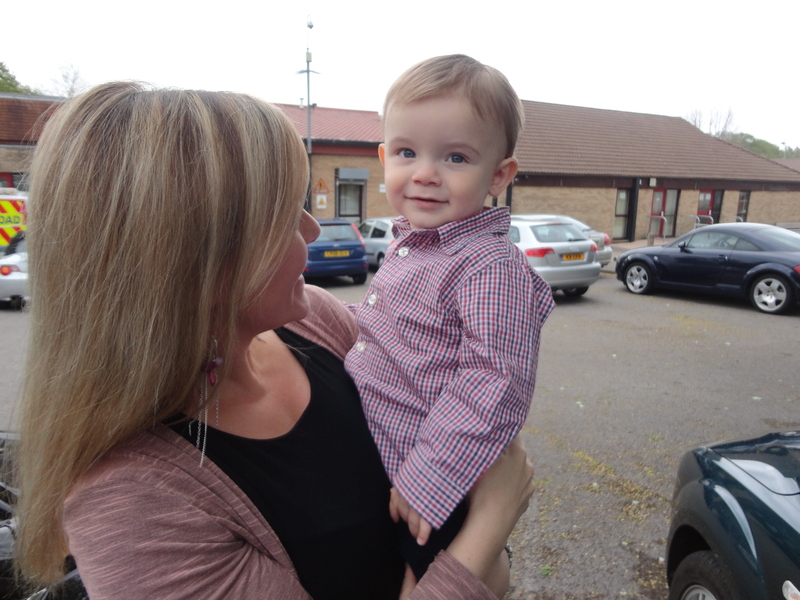 When we got home Alfie had a sleep, having enjoyed a happy day with new and wonderful friends. Alfie and I think the same about Graeme, Llinos, Noah and Rhys. 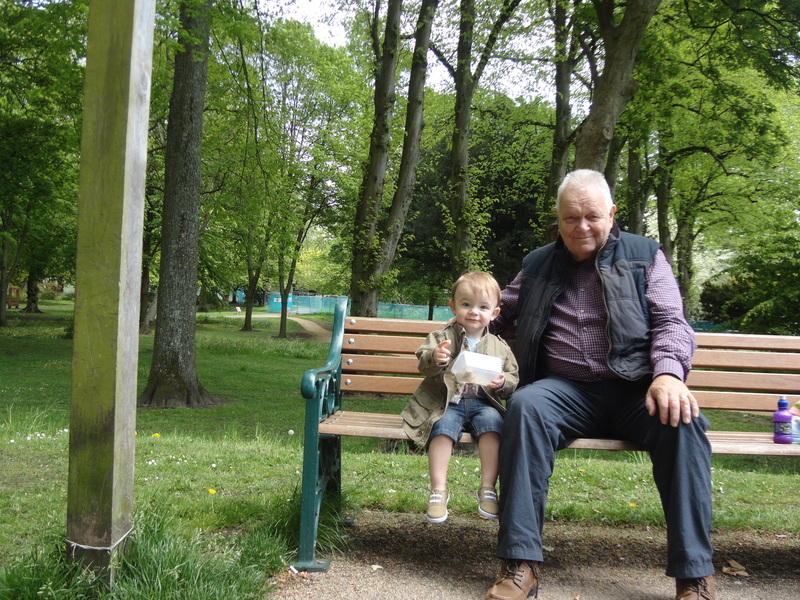 One of the main reasons for writing Adventures with Alfie is so that when he has grown up we can sit down together and read through them and he can learn about the wonderful place where he grew up and know that he had grandfather who loved sharing time with him and wanted him to know that he was loved more than words could ever say. 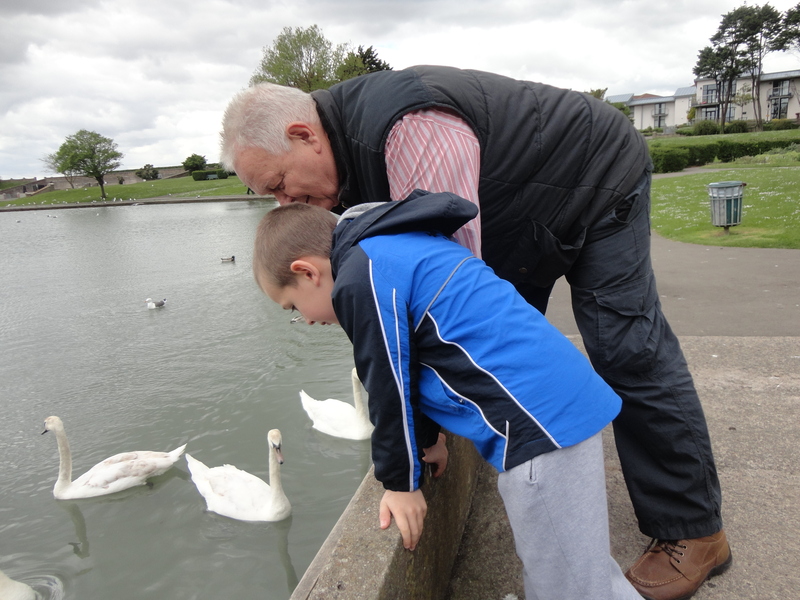 When he is older, he may not be living anywhere near Cardiff but wherever he is, he can sit with his own children and teach them about his heritage. 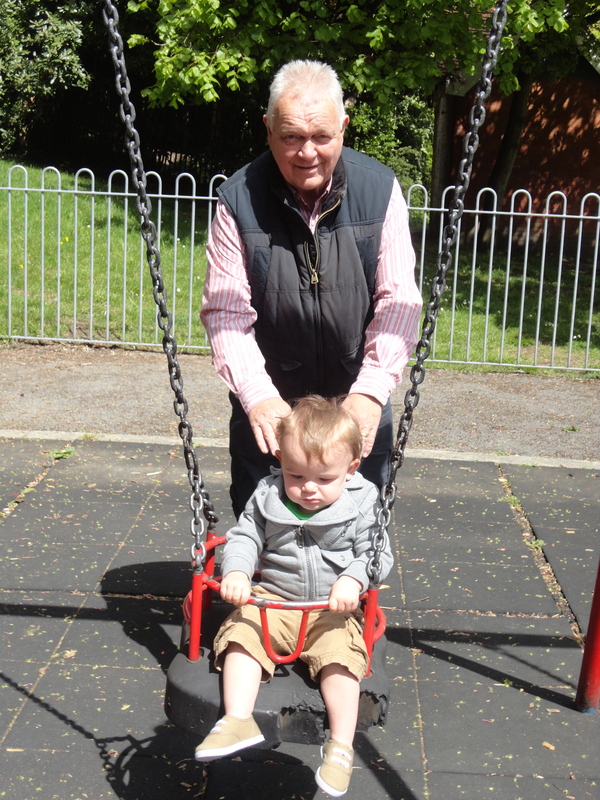 This is part of my legacy for my dear grandson Alfie Jay! 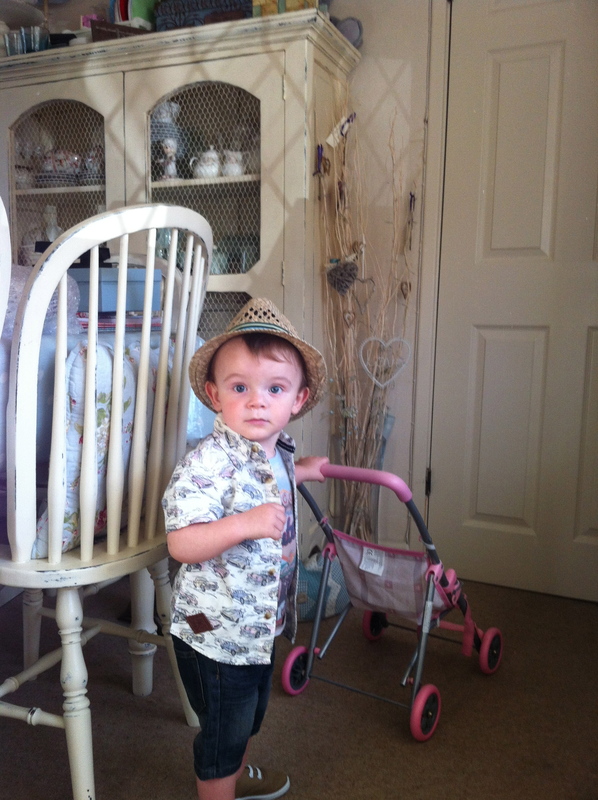 Alfie arrived at our place early on Thursday evening looking very much like Matilda’s dad – but only in looks – with a straw trilby perched on his head. He looked fantastic, really smart and ready to go adventuring, although he still had quite a while before we could see what this Friday brought. He was up bright and early and smiling the next day and the dear lady of the house assumed responsibility for his bath and preparation for the day. By the time came for her to go off to earn and honest shilling, we were all ready for another great day. When I was putty Alfie in the car, one of the dear lady’s ‘girls’ sneaked into the car and hid under my seat. Time was tight so we left her there while I took the good lady to her place of employment. As I did so, Tilly, the quieter one of the Yappie and Scrappie double act crept out from under my seat and cuddled up to Alfie in his car seat. 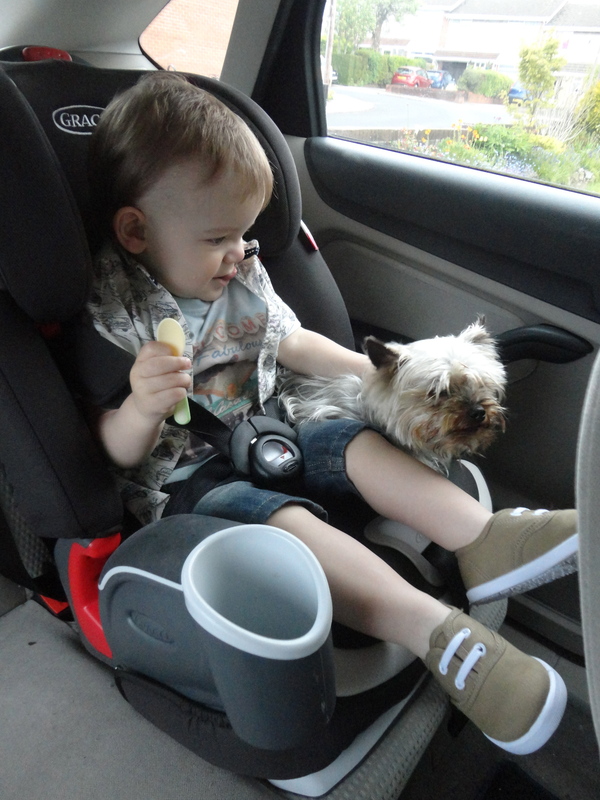 It looked very cute indeed, a little boy and a little dog, enjoying the trip as friends together. 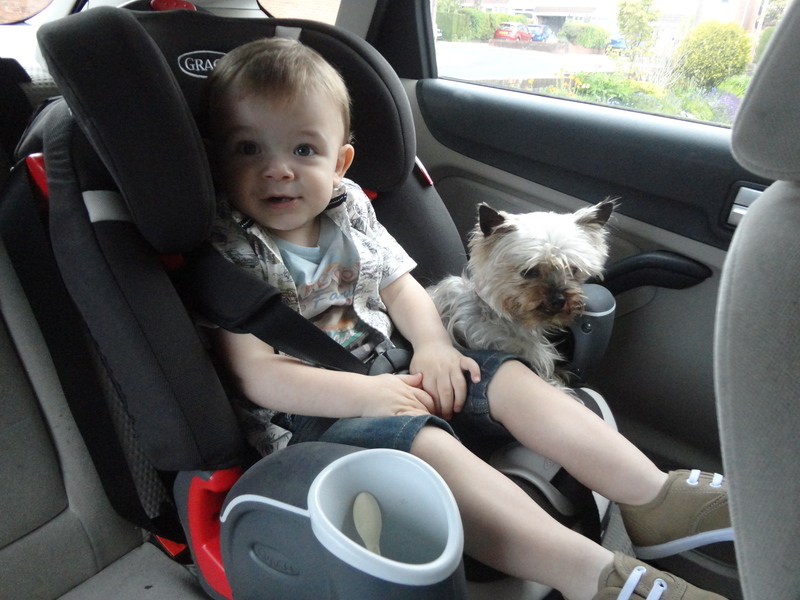 Tilly didn’t move all journey and Alfie loved having a new little travelling companion. We had planned the day in advance, breakfast down The Bay followed by the Cardiff Centenary Walk around the city. 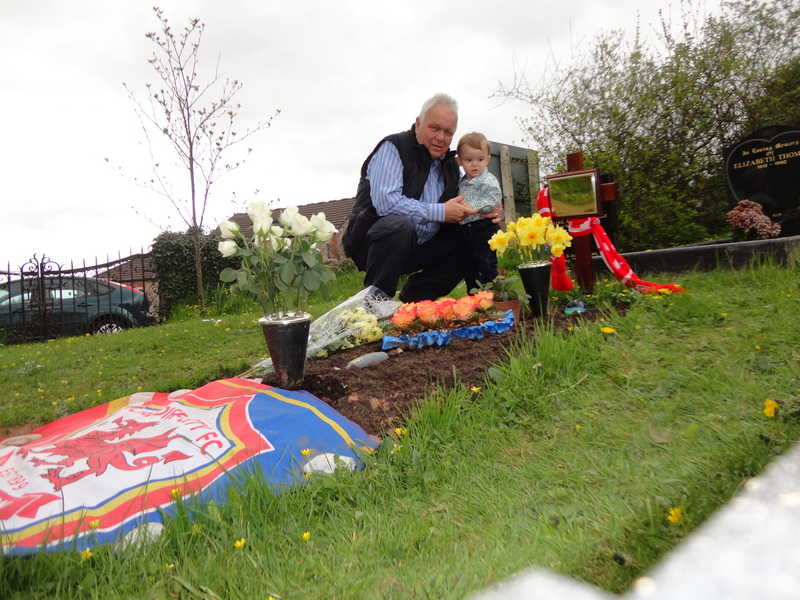 This was due to be part of Alfie’s legacy from me. Alfie is a boy who is Cardiff born and Cardiff bred. We arrived in The Bay nice and early and found a car park in our usual spot near The Coal Exchange. We bought our ‘first hour free’ ticket and the paid for an additional six hours before making for Subway for our £2 breakfast of egg and bacon 6-inch sub and a cup of tea. Lovely stuff!! When we got there the place was full of workmen all dressed in yellow hi-viz vests. I felt like we were on a cross between the set of Auf Weidersehen Pet and a gig practice for The Village People. All these workers were messing round and enjoying the tea break I presume! Usually the place is empty and Alfie and I have a quiet time together. Today was different. As we left we were greeted by the shouts of the guy touting for rides around The Bay on his little boat. I saluted and called him captain. We had done that trip last time so we headed for the train. 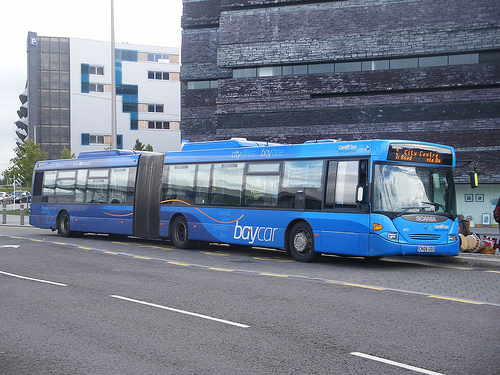 We had intended taking the train up to town; it’s a funny one-carriage shuttle that runs every twelve minutes connecting The Bay and the City Centre, but then I had the idea of taking Alfie on a Bendy Bus instead. That would be great fun…so we did. 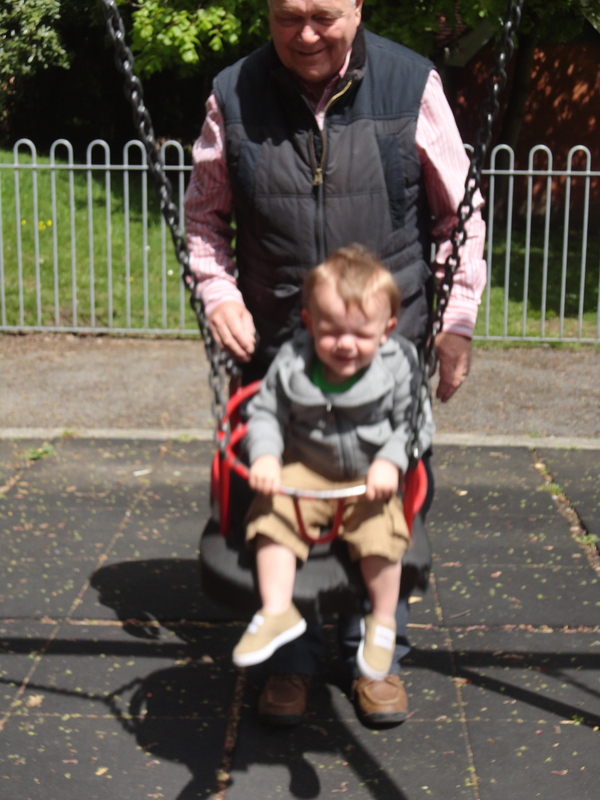 Alfie loved it… and so did I… and it was free! 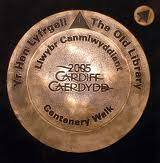 We got to town in no time and set about the Cardiff Centenary Walk, a gruelling 2.3 miles lay ahead. I was worried that travelling all that way might wear down the tyres of the Lady of the House’s still quite new pushchair. I had visions of her bringing out a tyre tred depth measurer when we got home. But it still had to be done. 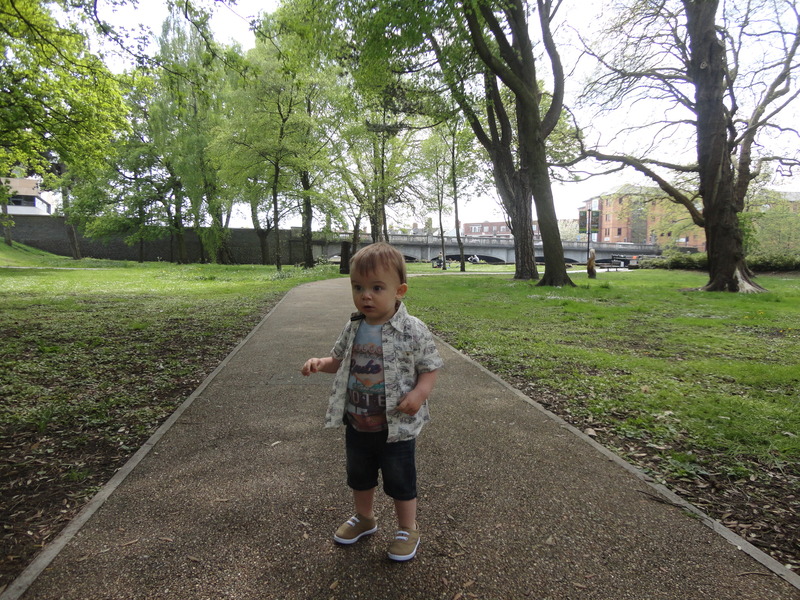 This was part of Alfie’s legacy from me and I hoped the Cardiff Centenary Walk would be a great way to explore the city centre on foot, and find out more about how Cardiff became the city it is today. 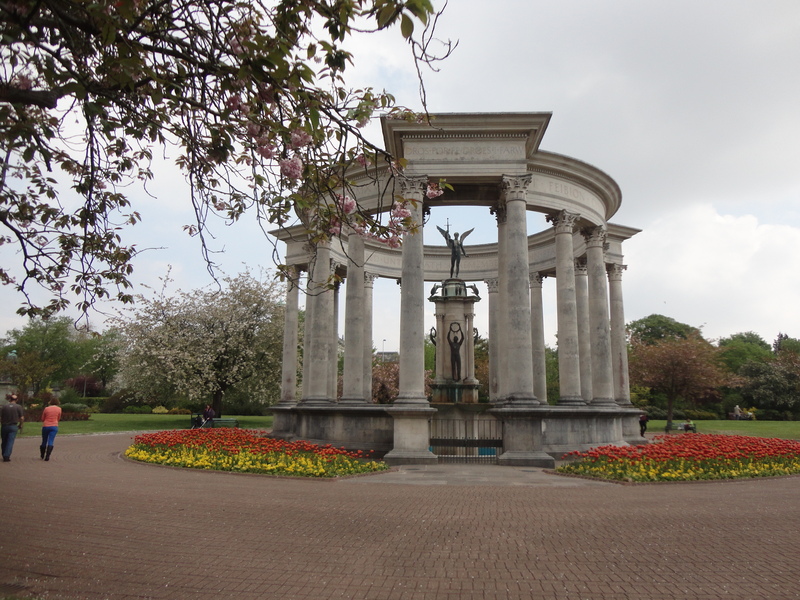 The Centenary Walk takes in some of Cardiff’s most celebrated and historic landmarks, as well as some well-kept secrets. The walk began at The Old Library, just near Howells. 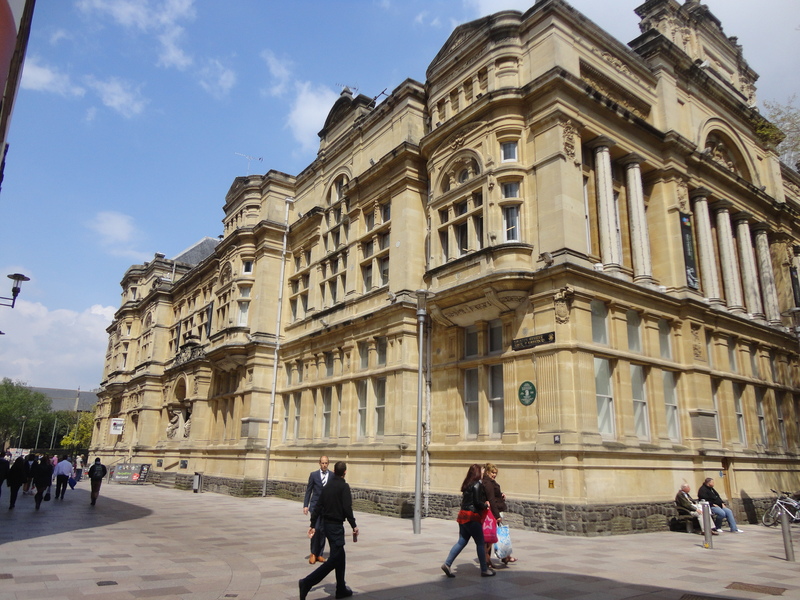 This building opened in 1882 as a “Free Library, Museum and School of Arts”. The Welsh inscription high up on the south end of the building means, “He will not be wise who will not read”. 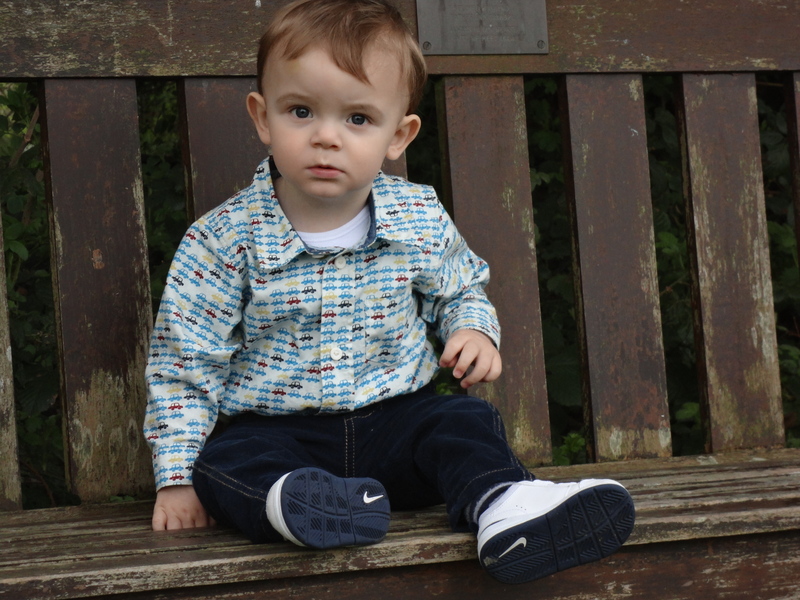 Alfie…. take note! As I looked back at the building from the next stopping point I noticed that the building isn’t quite symmetrical. Part of it was demolished to allow the road to be widened for traffic. 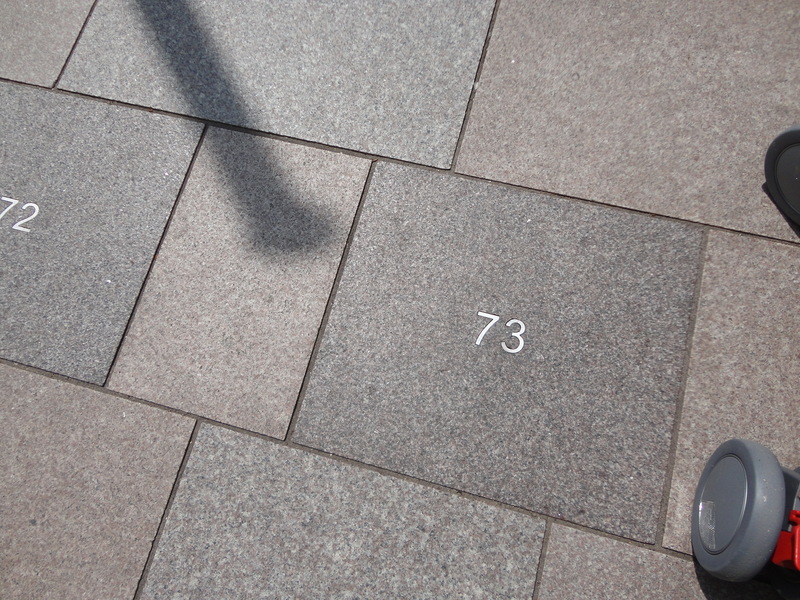 We walked through St John’s churchyard next and as you walk along the churchyard path you can see the brass numbers on the pavement, which mark family burial plots. I always thought this was spooky when I was a kid and we always jumped over them, thinking it was bad luck to step on a number. St John’s Church is where my dad and mum got married just after the war. 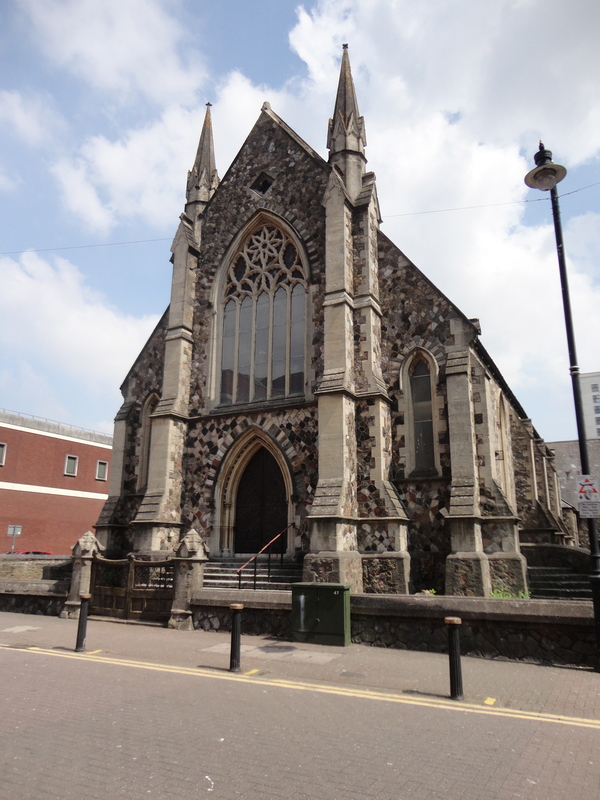 This is the oldest church in the city centre and apart from parts of Cardiff Castle is said to be the oldest building in Cardiff still in constant use. It was founded at the end of the 12th century and rebuilt in the perpendicular style in the 15th century. 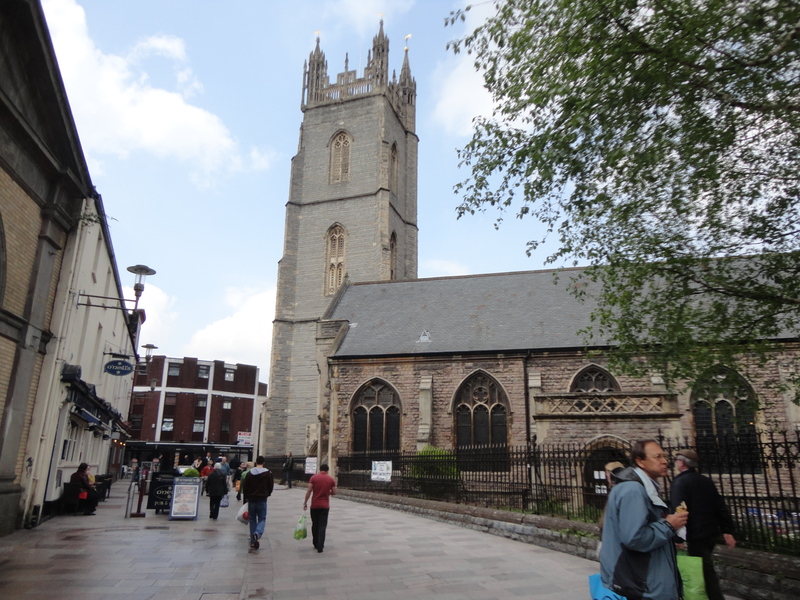 After the 1607 floods, which destroyed the original parish church of St Mary’s, St John’s became the town’s principal church. From here we walked to Cardiff market. The Market was built by Solomon Andrews, a local entrepreneur, and became known as Solomon’s Temple. Ashton’s Fishmongers, just inside the entrance, was one of the original 349 traders when it opened in 1891 and it’s still my favourite even today. The market is partly on the site of the old County Jail and the gallows stood at the far end. This is where Dic Penderyn was publicly hanged on 13th August 1831 for his alleged part in the riots in Merthyr over working conditions. 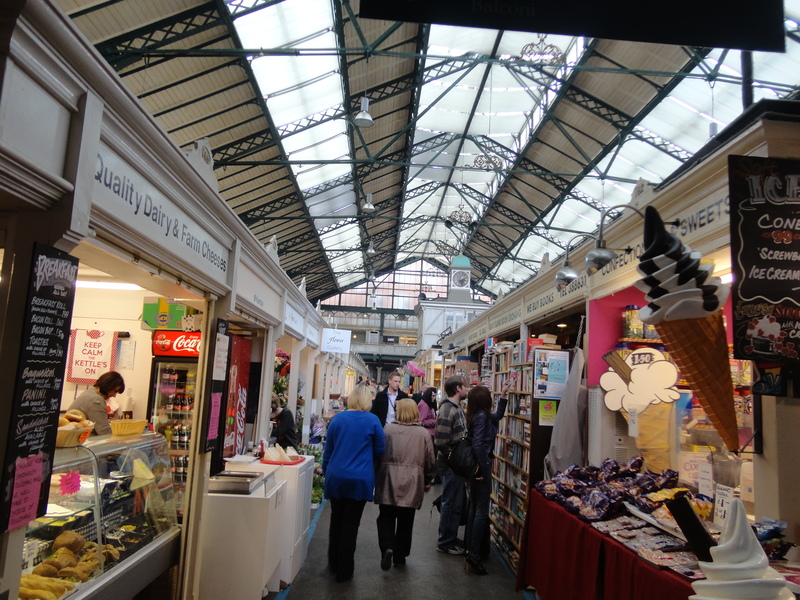 The Market has a galleried hall with cast iron and glass roof and a decorated clock tower in the centre. Some of the stalls have their original cast iron numbers. 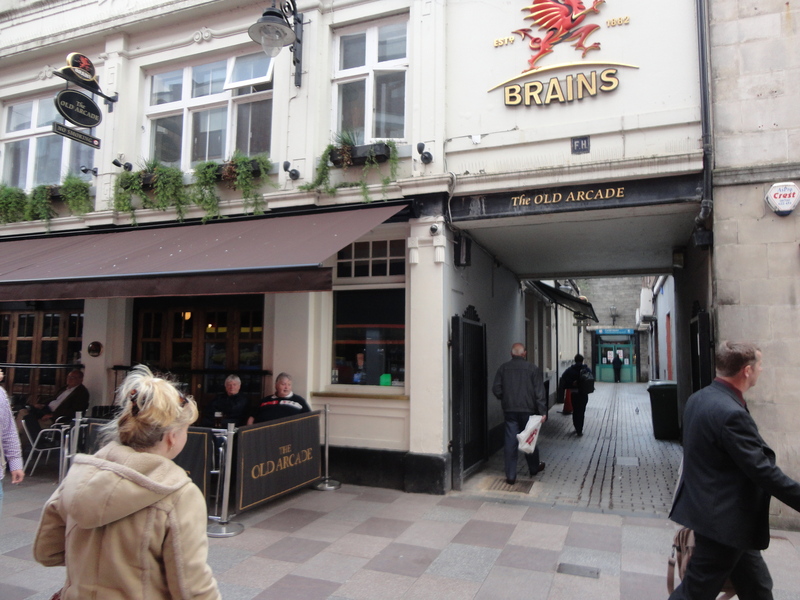 As we walked down Church Street, alongside the Old Arcade pub is an alleyway called the Old Arcade, which is one of Cardiff’s oldest arcades. The arcade and pub date from the construction of a market in 1835, which was replaced in 1891 by the present one. 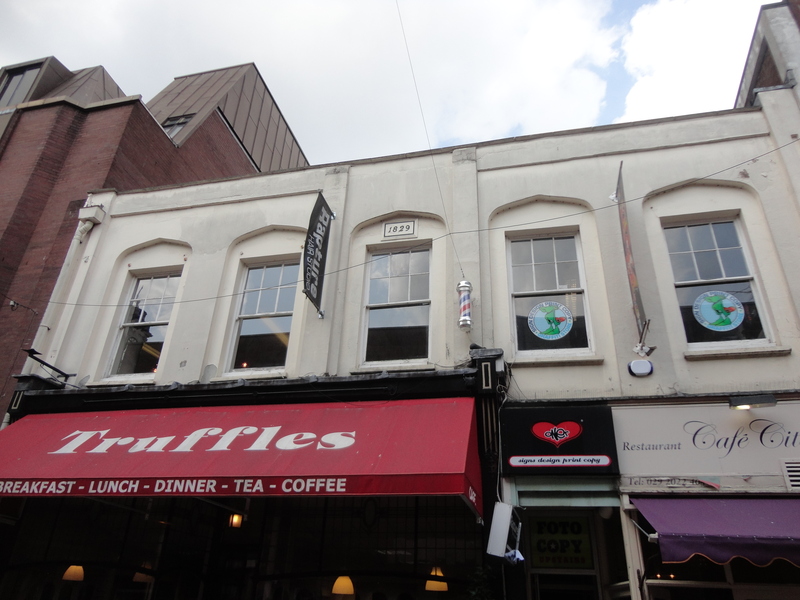 On the right, the distinctive first floor windows of the white buildings at 3 and 4 Church Street date from 1829. At the end of Church Street Alfie and I came to the junction with St Mary Street and High Street, this was the most important part of the medieval town. 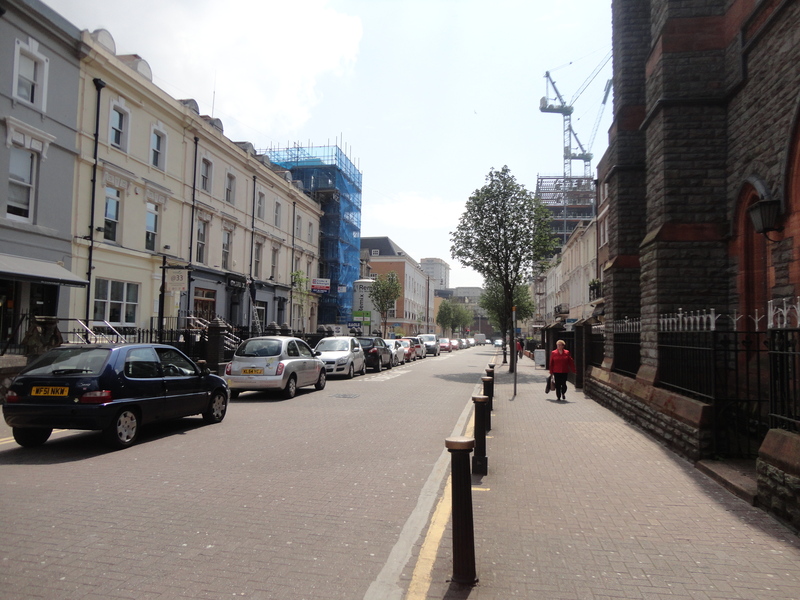 On the left is St Mary Street, named after the principal church of medieval Cardiff. 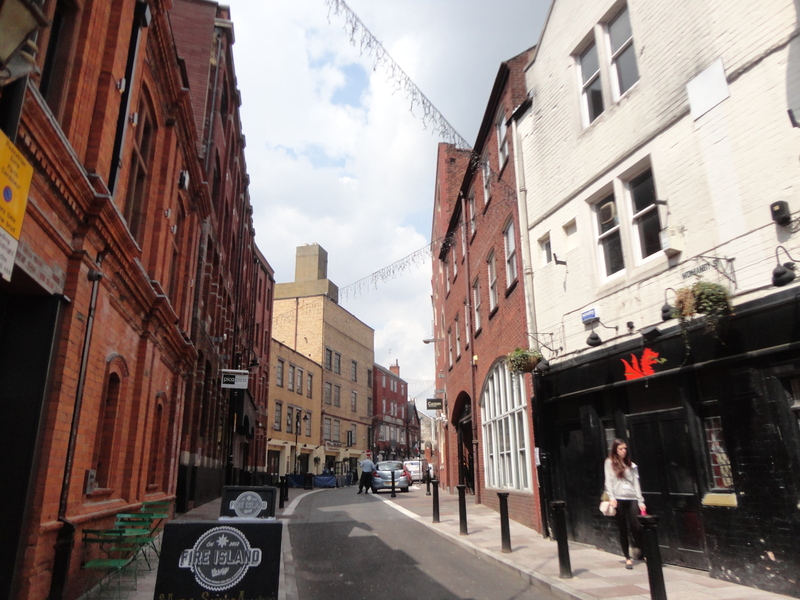 St Mary Street is an almost complete Victorian townscape, and the narrow frontages reflect the medieval burgage plots. 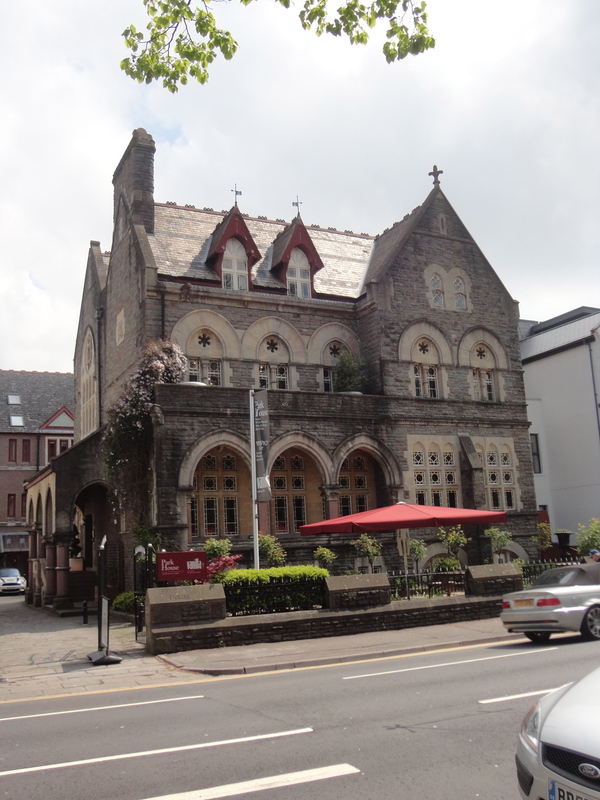 The cream-coloured building on the corner of Church Street and St Mary Street was built for the Richards family. The house was originally called The Corner House and the building represents almost the last survivor of the 18th century town. It’s a Greggs Shop today. Alfie and I were tempted but we carried on, there was a long way to go! On our right was High Street, the principal street of the medieval borough. From 1337 until the 1850s three successive guildhalls stood here until a new town hall opened in St Mary Street. The first floors of the guildhalls were used as a courtroom and a meeting place for the people running the town’s affairs, while the ground floor was used as a market. 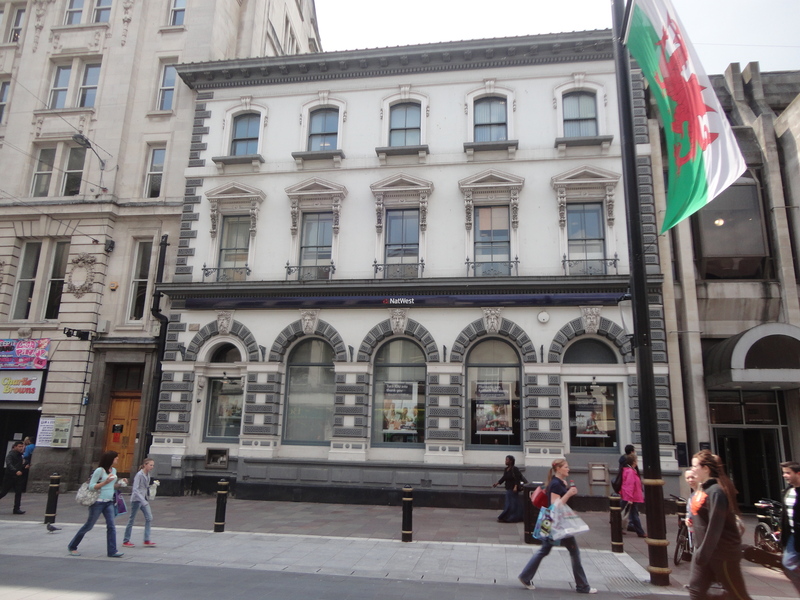 Over the road we saw the NatWest Bank, which was built in 1880 for the National Provincial Bank. It has a fine Italianate façade with an arcaded ground floor and pedimented first floor windows. We crossed the road into Quay Street. Just here is a little café where my dad and mum would often enjoy faggots and peas together. Half way down Quay Street we met Womanby Street The earliest known form of the name, from 1270, is Hundmanby – possibly meaning “the dwelling of the houndsman”. As we walked up the street a little way you can look through the archway on the right and see some old cottages. Jones Court was built in the 1830s as workers’ cottages and is now the last of the 50 or so 19th century housing courts in Cardiff. The houses had just two rooms and there was no water supply or drainage so they were perfect breeding grounds for disease. 396 Cardiffians died in a cholera outbreak in 1849. We walked on and came out near the Angel Hotel. Rugby fans around the world know the Angel Hotel, because it’s so close to the home of Welsh rugby it became the traditional place to congregate before international matches. 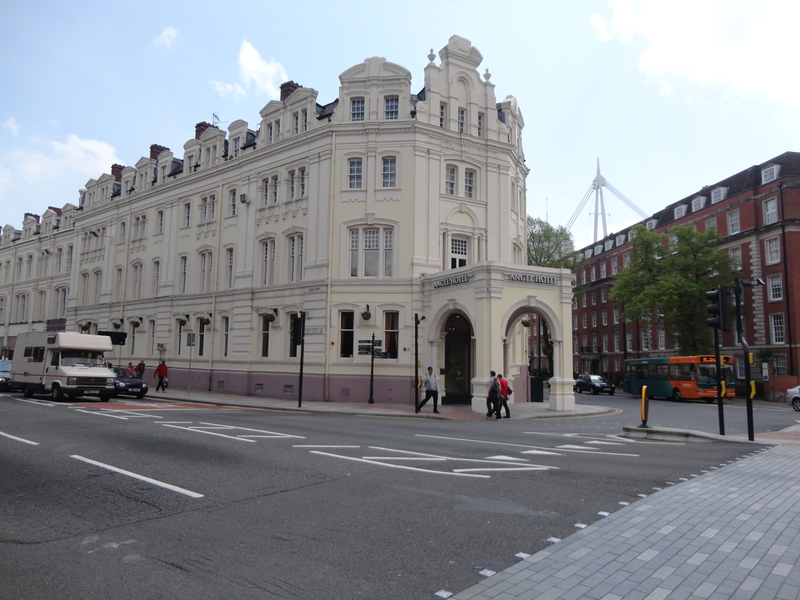 Next to the Angel Hotel, just across Westgate Street is the Millennium Stadium. Westgate Street runs along what was the course of the River Taff. The great 19th century engineer Isambard Kingdom Brunel was building his Great Western Railway westwards but the long curve of the river made a rail crossing difficult. So with the agreement of the Bute family, who owned the land, work began to divert the river in 1849 so that a short railway bridge could be built. That bridge still stands today. 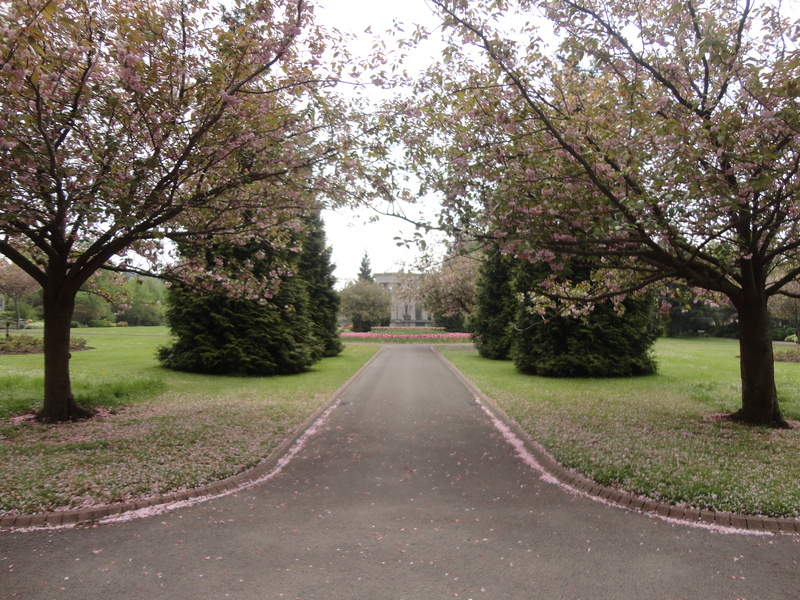 This left a huge area of reclaimed land, which the 3rd Marquess of Bute allowed to be used for sport. 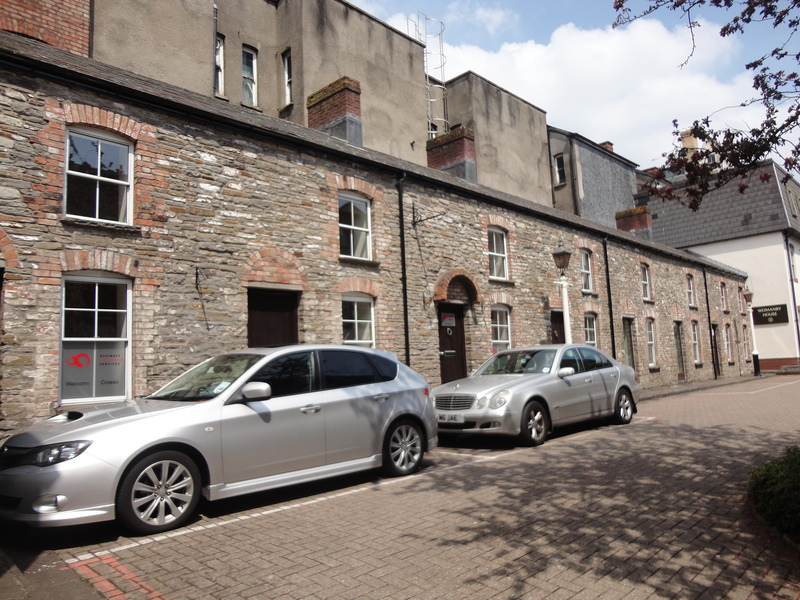 The area was originally called the Great Park but became known as Cardiff Arms Park, after a nearby coaching inn. The Millennium Stadium was built on the site of the former Cardiff Arms Park stadium in time to stage the 1999 Rugby World Cup Final, although the pitch was turned around by 45 degrees. It is now one of the most famous stadia in the world. It is the home of Welsh rugby union and many of the national football team’s matches are played here too. Among the Stadium’s unusual features are a retractable roof, which takes about 20 minutes to open or close, and a removable pitch which means the Stadium can stage all sorts of other events, such as speedway, concerts and exhibitions, whatever the weather. 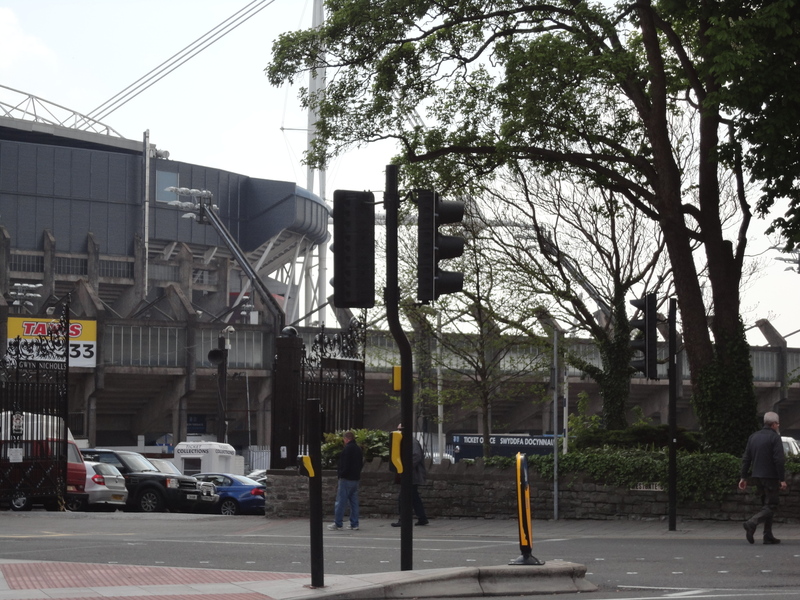 On the other end of Westgate Street you can see the stands of today’s Cardiff Arms Park stadium, which dates from 1967. Until then there was only one stadium here, which was shared by Cardiff Rugby Football Club and the Welsh Rugby Union (WRU). Today the smaller ground is the home of Cardiff RFC and the Cardiff Blues. In the early 1930s the WRU built a new stand, possibly without consulting the 4th Marquess of Bute. It’s said that he was so angry that his view from the Castle to Penarth was blocked that he built the flats on Westgate Street in order to spoil the eastern aspect of the stadium. The stand was bombed during World War Two but the stadium was rebuilt and the view to Penarth was gone for good. Alfie and I then headed across the road towards the Castle. 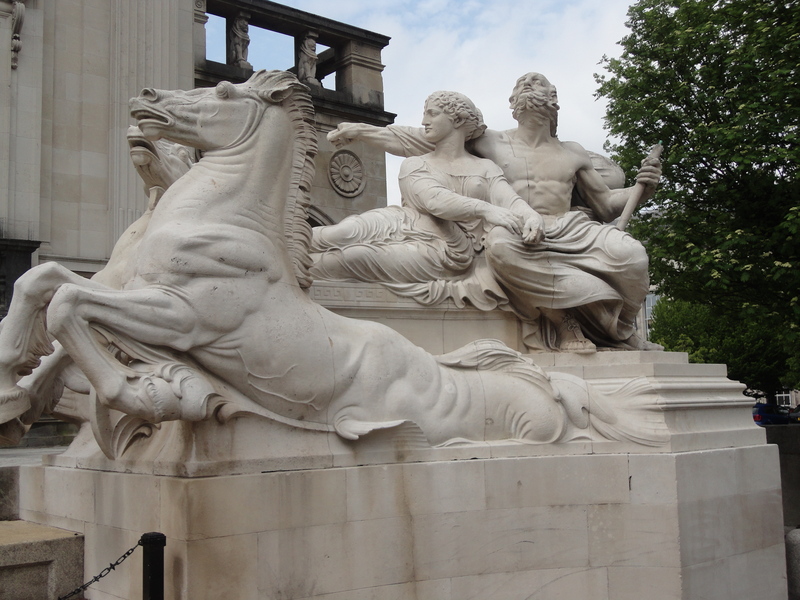 The wall opposite has got several hand-carved stone animals perched on it – not all indigenous to Cardiff! At the end of the wall we could see the site of the West Gate of the old town wall. Owain Glyndwr, who led a famous Welsh revolt against the English Crown, broke through here with his troops to capture the Castle in 1404. 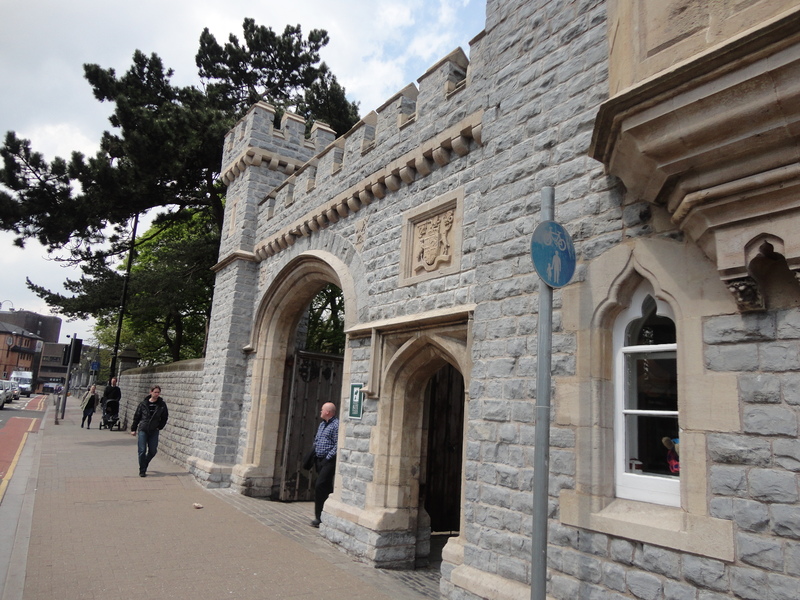 The West Gate and the bridge over the moat were restored to their original design by the Marquess of Bute in 1921. 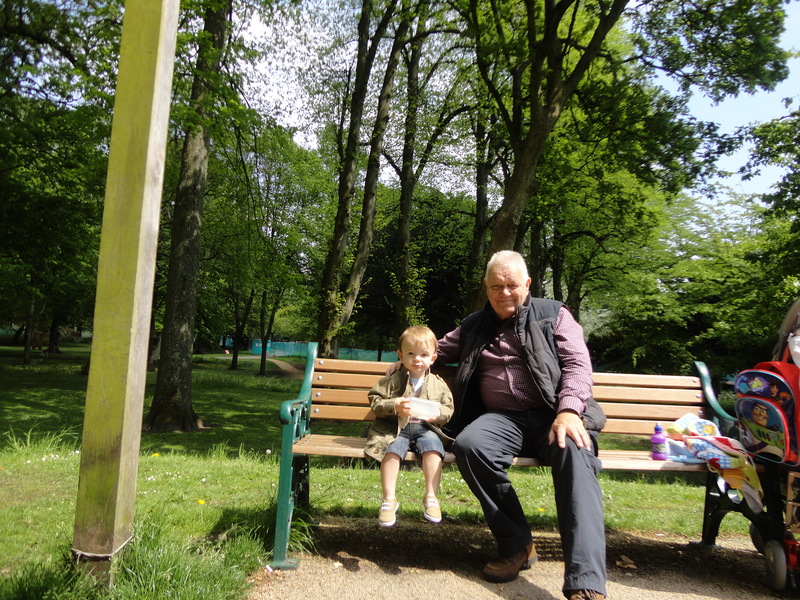 Alfie let me know it was time for lunch so we went through the old West gate and into Bute Park for our lunch. 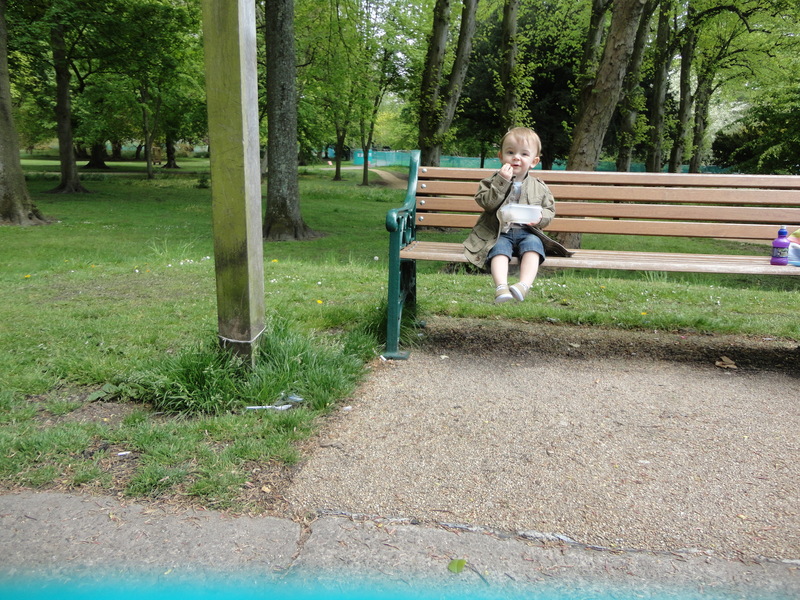 We found a bench and Alfie and I enjoyed a great little picnic. Countless people smiled at us as they walked by, Alfie has this wonderful way of engaging with people. I am sure the folk who passed by were just returning Alfie’s smiles. The bench we sat on was near the Waterbus stop, we could have caught Waterbus back to The Bay… that was tempting but we still had a lot of the Centenary Walk to complete. We set off again after a charming little break and were soon passing The Castle Arcade. 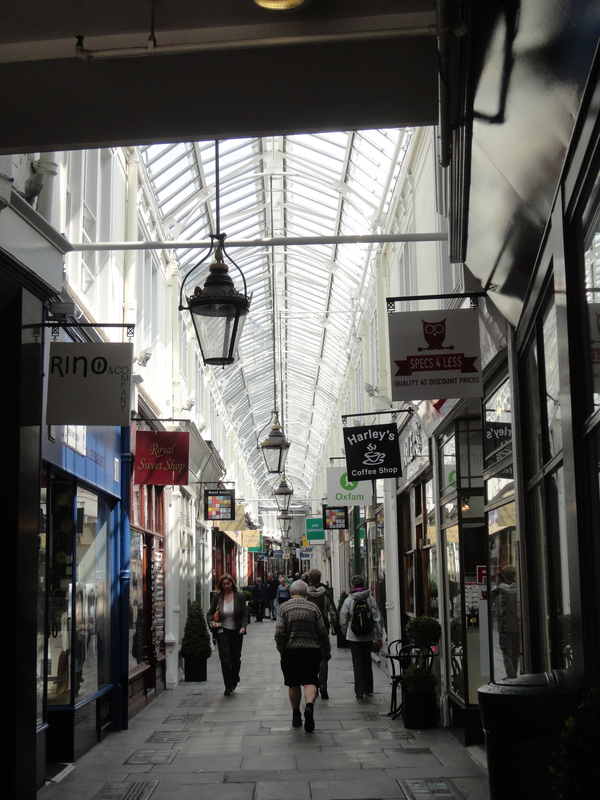 The six Victorian and Edwardian arcades are one of Cardiff’s most attractive and distinctive features. 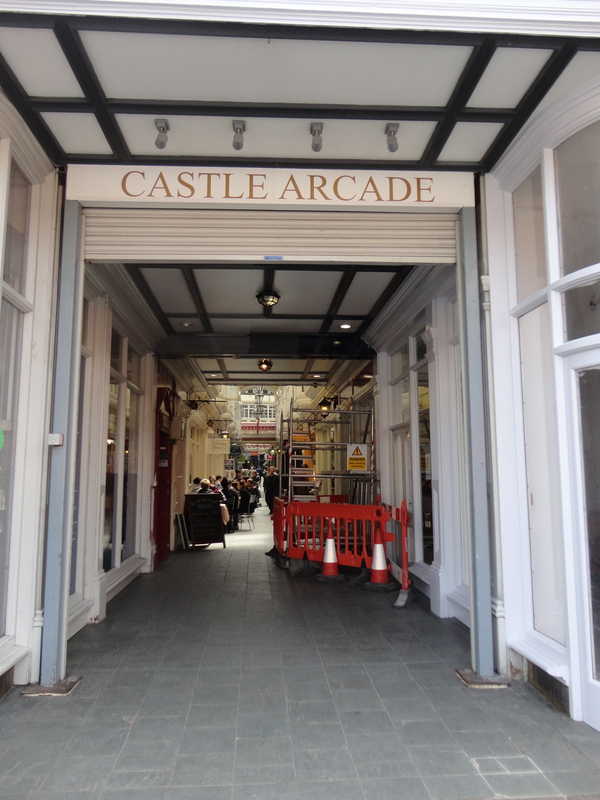 Castle Arcade was built around 1887 and if you go inside you can see a beautiful wooden gallery with a wooden second floor overhang and foot bridges. Next we came to the Castle and I looked down and noticed Alfie had dropped off to sleep. I would have to continue the walk on my own. It was a tough ask! 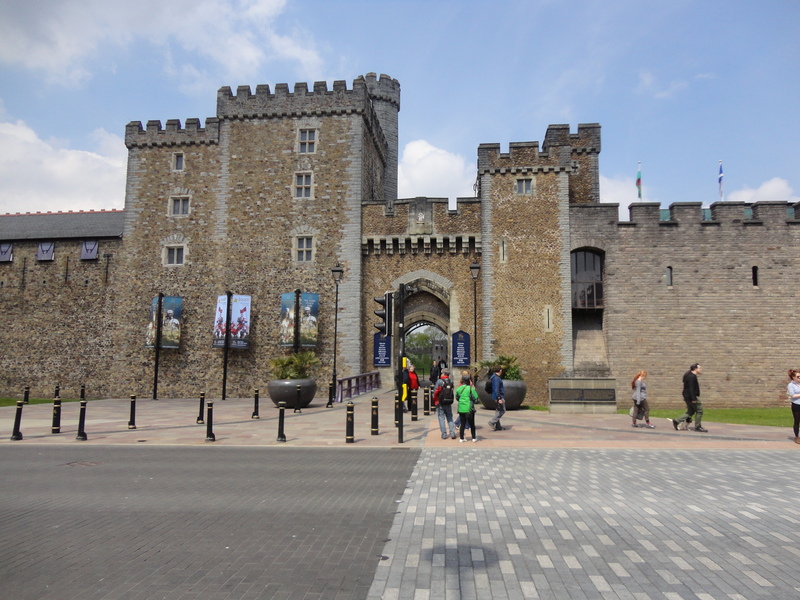 Cardiff Castle has a long history dating back to the Romans – below the red stones you can see the original Roman wall, which was discovered during building work in 1889. The Normans built a Keep within the Roman site, which has also been associated with Owain Glyndwr and the Earl of Warwick. In the 19th century the architect William Burges restored the main Castle apartments for the 3rd Marquess of Bute. The Castle grounds are a haven of tranquility in the city centre and the Norman Keep offers spectacular views of the city. This site of one of the most impressive civic centres in Britain. The origins of the name Cathays are not clear. 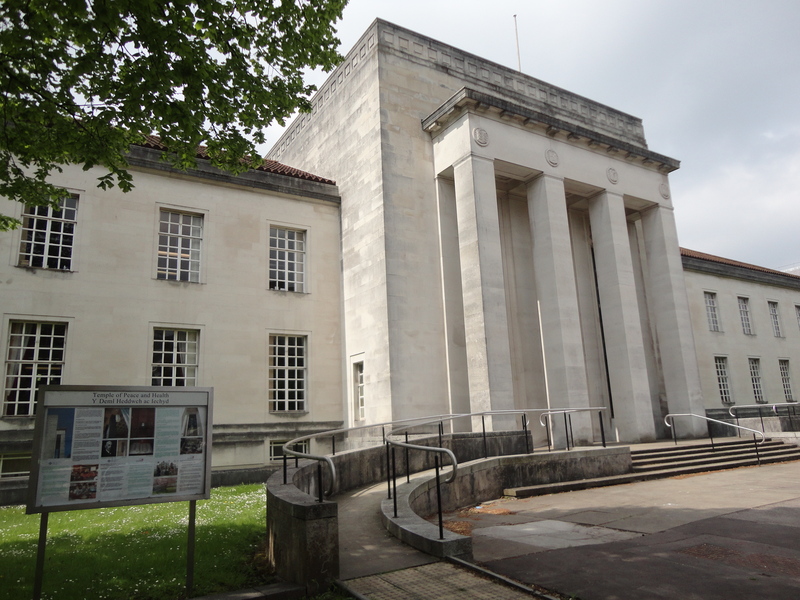 The City Hall was designed by architects Lanchester, Stewart and Rickards this is the flagship building of the civic centre. 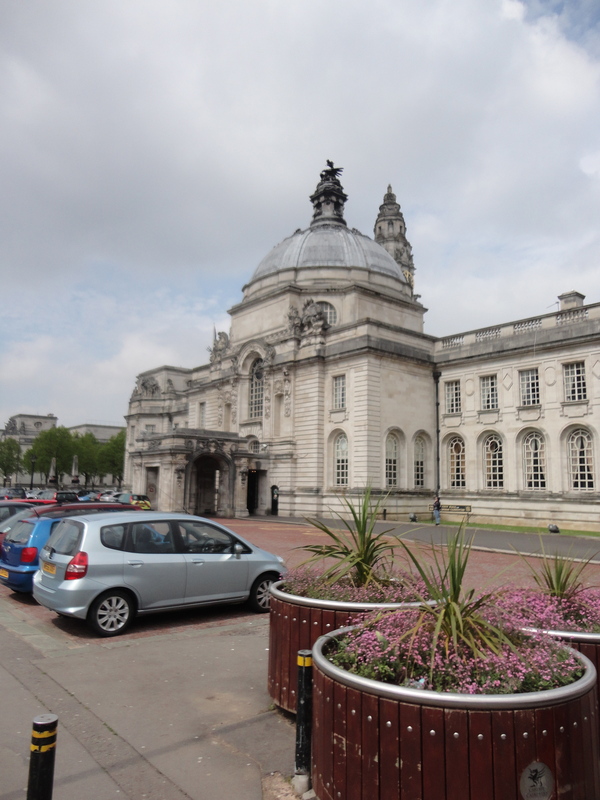 It cost £129,000 to build and was opened in 1906 following the granting of city status to Cardiff the previous year. 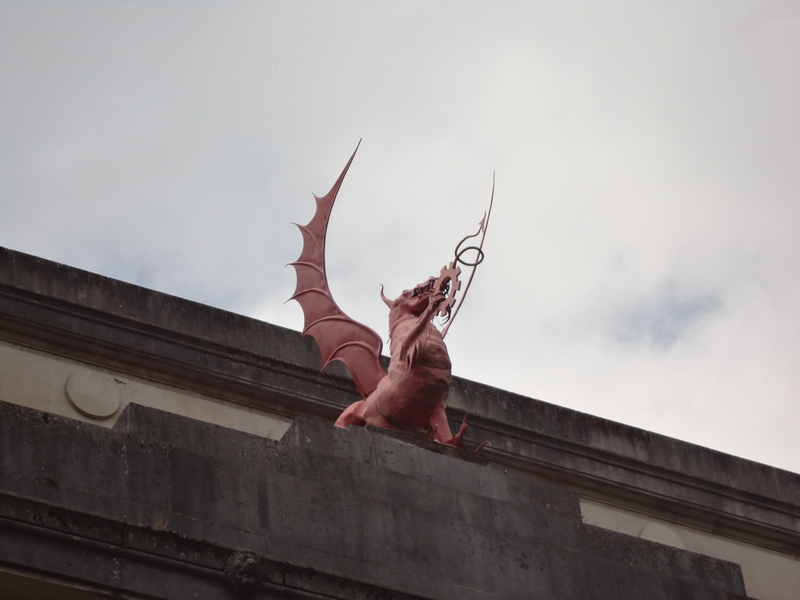 The clock tower rises 60 metres, and at the top of the dome is a Welsh dragon. The interior of this building is splendid with the imposing Marble Hall connecting the domed Council Chamber and ornate Assembly Rooms. The Hall houses marble statues of 11 heroes of Wales. 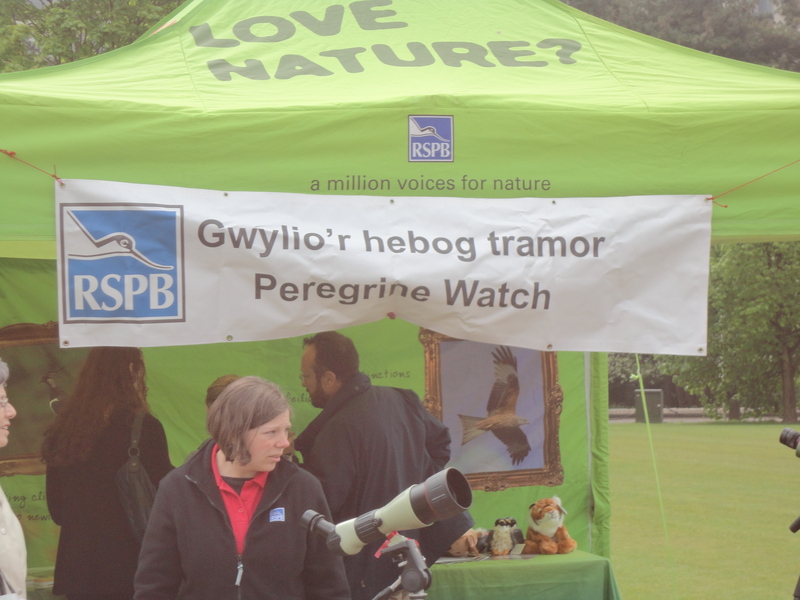 As we got to the City hall we noticed little tent with two telescopes. Apparently there is a Peregrine Falcon’s nest with three chicks. A peregrine is the fastest bird in the world in flight! 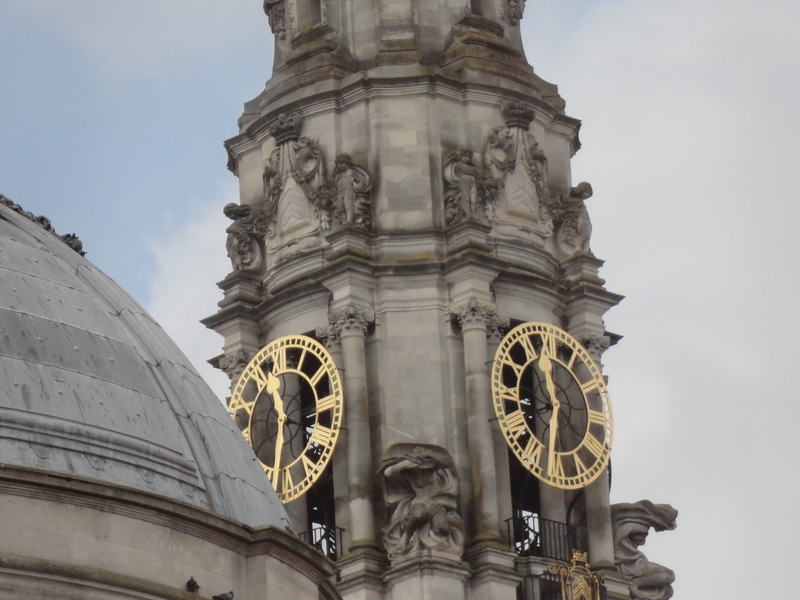 It was great to look through the telescope and see the nest high up near one of the four clock faces. I pushed on to the Law Courts. The Law Courts were completed in 1904 at a cost of £96,000. 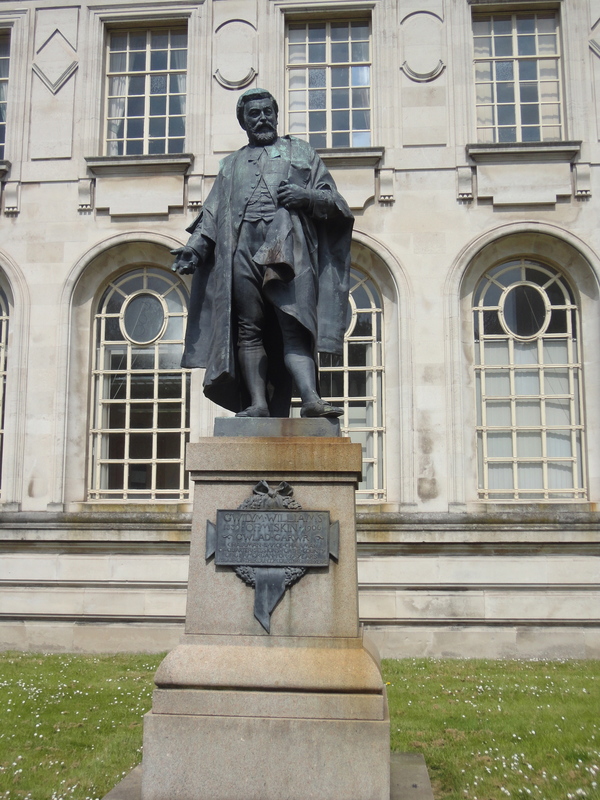 The statue of Judge Gwilym Williams, “terror to malefactors”, is by Sir W Goscombe John (1860-1952), whose work can be seen across the city. There are obelisk-style lamp stands around the Law Courts building. 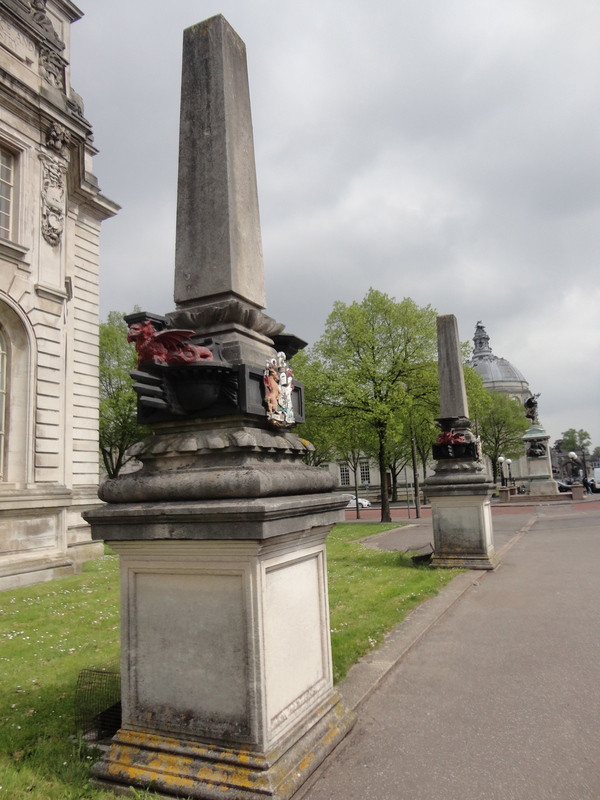 They were really interesting listed structures with griffin and wyvern figureheads on ships’ prows, each bearing Cardiff’s coat of arms. They are believed to have been designed and built as part of the Law Courts’ development. The University of Wales Registry was next door. 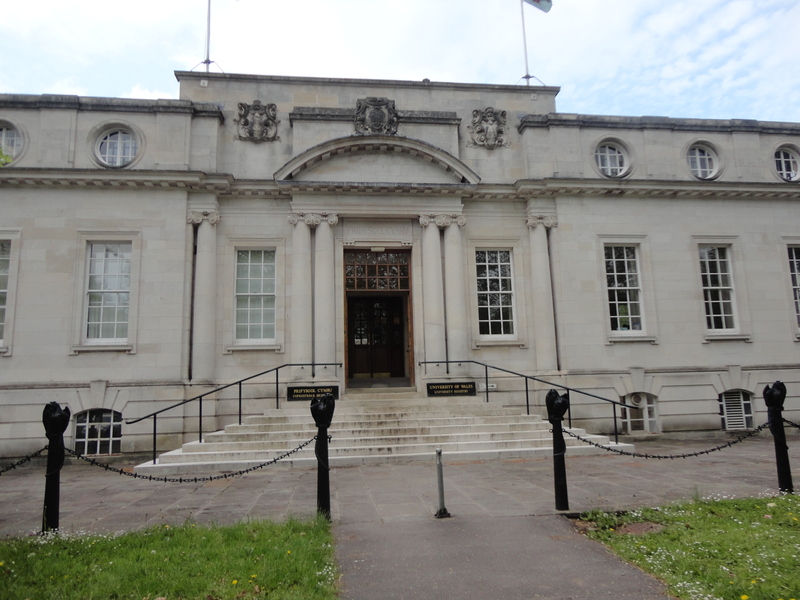 Next door again was the Glamorganshire County Council building, which was created in 1888 and this building opened as its headquarters in 1912. 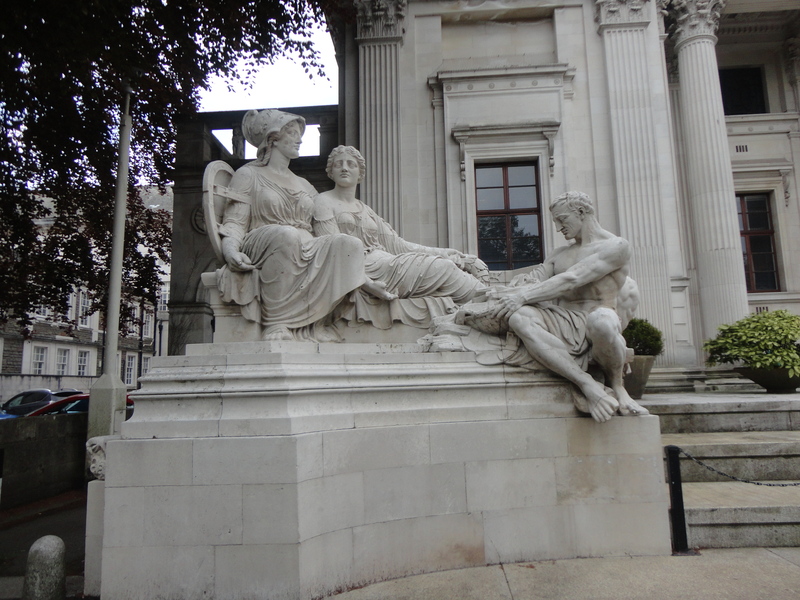 There are two sculptured groups in front of the entrance representing Mining (Minerva with miners) and Navigation (represented by Neptune in a chariot), which were both so essential to building the economy of South Wales. 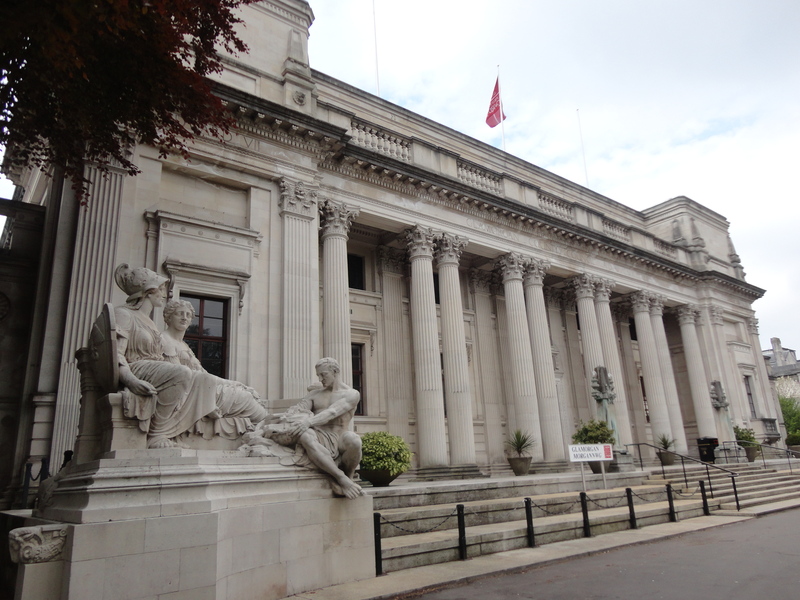 Today the building is part of Cardiff University. 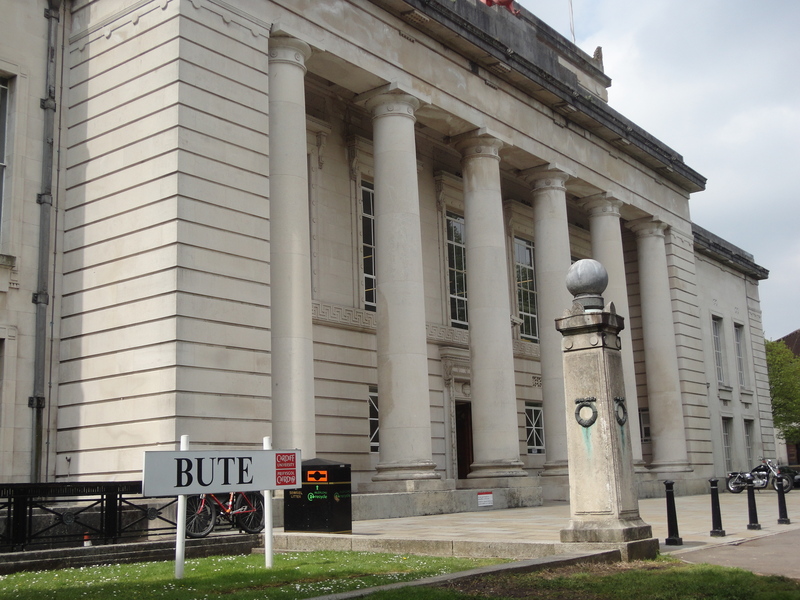 The next building up is the Bute Building. 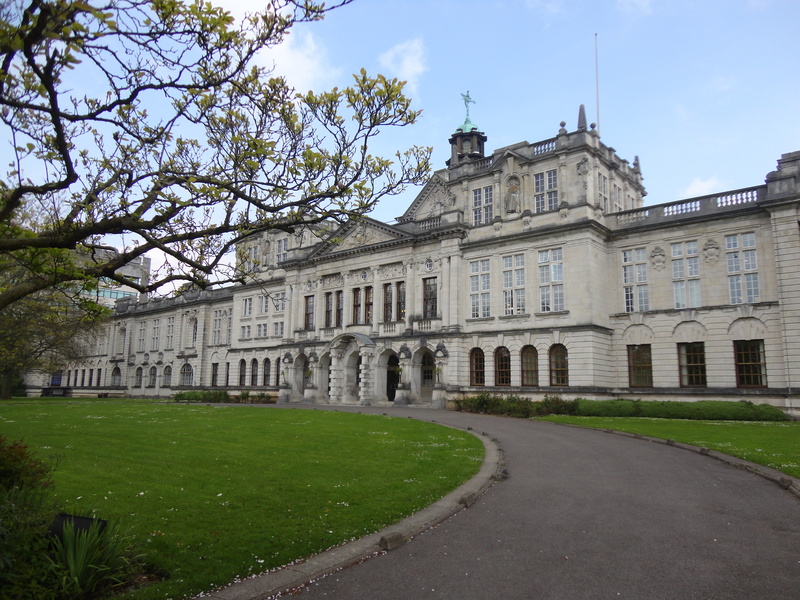 This building opened in 1916 as a Technical College, and is now part of Cardiff University. 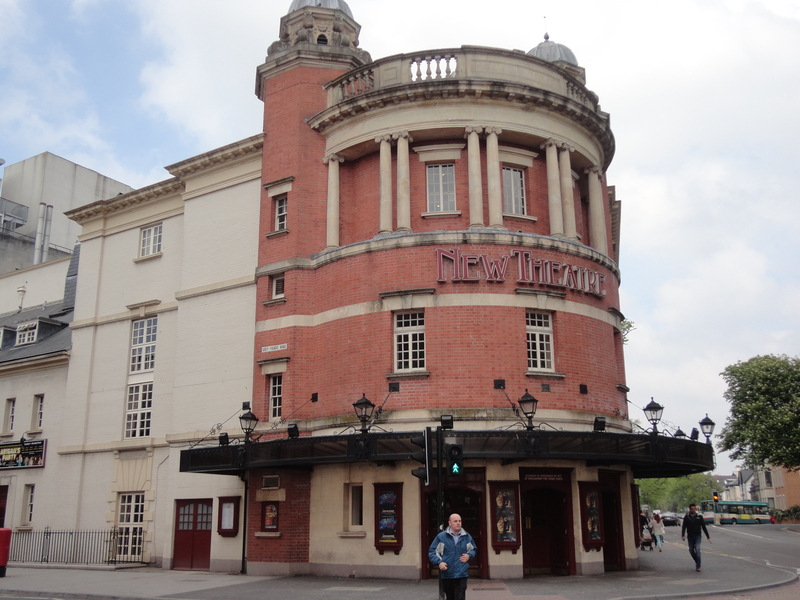 It’s in the form of a hollow rectangle, and the main façade is neo-Greek in style with a portico of Doric columns. The red dragon was installed in 1985. The next building is The Welsh National Temple of Peace and Health, which opened in 1938. 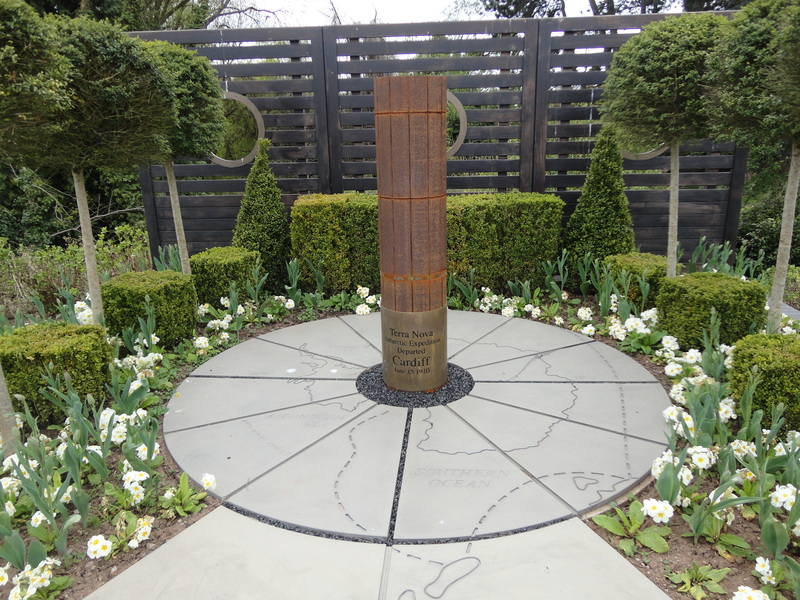 It was a gift from the great benefactor Lord David Davies of Llandinam to the Welsh people and dedicated to the memory of the loss of life in the First World War. 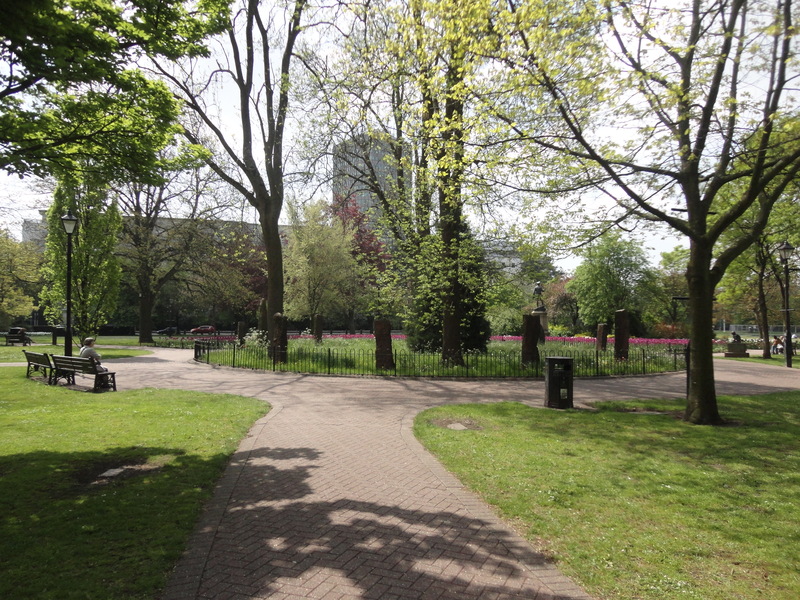 Next I crossed the road and went into Alexandra Gardens. 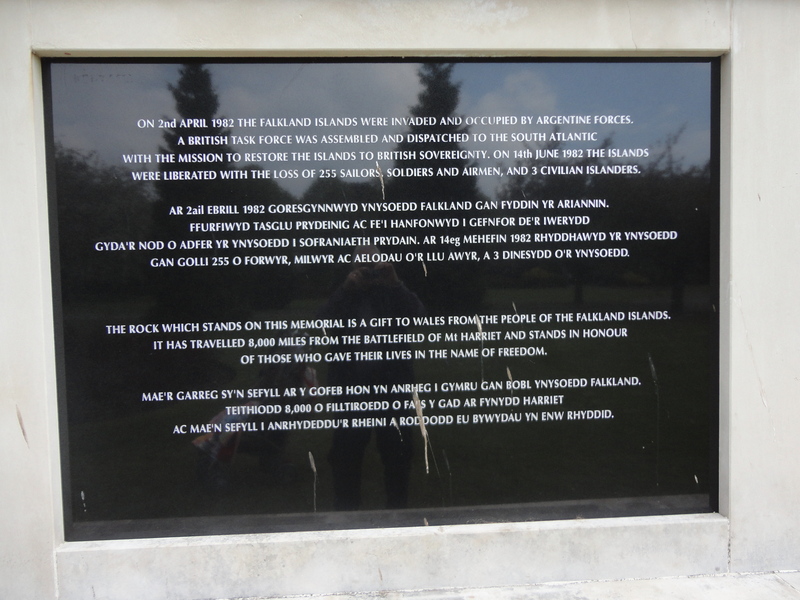 Alfie and I found the Falklands Memorial is set among six blue cedar trees, planted in memory of six Cardiff men killed in action in the 1982 Falklands Campaign. 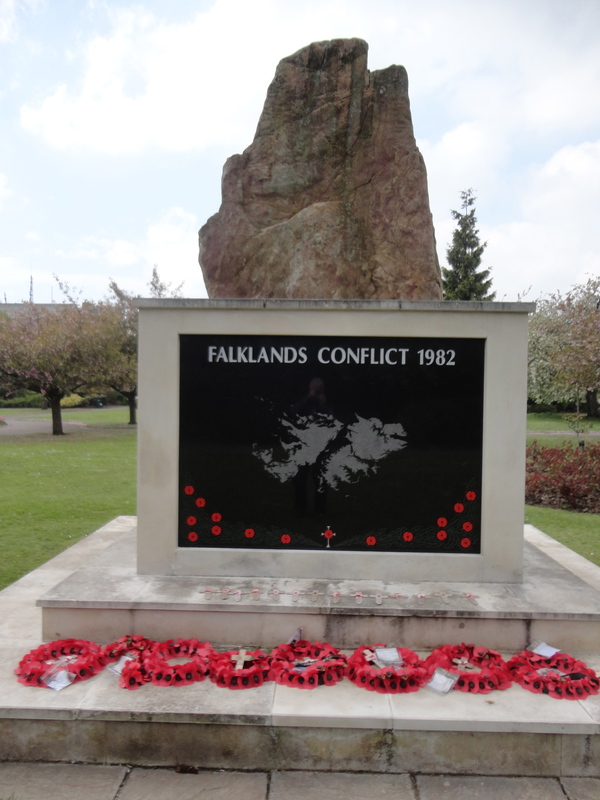 My dad came here every year on Remembrance Sunday; I never once came with him, which I really regret now. Sometimes I wish I could turn back time! Across the road is The University College of South Wales and Monmouthshire, which was formally opened in 1883 with 102 students enrolled, 15 of whom were women. In 1909 the College moved into this building, which was later extended. It is an imposing building, however some contemporary architects questioned its aesthetic quality. Next we strolled down to The National Museum of Wales. 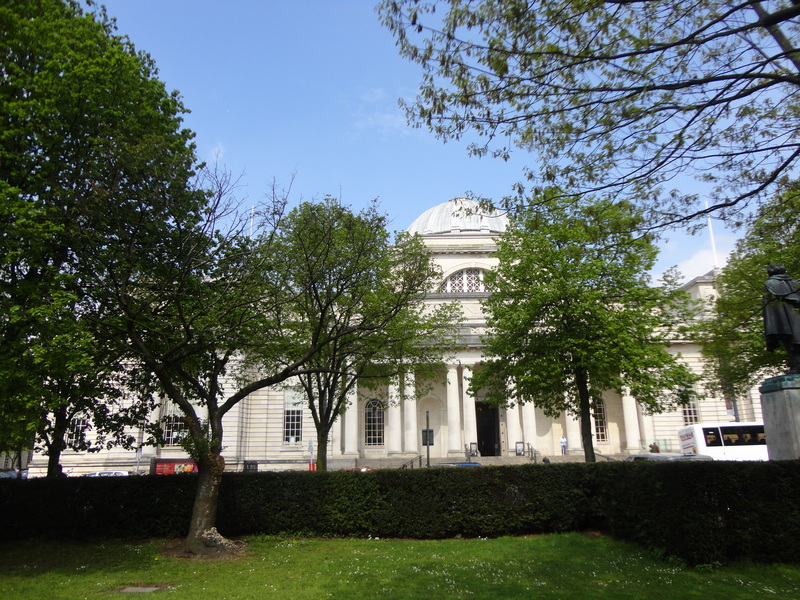 Cardiff faced stiff competition from Aberystwyth, Swansea and Caernarfon to be the home of the National Museum of Wales. 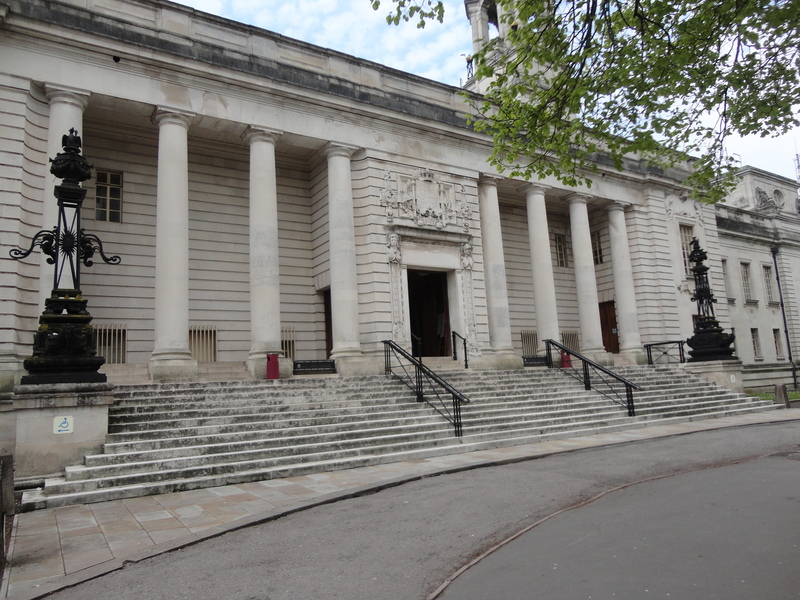 Cardiff offered this site, along with financial support, and in June 1905 the National Museum of Wales was awarded to Cardiff (the National Library went to Aberystwyth). King George V laid the foundation stone in 1912 and after delays caused by the First World War, the same King finally opened the Museum in 1927. Extensions to the eastern side of the building were opened in 1932. The building was very well received, particularly the impressive entrance with its Doric style and massive bronze doors. The building houses one of the world’s most exquisite collections of Impressionist art, as well as natural science galleries. Opposite the Museum steps is a statue of former Prime Minister David Lloyd George, by Rizzello. 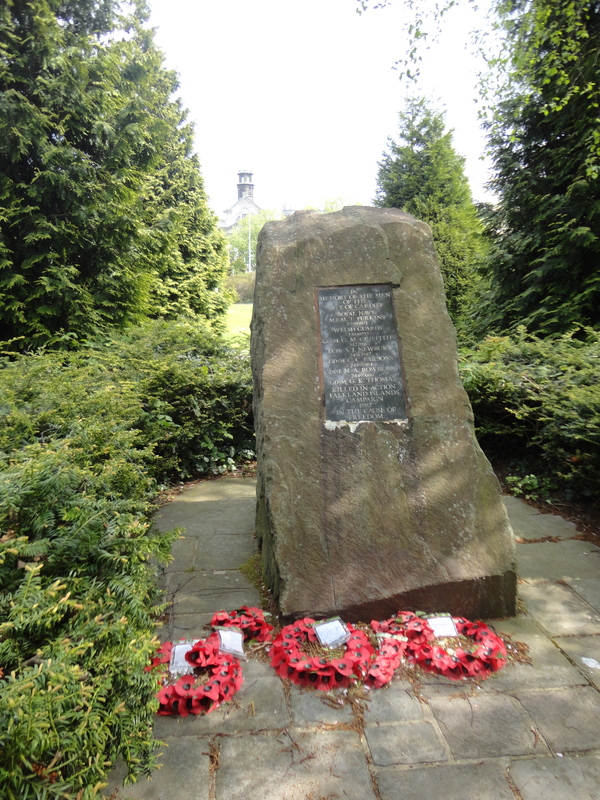 It was erected in 1960 as a memorial to one of the greatest international statesmen to come from Wales. 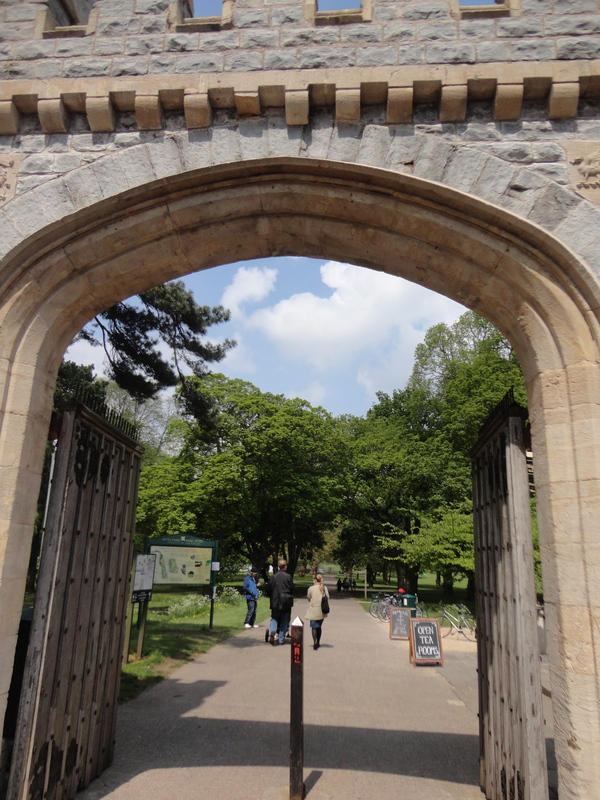 Now we headed into Gorsedd Gardens. 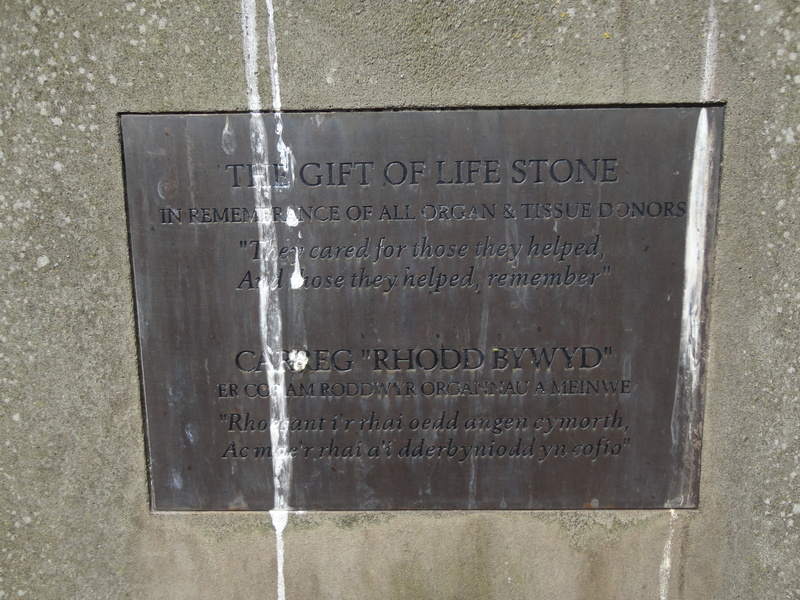 The circle of stones is the Gorsedd circle, which had been erected elsewhere to proclaim the 1899 National Eisteddfod and moved here in 1905. Opposite the Gardens is one of the most important 19th century townhouses in Wales, which revolutionised Cardiff’s domestic architecture. Park House was designed in French Gothic style by William Burges and built in the 1870s for John McConnochie, engineer of Cardiff’s docks. Burges’ influence can be seen across the city, from the Castle through to residential properties in the suburbs. We were on our way to the New Theatre now and my legs were getting tired. My breakfast sub seemed a long way away!! Nearby is the Park Hotel, now part of a hotel chain. It was built in 1885 in a French Renaissance style and was the brainchild of shop owner James Howell, who insisted that commercial travellers who wanted to do business with him had to stay in the Park. 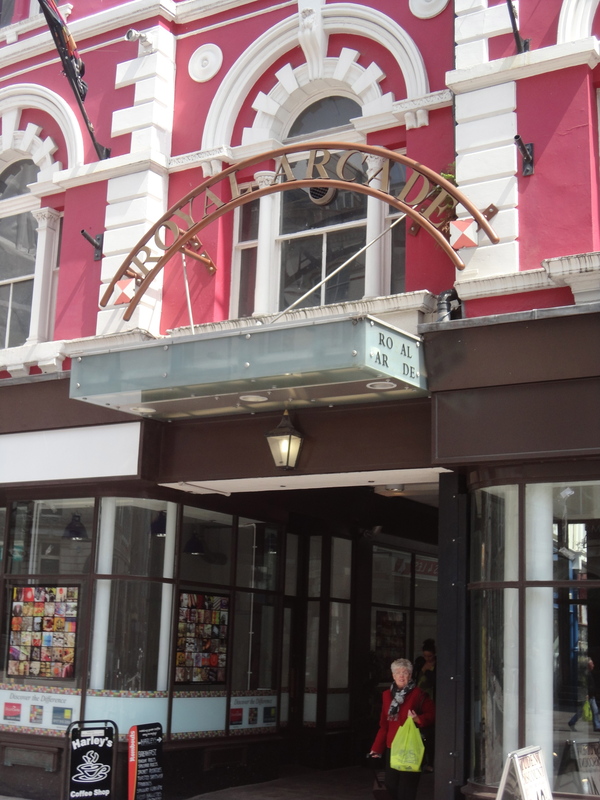 The original complex also included two public halls, a coffee house and ten shops. After this we went down Charles Street, at the side of Marks and Spencer. 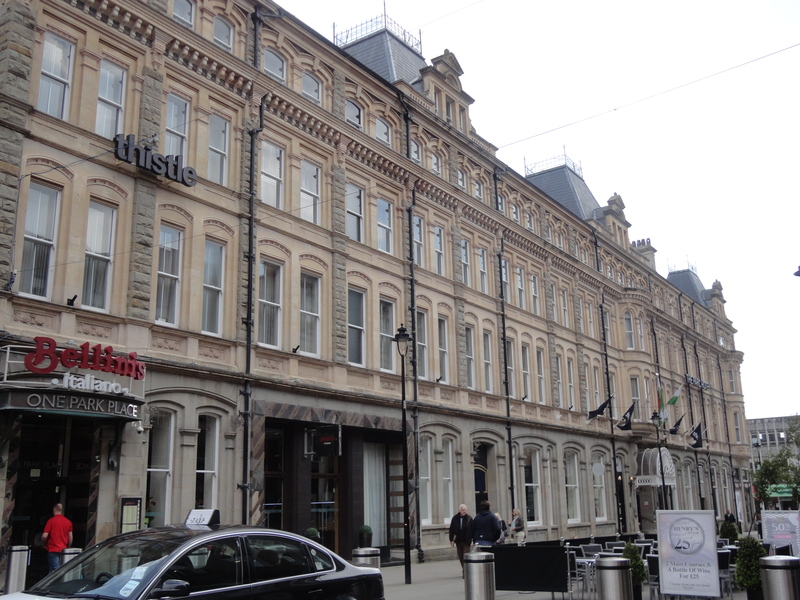 Charles Street was built from the 1850s onwards and was one of the most fashionable streets in Cardiff. Here we found a cathedral. 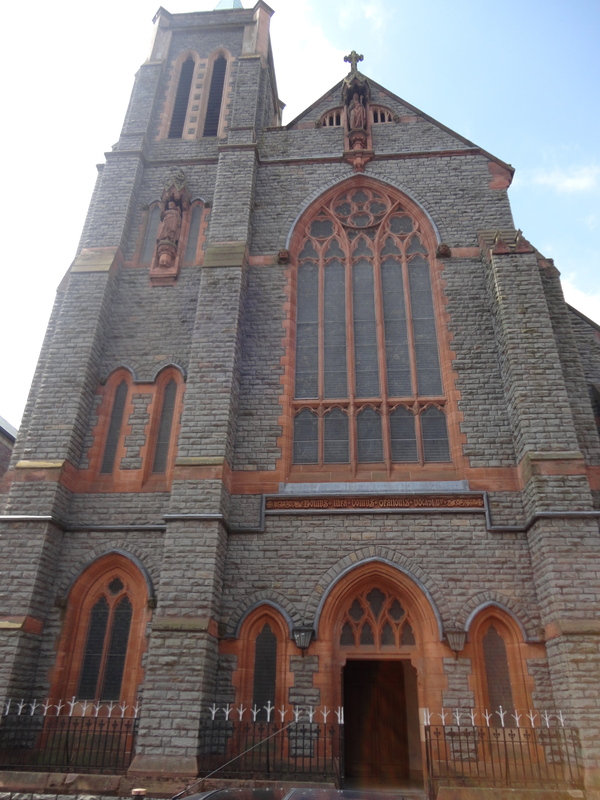 In the 19th century the number of Catholics increased dramatically with the influx of Irish immigrants who came to work in the docks and in 1888 St David’s Cathedral opened as Cardiff’s main Catholic church. It was built by the architectural firm of Pugin and Pugin in rock faced pennant sandstone dressed with red sandstone, and became a cathedral in 1916. 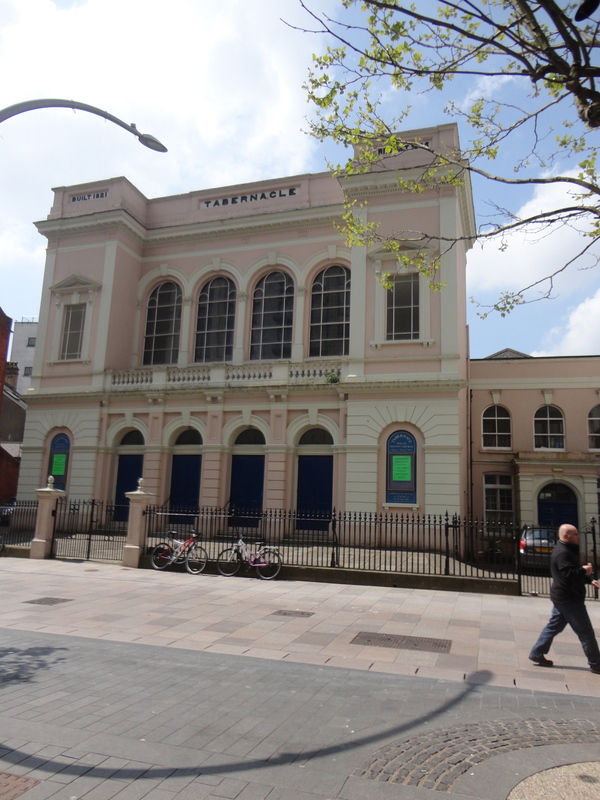 The building opposite was Ebenezer Chapel, which opened in 1855 and from1976to2011was a Welsh language chapel. The multicoloured stonework is a mix of stone from all over the world, brought back as ballast by ships returning to Cardiff. The architect, RG Thomas, is said to have written to every head of state in the world requesting a stone to place in the façade. His idea was to have a stone representing every nation as a symbol of God’s universal power. That’s a pretty cool story! After looking at the chapel we cut through to The Hayes. The building on the right hand corner opposite the statue, used to be the Fish Market. 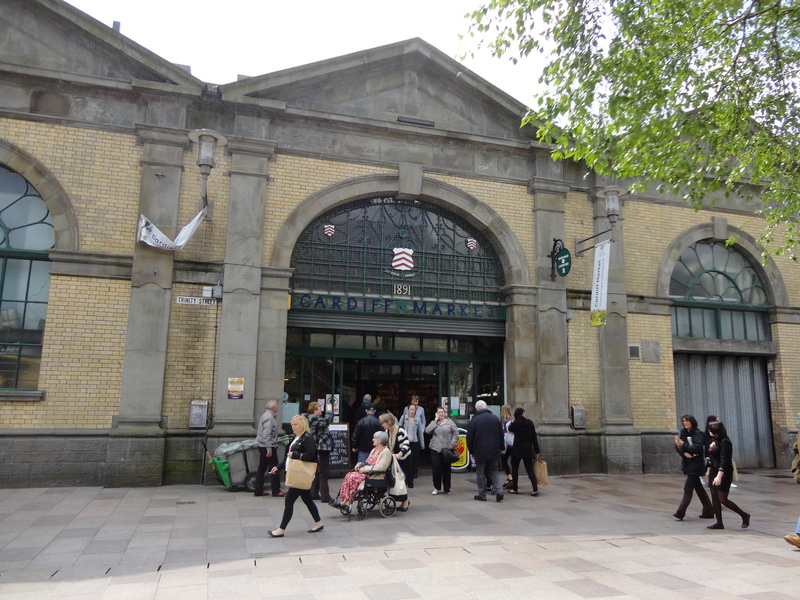 It opened in 1901 and sold fish brought in to Cardiff by the Neale and West fishing fleet. Between 1936 and 1937 it was converted into Electricity Showrooms and Offices. 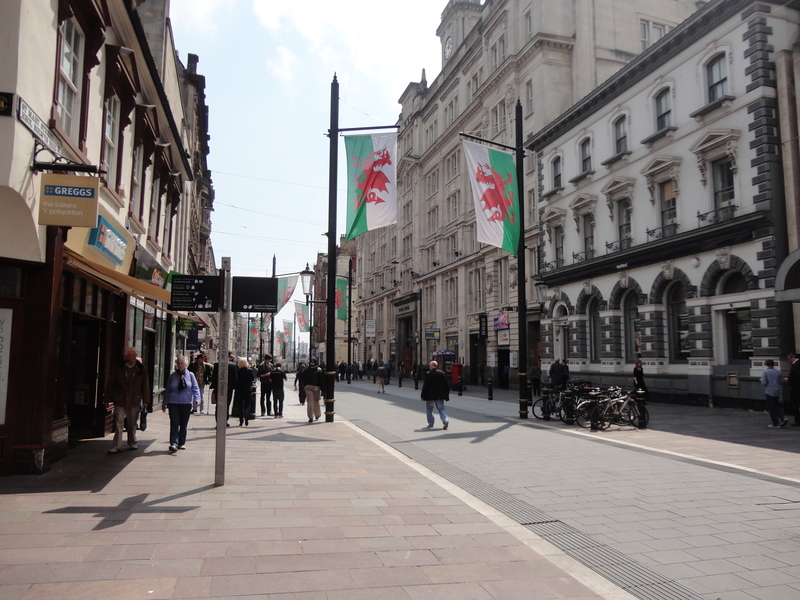 Cardiff has had an electric supply since 1894, and was one of the first municipalities to adopt electric street lighting. Outside was a statue, which always has something, happening to it, whether it be seagulls or traffic cones!. 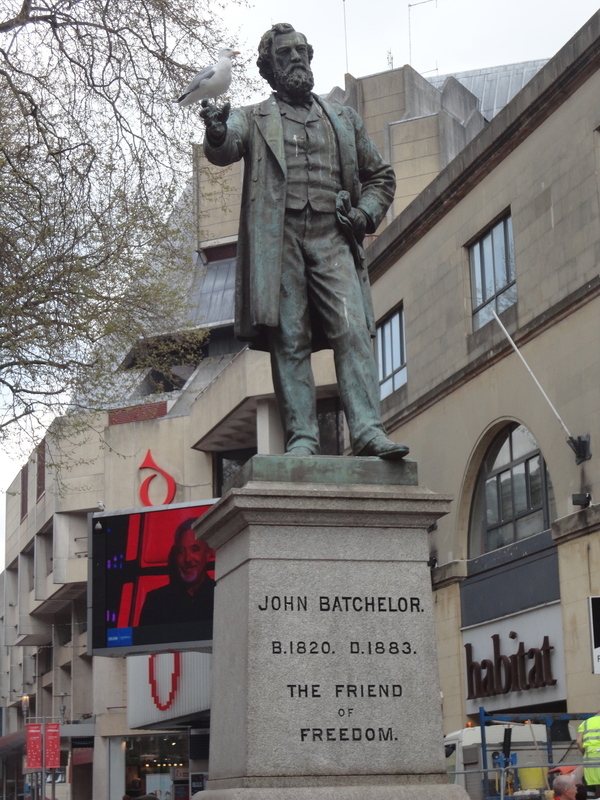 John Batchelor was a radical reformer who was Mayor of Cardiff in 1853. His achievements included a new drainage and sewerage system, which helped combat the frequent cholera outbreaks. 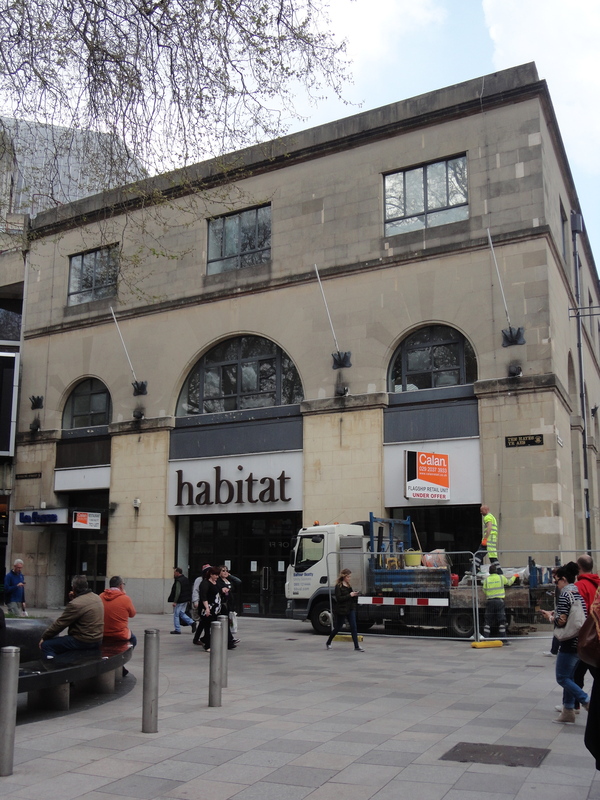 The building opposite was the David Morgan department store. David Morgan was born in Brecon, some 50 miles north of Cardiff, and opened his landmark store in 1879. He believed in no bargaining, no discounts and no sales and over the next 125 years the store gained a reputation for good value for money and quality products with exemplary customer service. 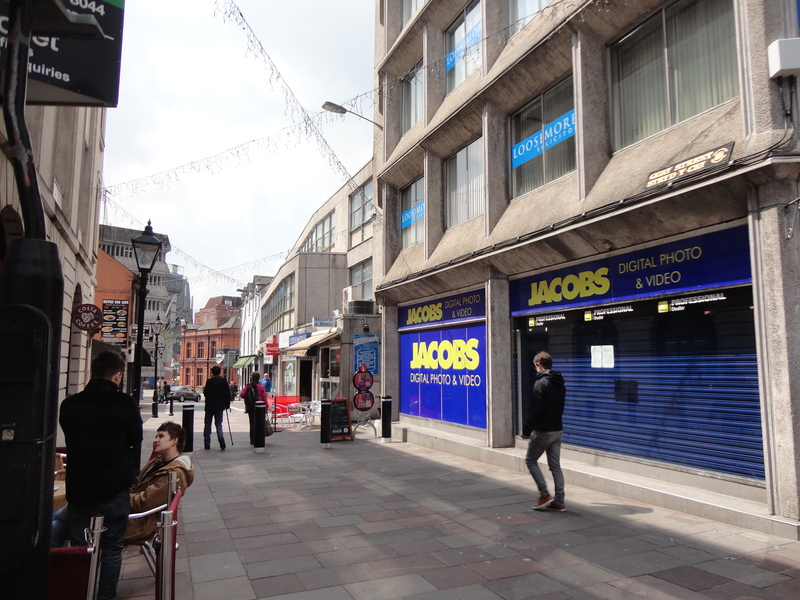 The store remained in the hands of the direct descendants of David Morgan until it closed in early 2005. The mum of the lady of the house loved to go to David Morgan’s for lunch every single time she was in Cardiff. It was a special place! 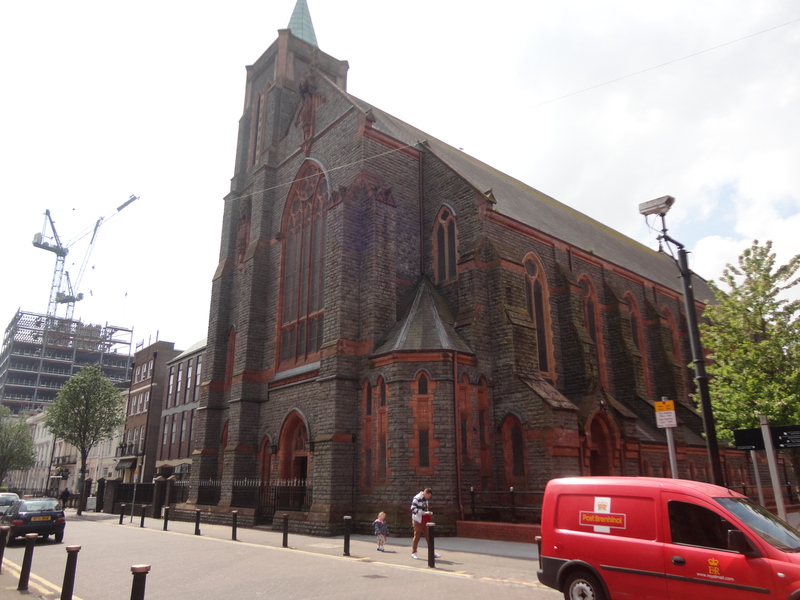 This is a Welsh language chapel, where Welsh Baptists have met since 1821. It was rebuilt in 1865 with a classical façade. The great one-eyed preacher Christmas Evans was based here 1828-32. The first television programme broadcast entirely in Welsh, a religious service, was transmitted from here on St David’s Day in 1953. The shop next door but one was Spillers Records. Founded in 1894, it specialised in phonographs, wax phonograph cylinders and shellac phonograph discs. 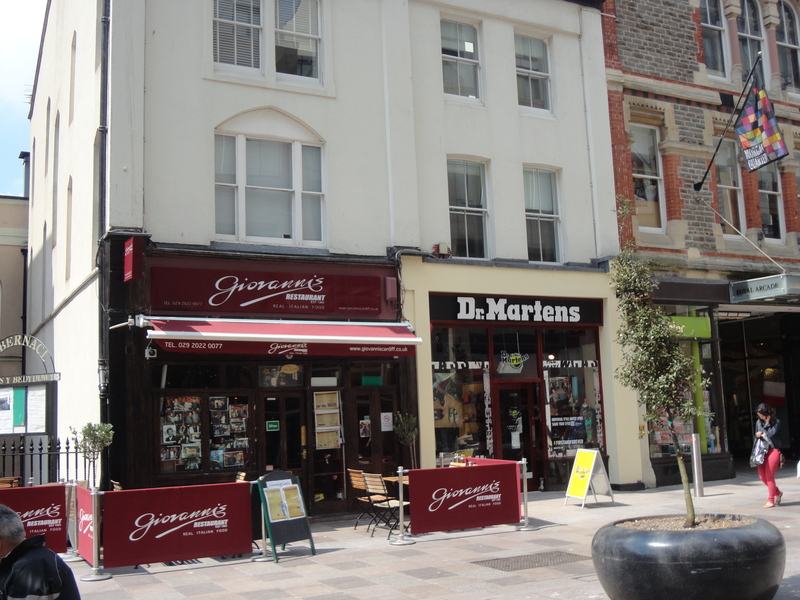 Spillers is now in the Morgan Arcade and claims to be the oldest record shop in the world. 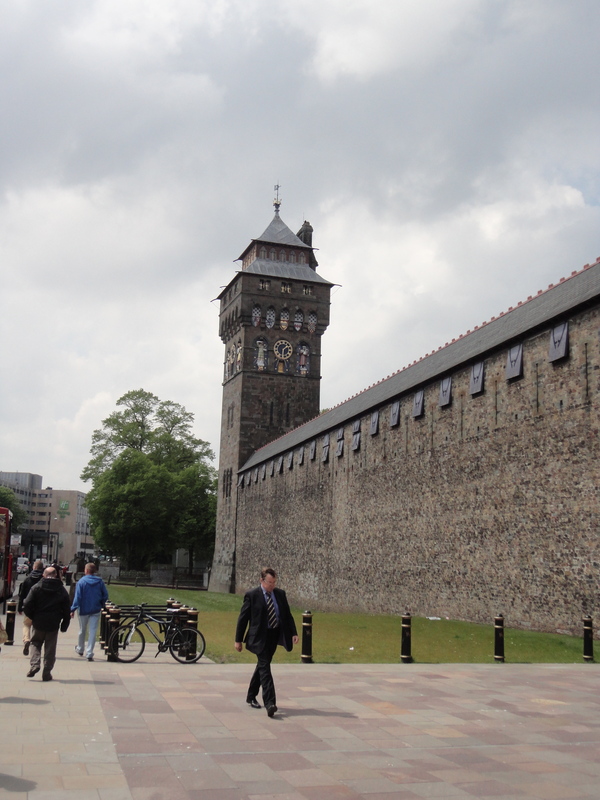 Ale has been brewed in Cardiff for centuries. In 1340 two tasters were appointed, whose jobs were to keep a check on the price of ale and test its quality. 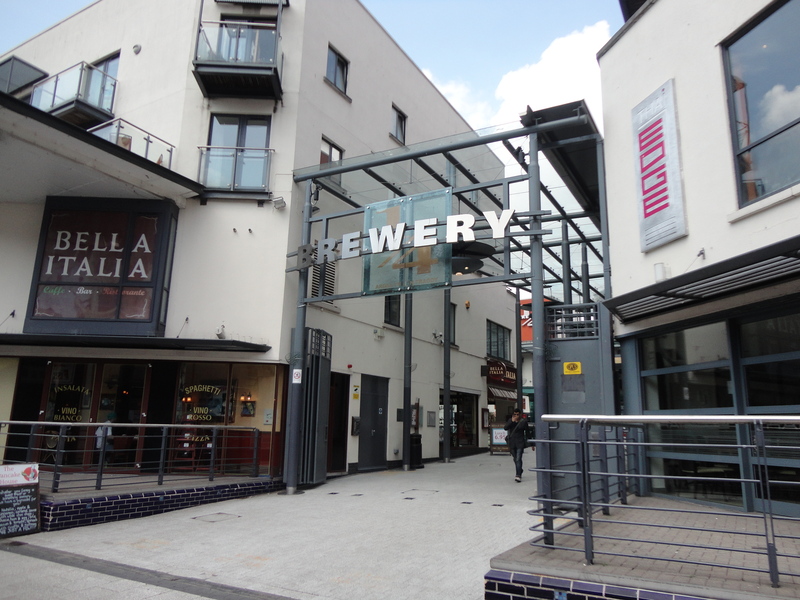 In 1855 there were seven breweries in the centre of Cardiff. The Brains brewery was the last of these. Near The Old Brewery is a REAL Cardiff traditions which sadly is not in the Cardiff Centenary Walk but jolly well should be…. 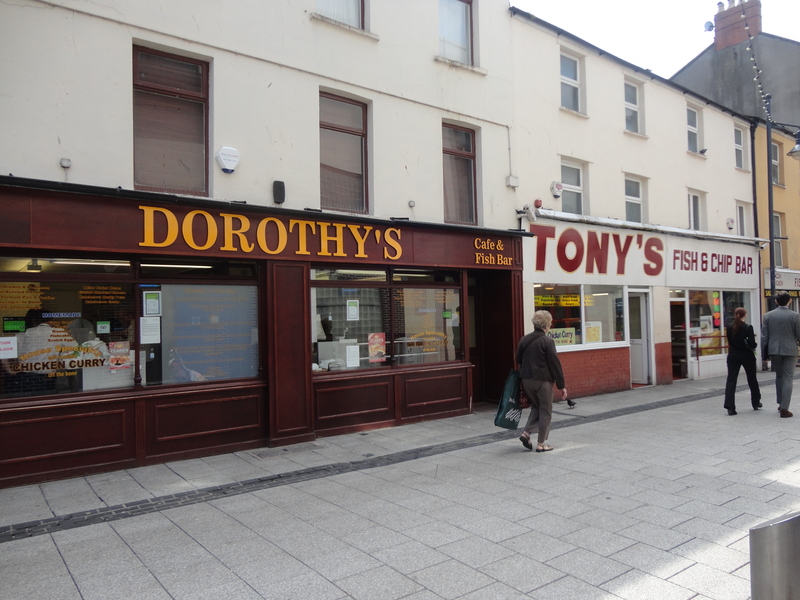 Both these places are Cardiff Legends and I frequently visited them when I was younger! 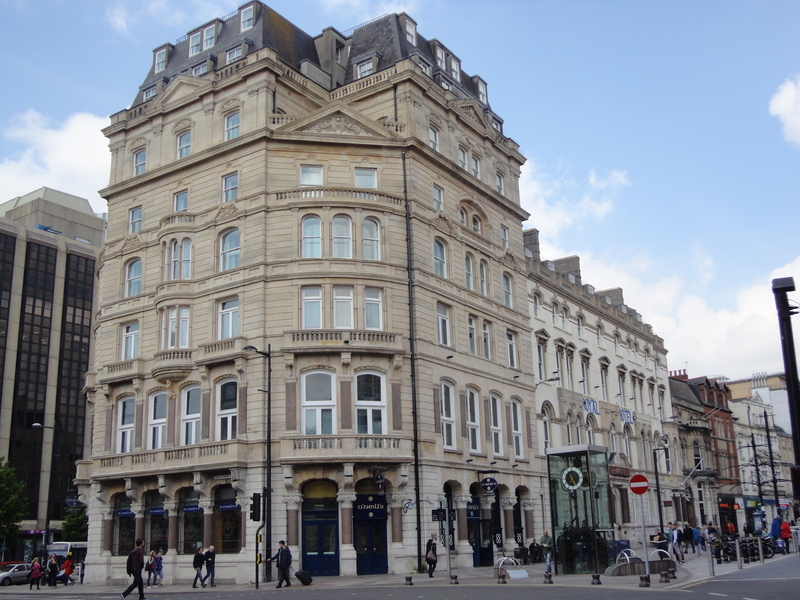 We turned right into St Mary Street and passed The Royal Arcade and on the opposite corner, The Royal Hotel. Over the road from the arcade is the Royal Hotel. 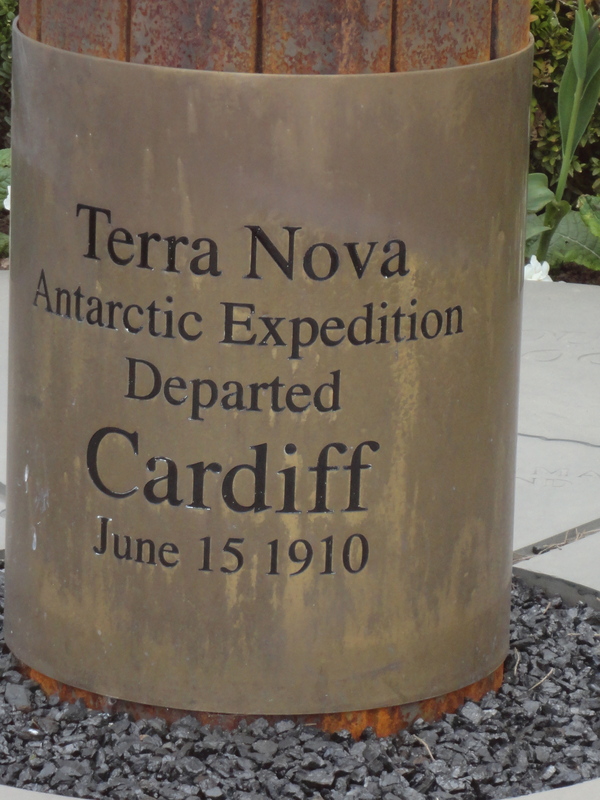 This is where Captain Robert Falcon Scott and his party of explorers dined on the eve of their departure from Cardiff in June 1910, on their ill-fated expedition to be first to reach the South Pole. The party reached the Pole in January 1912 only to discover that Norwegian explorer Roald Amundsen had beaten them by a month. Scott and the four colleagues who made the final push to the Pole died on the journey back to their ship. It’s thought that the tower of the hotel was once the tallest habitable building in Cardiff. 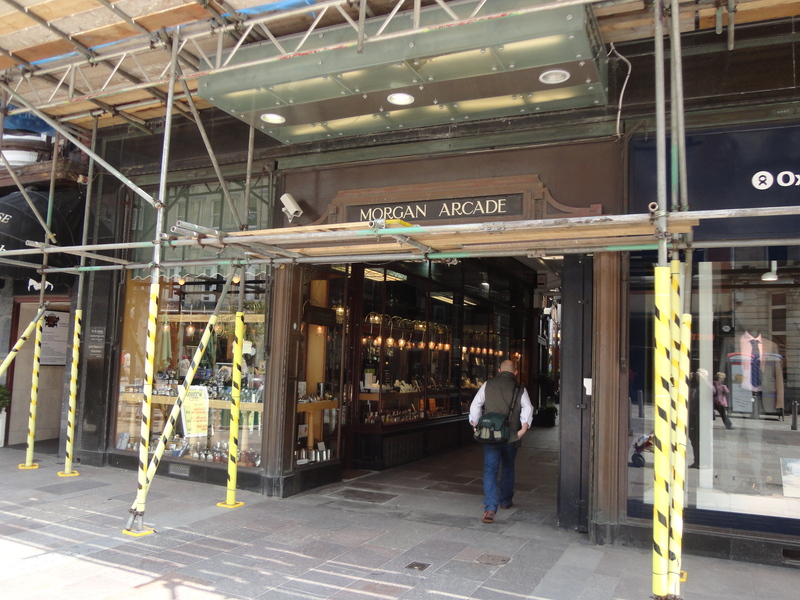 Next stop was The Morgan Arcade! 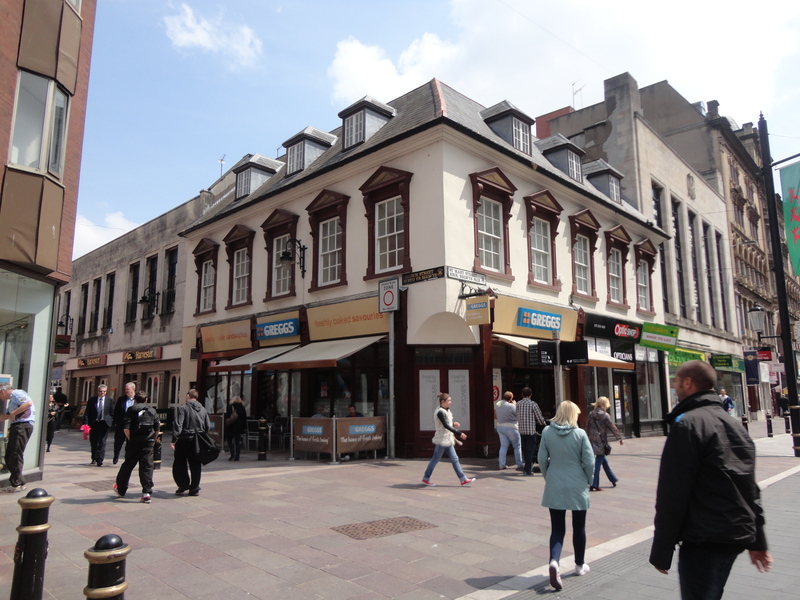 This is the best preserved of Cardiff’s Victorian arcades, built in 1896. It’s worth going in to see the first floor Venetian windows and the original slender wooden shop fronts. It was so impressive to look up the arcade from St Mary Street! 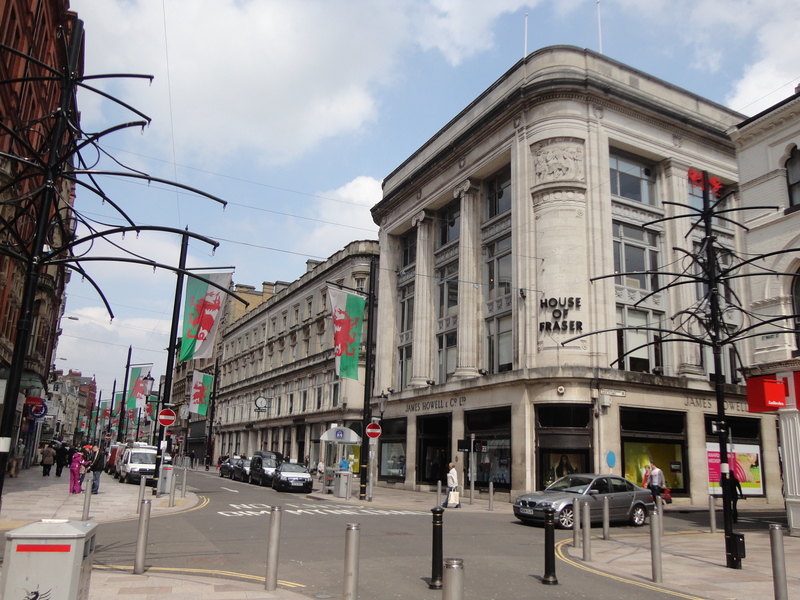 We were soon outside The House of Fraser store but to all real Cardiff people it will always be Howells!! This building was built for James Howell, a draper who moved his business here in 1867. Until 1843 part of the site had been used as barracks. The store incorporates the Bethany Baptist Chapel, which dates from 1865 and was sold to Howell’s store in 1964. 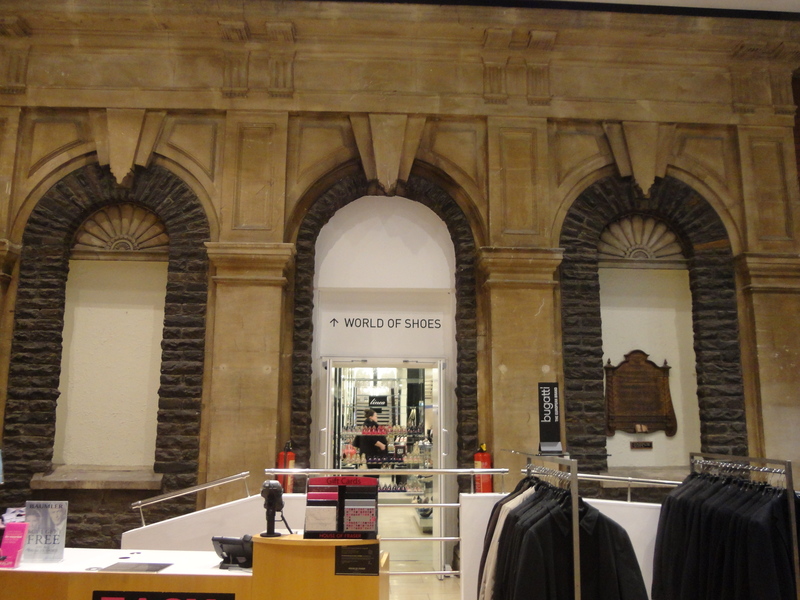 You can see what’s left of the façade in the menswear department. 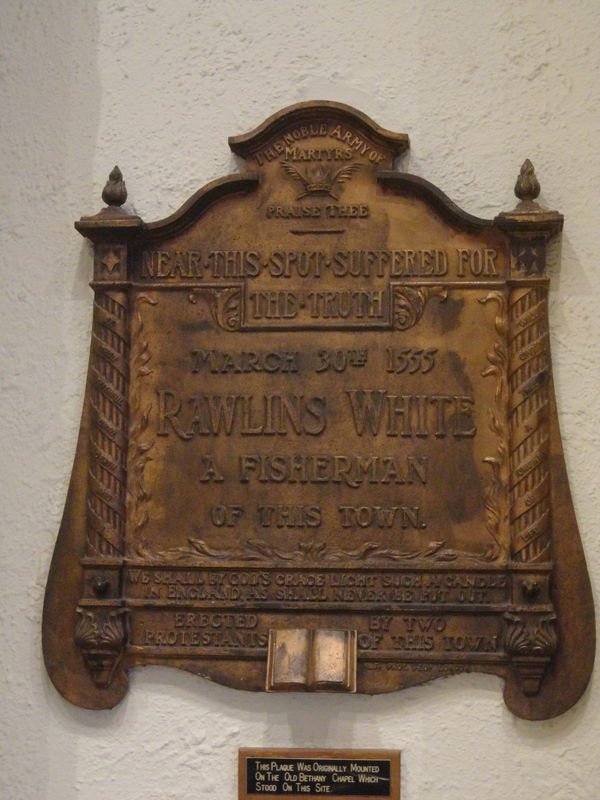 A bronze plaque on the chapel façade commemorates Rawlings White who was burnt at the stake for heresy in 1555. In January 1943, during World War Two, a section of Howell’s store was commandeered to ensure that production of parachutes and barrage balloons was not interrupted after a serious fire destroyed the main manufacturing centre in Cardiff docks. 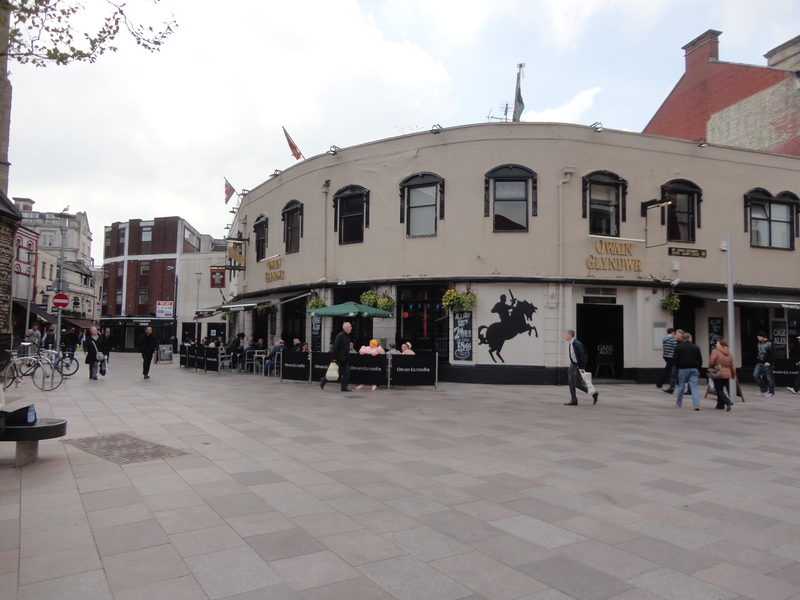 We strolled up Wharton Street and reached The Hayes. The name Hayes is probably derived from the ancient word for land enclosed by a hedge. Local people were granted areas of land called burgages – sometimes known as heys – in medieval times and there were still vegetable gardens here until the 18th century. 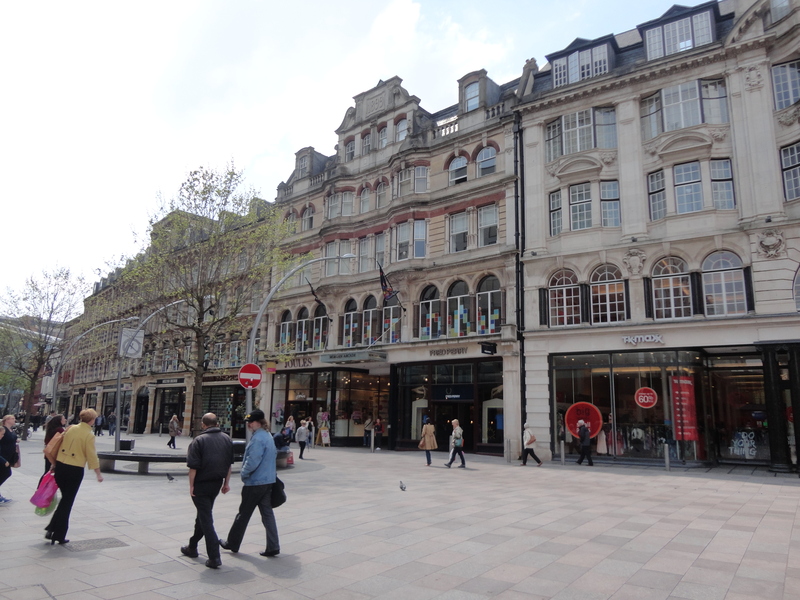 By the end of the 19th century the area had became a fashionable shopping area. 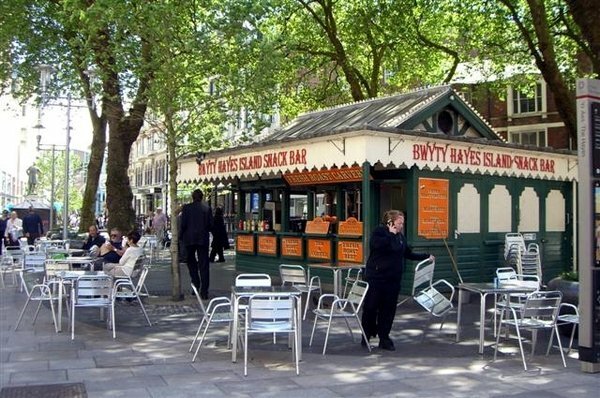 The Hayes Island Snack Bar, a famous Cardiff landmark, was built in 1911 as the Tramway Parcel Express Office. It was the scene of the notorious Seagull/bacon roll incident, which will remain in my mind forever!! I sat down here to rest my weary feet, the walk completed. Alfie now decided to wake up! After a short break we made for the Bendy Bus and the trip back to our car! 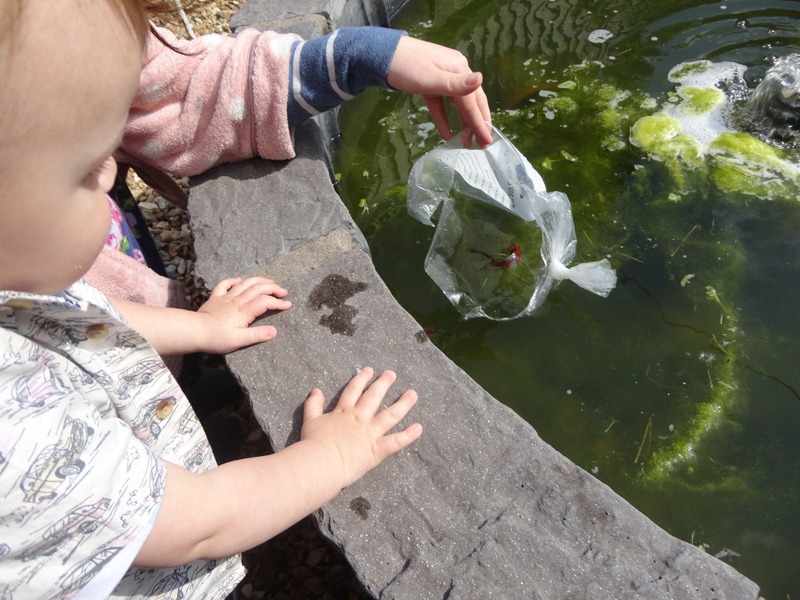 On the way back home we stopped off at Pets at Home, we had one more job to do… buy some goldfish for the pond at home. 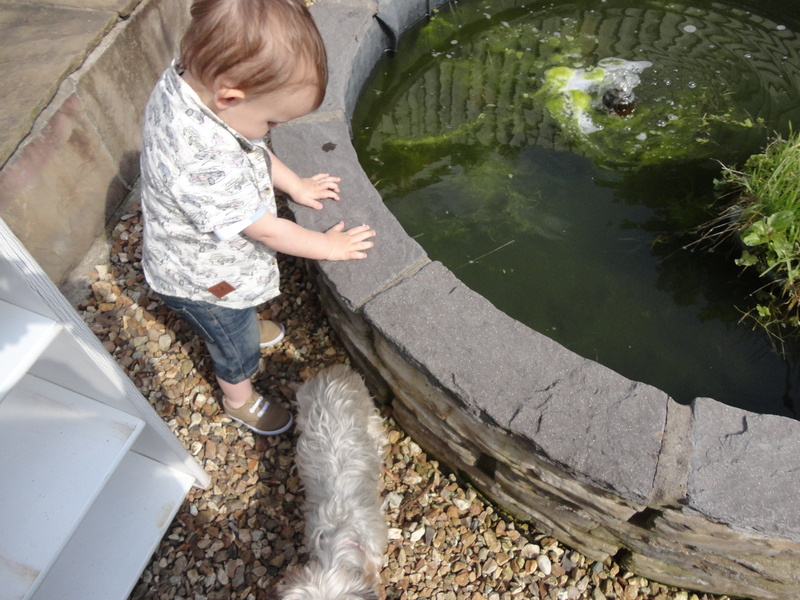 The terrapins have woken up from hibernation and the pond needs to be got ready for the summer! 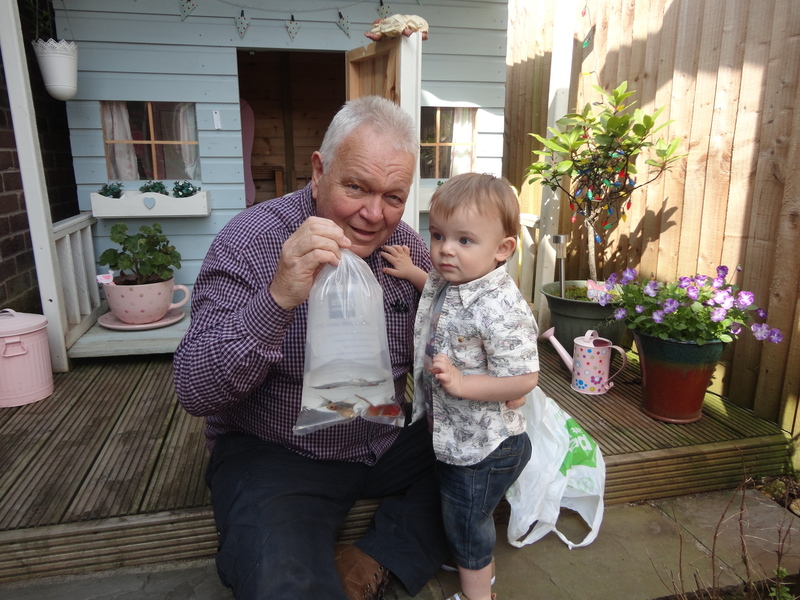 Alfie loved the pets and chose three shubunkins, which we took home and after letting the fish get used to the temperature, we let them go. It was great fun. 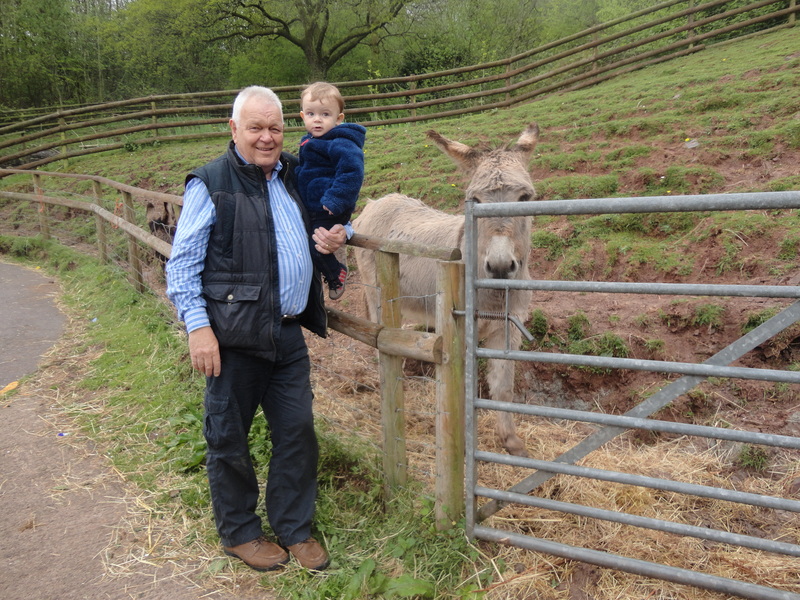 When Alfie’s dad came, he left happily after a great days adventuring. Alfie arrived early this morning looking bleary eyed and tired. He had been awake in the night, and it showed. As usual, the lady of the house made a big fuss and kindly offered to get the little lad ready for the day in exchange for a lift to work. Seemed like a good deal to me. He looked very dapper today, after she had finished. When we got to the good lady’s workplace he was duly whipped away, to be shown off to her colleagues. He came back in good time and we set off for home through the busy school traffic. 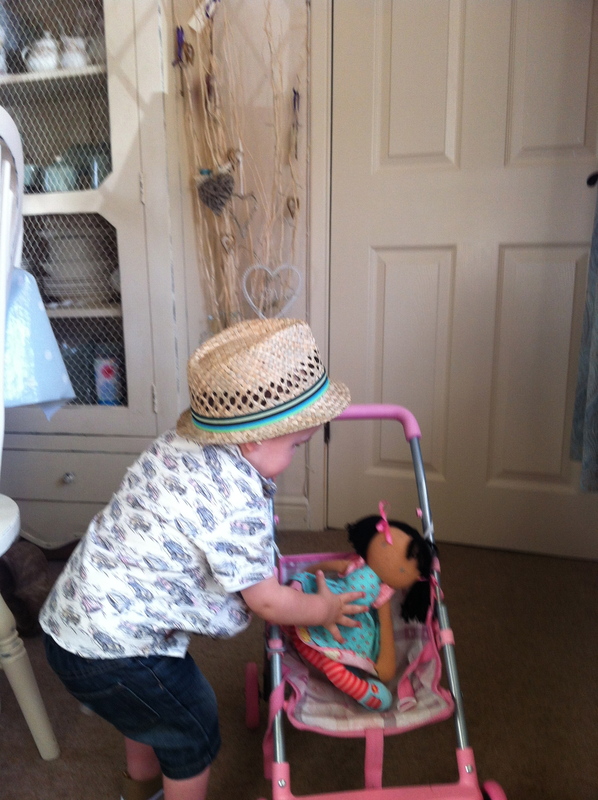 When we got back, Alfie showed off his feminine side and played with a little pink pushchair for a while, taking a little rag doll in and out at regular intervals. When I looked up from the newspaper after a while, Alfie was standing there with his dummy in his mouth and his little comfort blanket gripped in his hand. 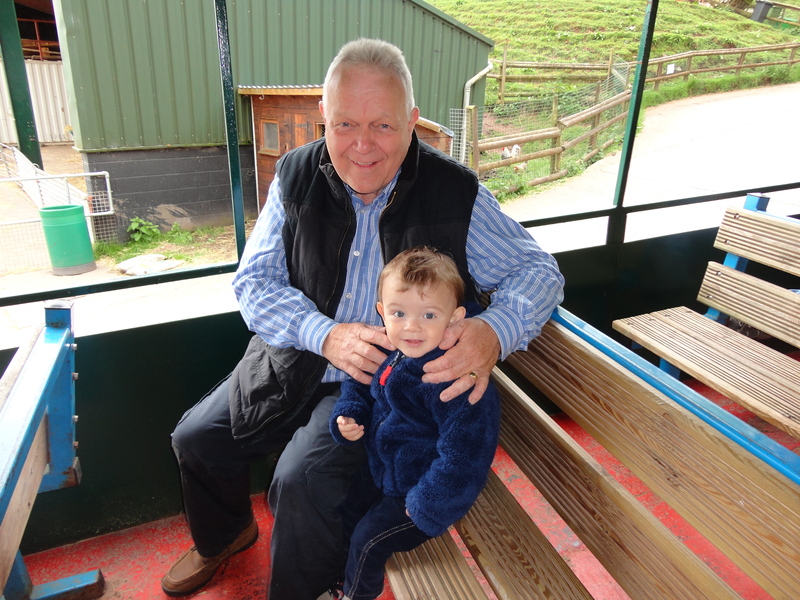 I was torn between reading the latest articles about the ongoing saga at Manchester United – I am still overcome with grief with the impending retirement of AF – and giving my grandson and little friend a cuddle. Alfie won hands down and he snuggled in under the blanket on the settee. I was considering watching Jeremy Kyle; it’s been a while since I have sat mouth open at the antics of some of his guests, but just as Alfie’s breathing was getting heavy, the phone rang and disturbed him big time! He had another little play and then gave me a look, which said, “Get me into the cot quick!” which I did, and he slept for quite a while. It meant our Adventures would start later than usual. 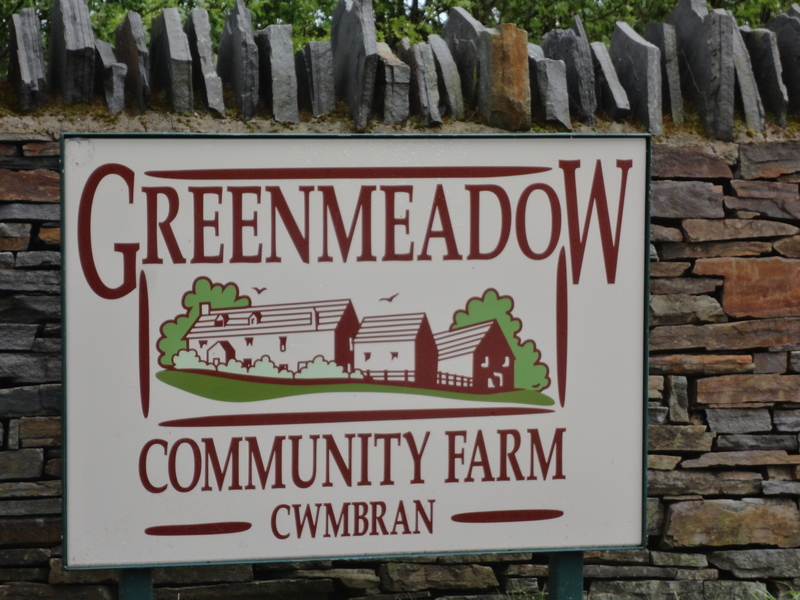 Greenmeadow Community Farm has been a working farm for over 250 years. 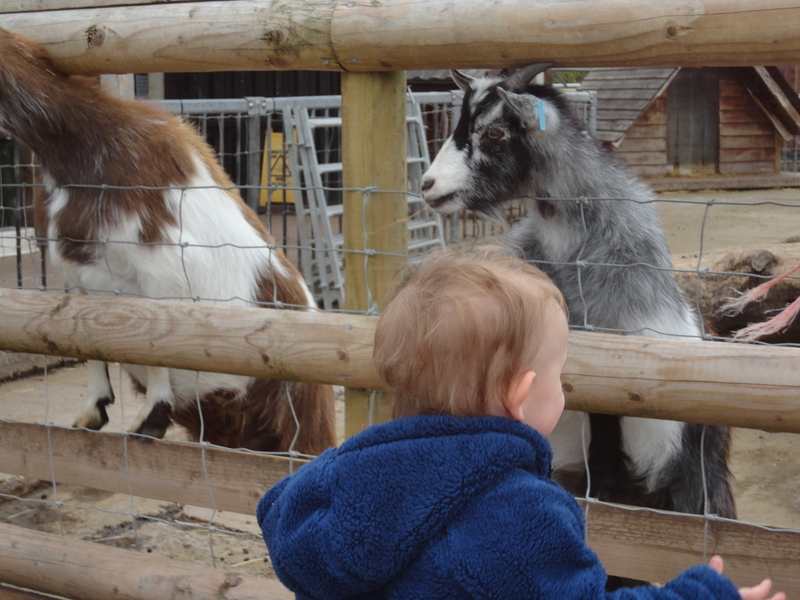 Set in over 120 acres, we have a wide range of pedigree and rare animals, which you can come and meet up close. 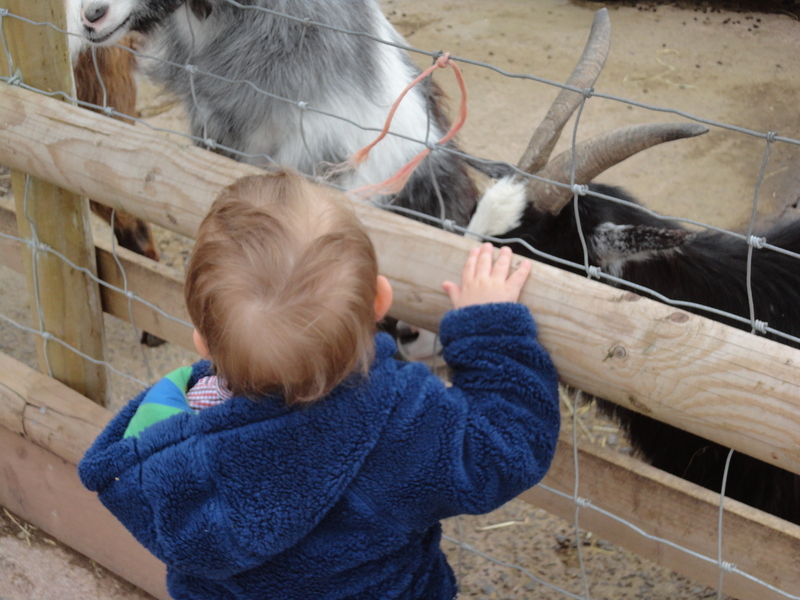 We have a cosy farmhouse cafe offering kids’ favourites and a selection of homemade specials. We aim to use as much local produce as we can, supporting local farmers, growers and suppliers. We are planning to develop the Farm’s kitchen garden so that we can supply the cafe with fruit and vegetables grown on site. The tea, coffee and sugar we serve is Fair-trade. The Farm is closed from Christmas Eve until 31st January inclusive. 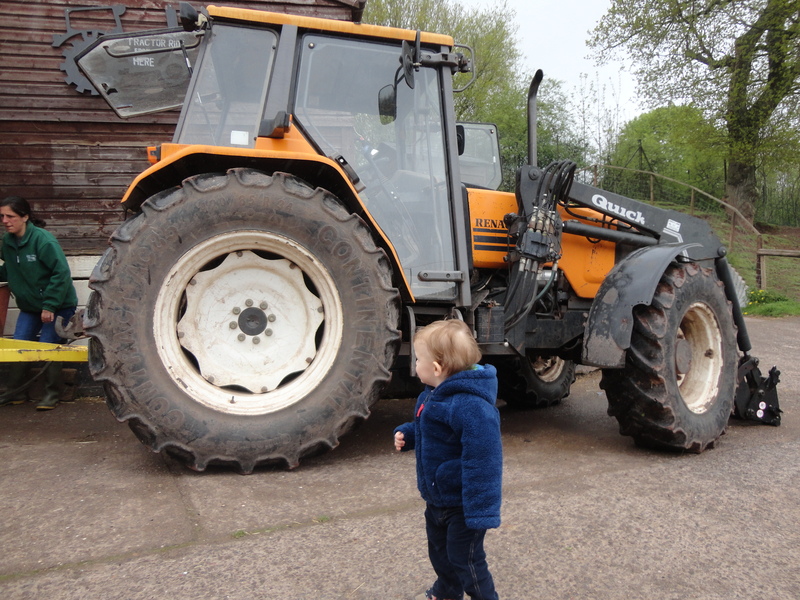 It was the last bit that caught my eyes… as well as little pink pushchairs, Alfie LOVES big tractors. 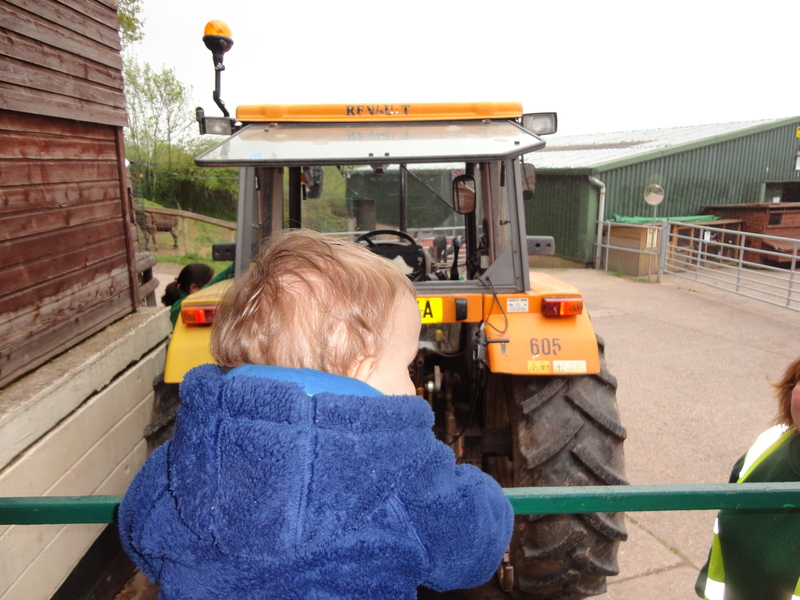 His favourite toy in the nursery is a green tractor, which he loves to play with every week…and he is eligible for free admission. 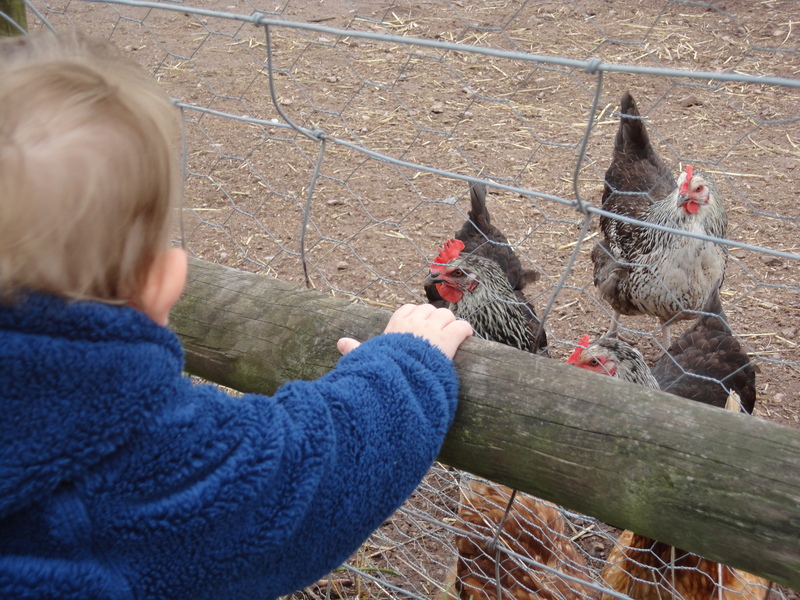 Greenmeadow Community Farm it is then. When Alfie was up and about we set off. I had loaded the car with all that was needed while he was resting and building up his energy reserves ready for a big day of adventuring! We headed up the Ely Link Road and down the M4 before leaving at Junction 26 and heading for Cwmbran and the farm. Cwmbran is a new town in Wales. 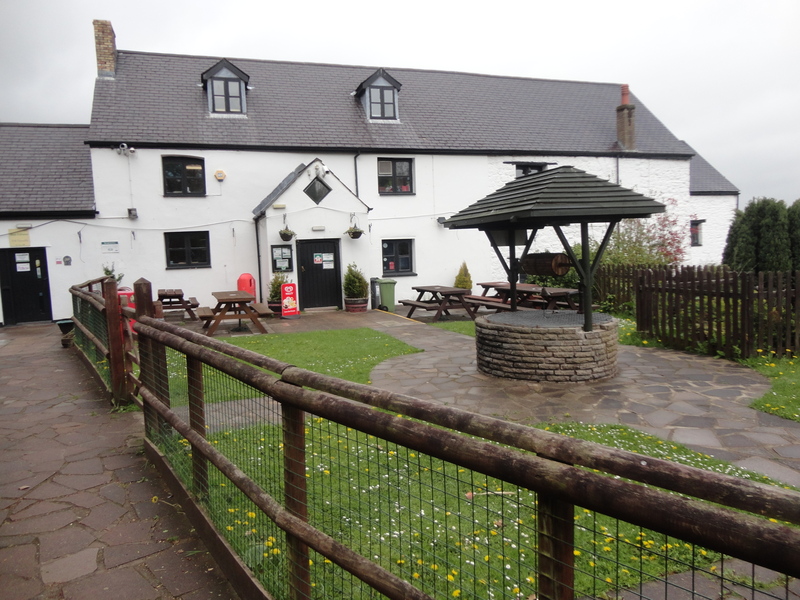 Today it forms part of the county borough of Torfaen and lies within the historic boundaries of Monmouthshire. Cwmbran was established in 1949. On old maps Cwmbran is a farm. The farm lies on the edge of the town. As we drew close we both got very excited. Greenmeadow was ‘rescued’ over 25 years ago by a group of local people. 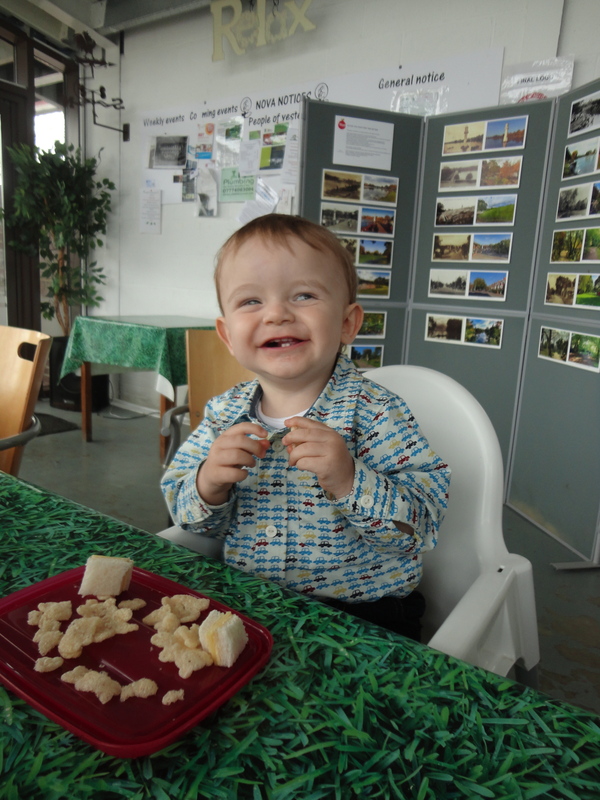 When the previous owner died and the house and farm became empty, they decided to buy the Farm and turn it into a Community Farm to ensure that it would remain a green space for the town and to provide a service to the local people and visitors alike. 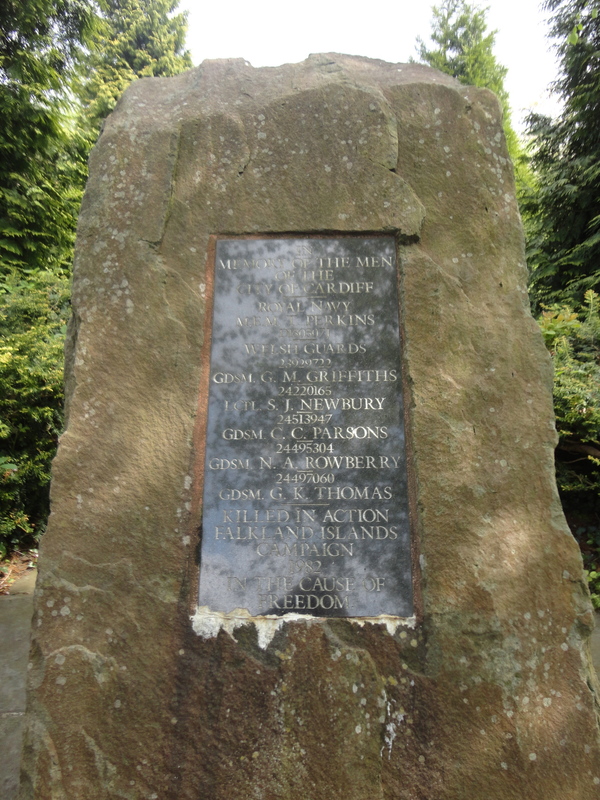 It is now a local treasure and the people of Cwmbran are very proud of it. The actual farmhouse dates back to 1752 and is built from local Welsh stone with a traditional Welsh slate roof. The date stone above the fireplace in the café is original and proudly states the initials of the people who first lived here – Edward & Anne Jones. 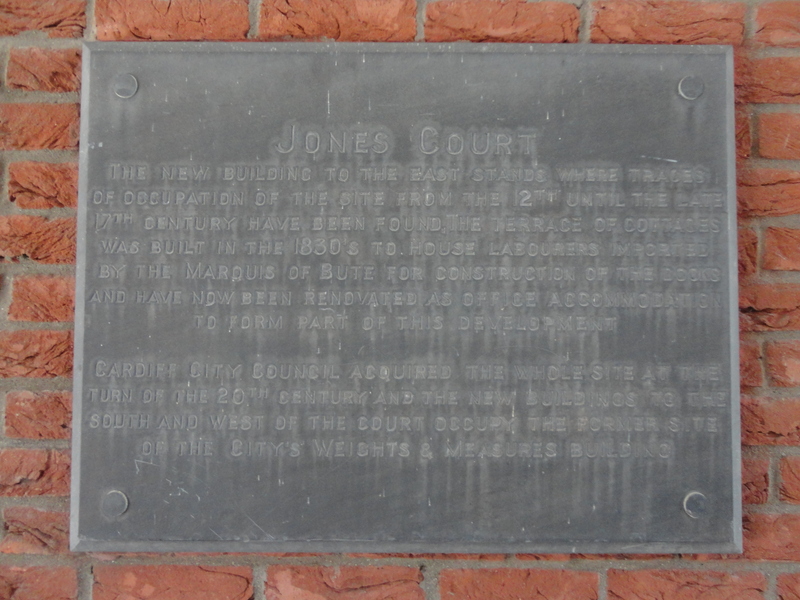 The letter I is shown instead of a J, as before 1800 Jones was spelt Iones. The farmhouse has had a number of different owners since then. At one point the Adit Colliery, a local coal-mining colliery, owned it. Because of the colliery’s importance to the area, the farmhouse was the first house and for many years the only house in the area to have electricity. The layout of the farmhouse has also changed over time. 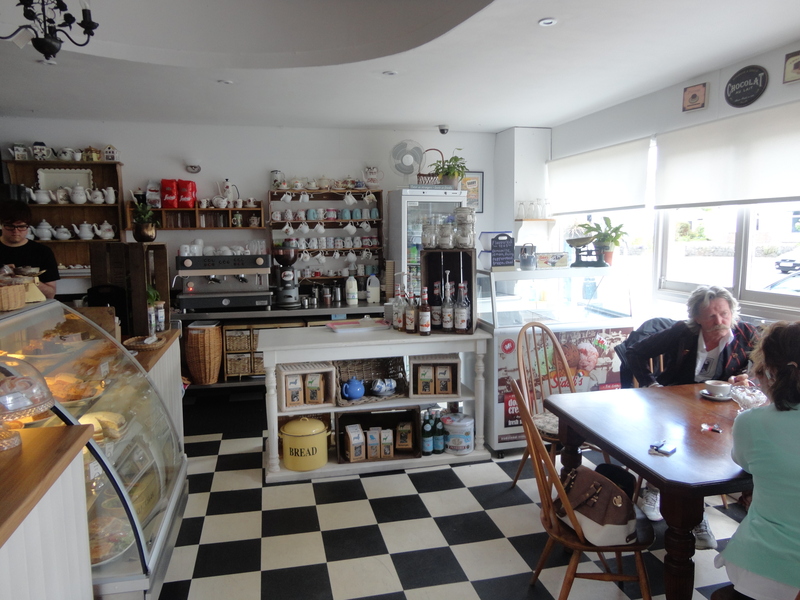 The area that is now the farm shop was originally a traditional farmhouse kitchen and scullery. 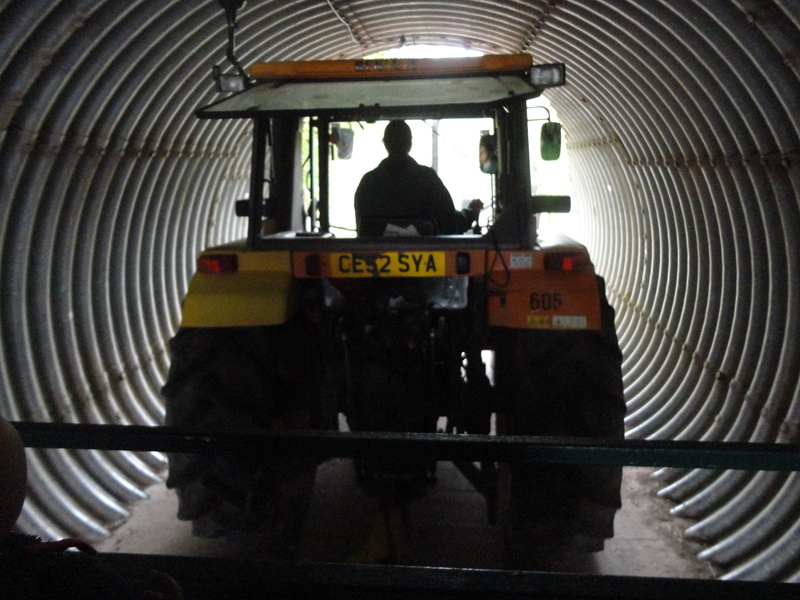 The storage and repair of the Farm’s tractors as well as the stabling of its horses took place where the current kitchen stands and the small dairy herd was milked in the area that is now used as a hand washing facility for our visitors. 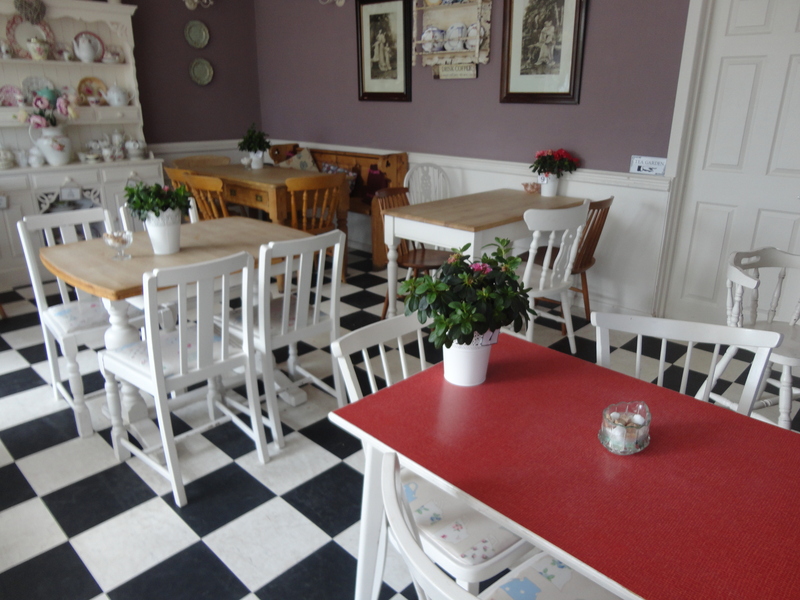 The farmhouse retains many of its original features including the beams, which can be seen in the café. There are several meat hooks hanging from the beams, which would have traditionally been used to hang salted meat as a method of preservation prior to the invention of fridges and freezers. We parked the car and made our way to the entrance. 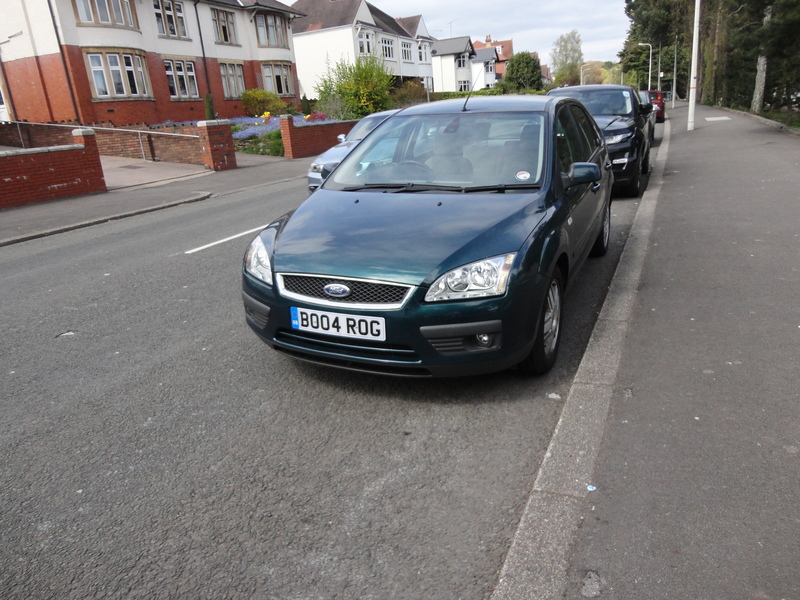 I was charged £4.20, which did not match any price I had seen, but I was happy and we headed in. We went to the building housing small animals first. Alfie was so excited. 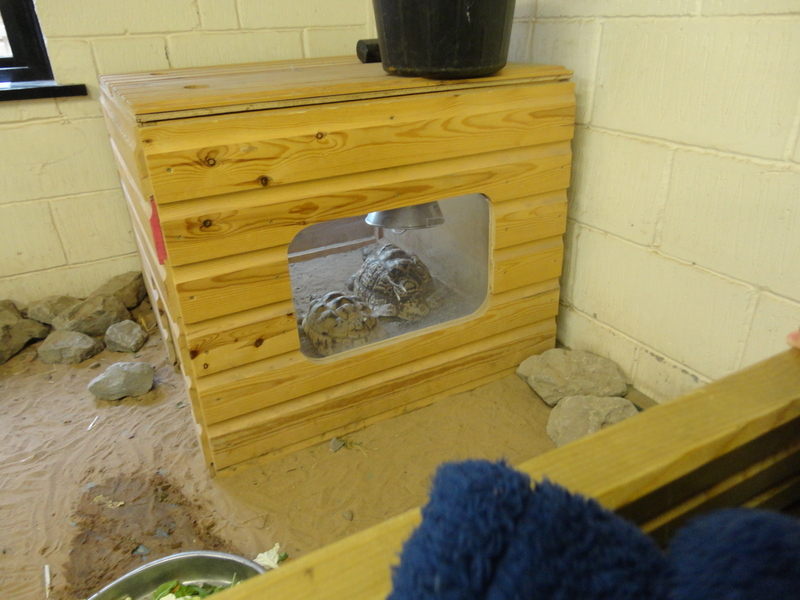 It contained rabbits, guineu pigs, mice, rats, some massive tortoises and a load of new born chicks, he was running around and around the cages trying to take it all in. 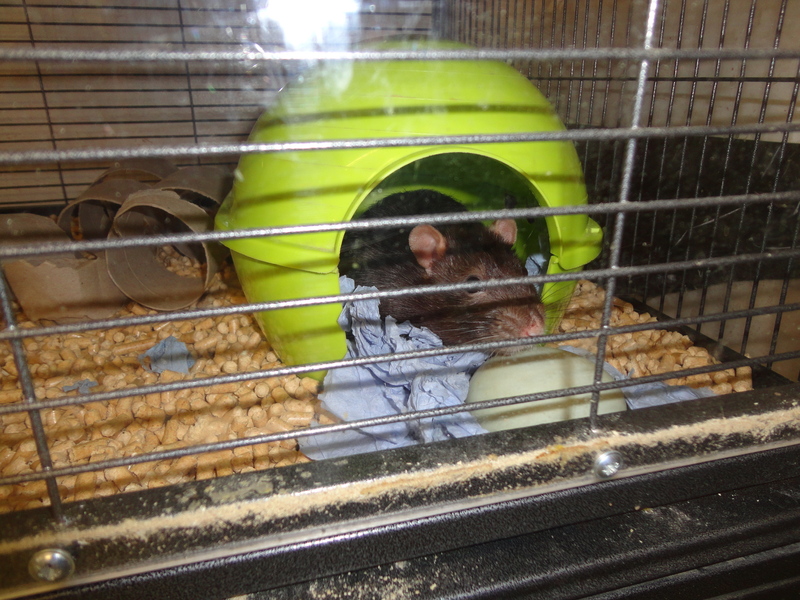 I think he like the large brown rat the best, probably my least favourite animal of all! From here we headed down towards the bigger animals. Alfie is walking everywhere now and it’s much more fun for him and me. 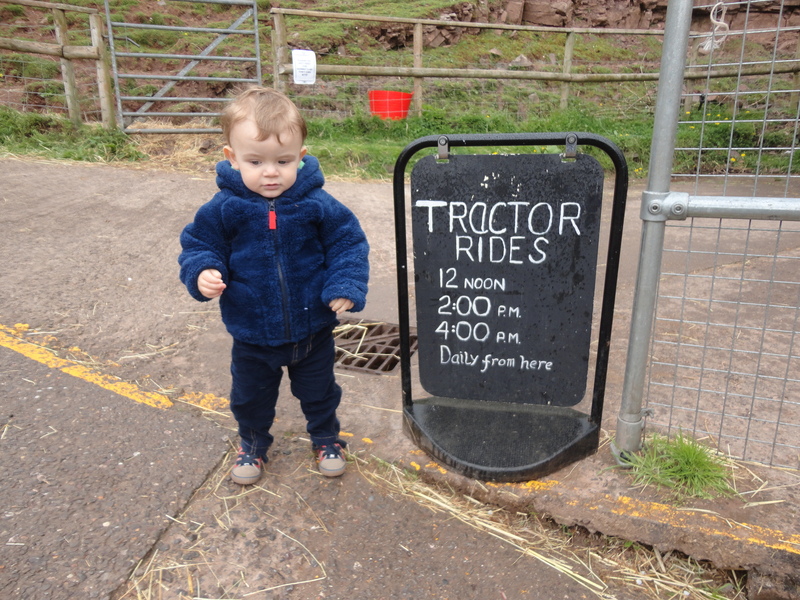 A sign told us that the tractor ride was at two o’clock. We had about an hour to see the larger animals and have lunch before the big event! 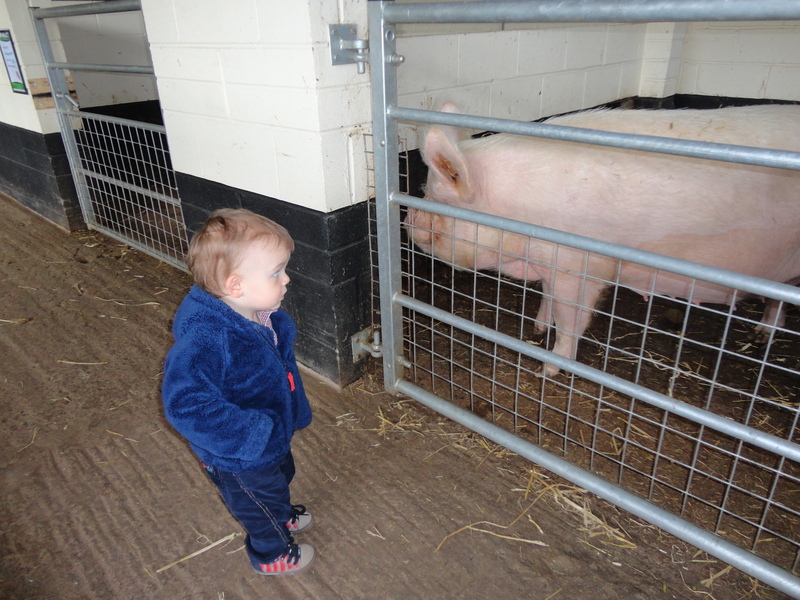 We passed several pens with rabbits and pigs before coming to a barn full of pigs, goats, chickens and cows – two big Friesians. I stepped back to look again and noticed the resemblance was striking. 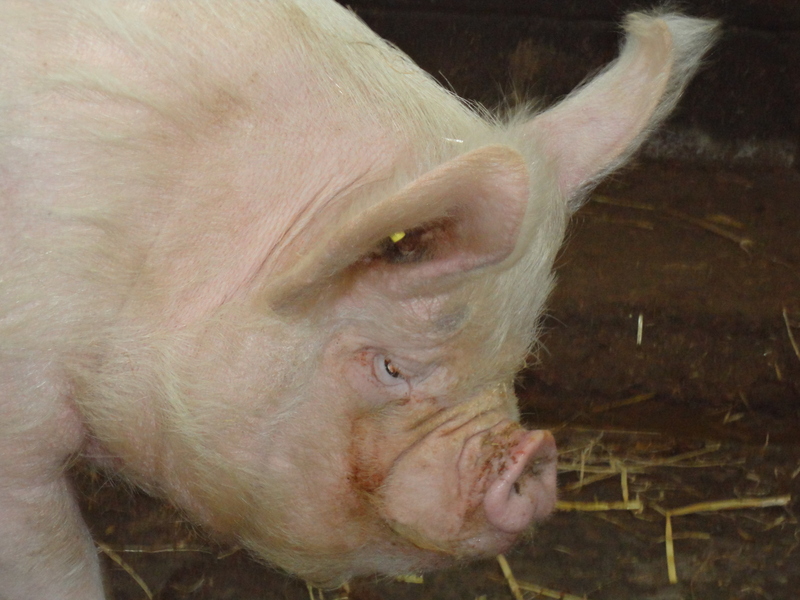 The pig looked like it had run into a brick wall and squashed its face. I smiled and walked on. We had a great time here, but soon it was time to go and have lunch, so it meant a walk back up to the café near the entrance. When we got there, the thought of a sausage sandwich or a tasty bacon roll somehow did not seem so attractive. I wondered where they got the pork from and decided to give it a miss. Alfie didn’t seem to care much so I ordered him a child’s meal of some home cooked ham and some chips. He loved it! 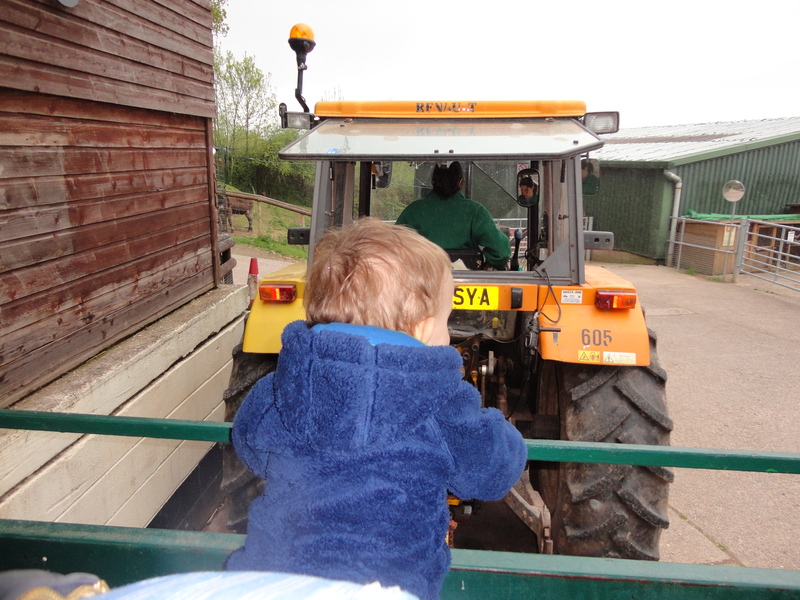 We left the café just before two and headed down to the barn again where the tractor was waiting to take us on a ride. 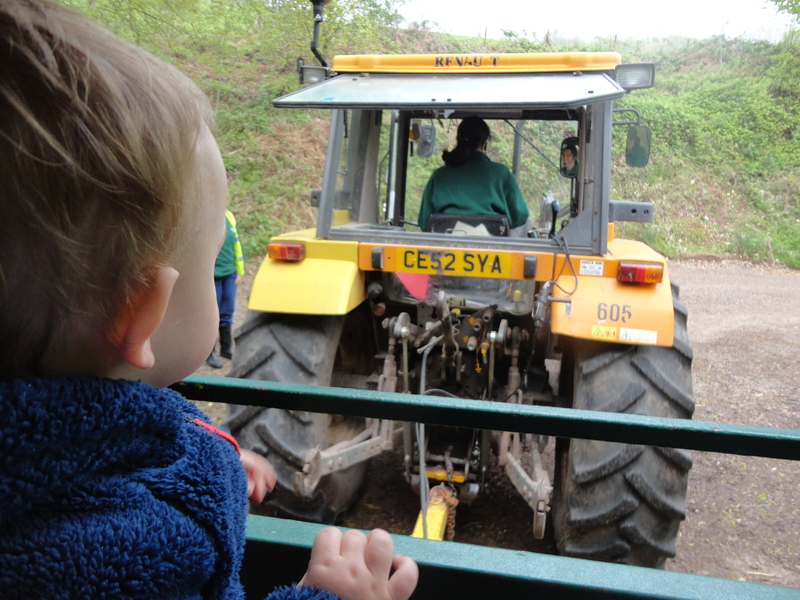 The tractor was massive and we had to sit behind in a big green trailer. Luckily the front seat was free so we made for it. 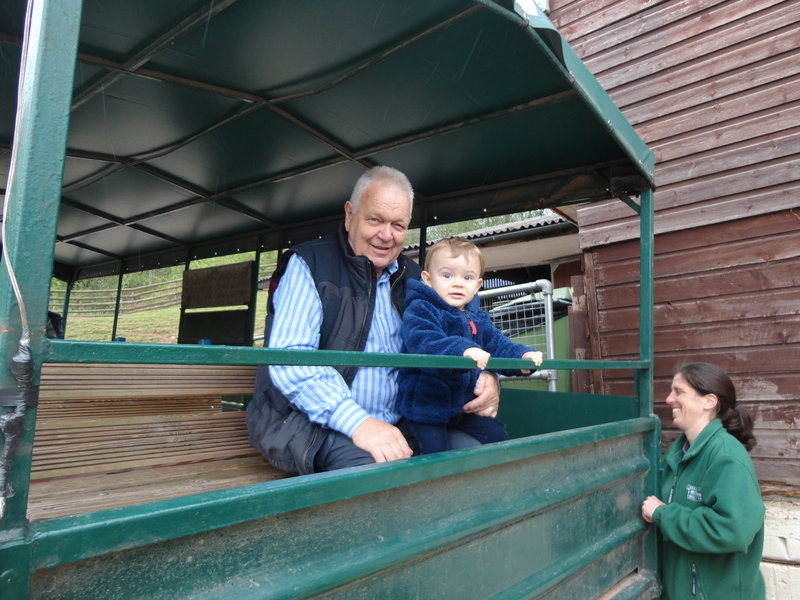 Alfie was beside himself with excitement and all the way around on the ride he was shouting and pointing. It was an incredible experience for him…and me. We had a tour of the farm, looking at some rare breeds of sheep and some beautiful little ShetlandPonies. On the way out and on the way back we passed under a corrugated tunnel, which was great fun. After the trip was over we made our way slowly back to the car. 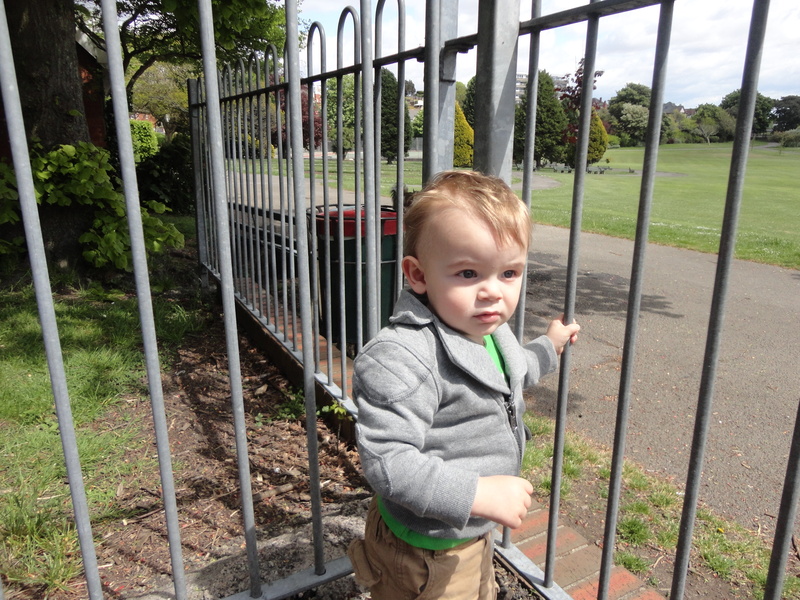 It was good to stroll about with the little man. Whilst driving back I realised we had to pass by the school where Alfie’s mum works. This would be a good end to the day. I made a quick phone call and turned off the M4 one junction before the usual one and it brought us to the school. 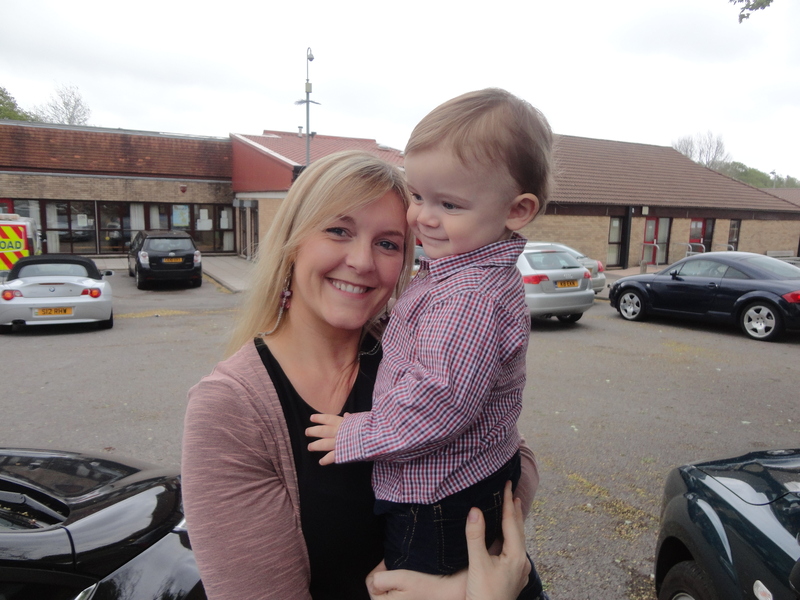 Alfie was so delighted to see his mum. I travelled home alone and missed the little smiling face in my mirror, but smiled myself when I thought about the great day we’d had. Thanks Alfie… another good one buddy! The Village People sing a song called Go West, but for Alfie and me to enjoy today’s adventures it was definitely a case of Go East! 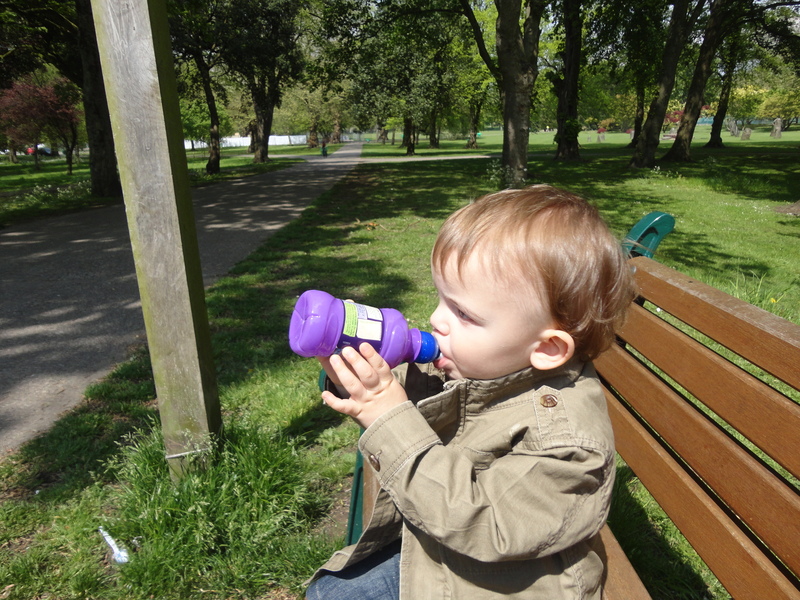 Our adventures would take us to Roath Park today, but there was an important job I had to do first. It is something I had been meaning to do all winter but today seemed an appropriate time. 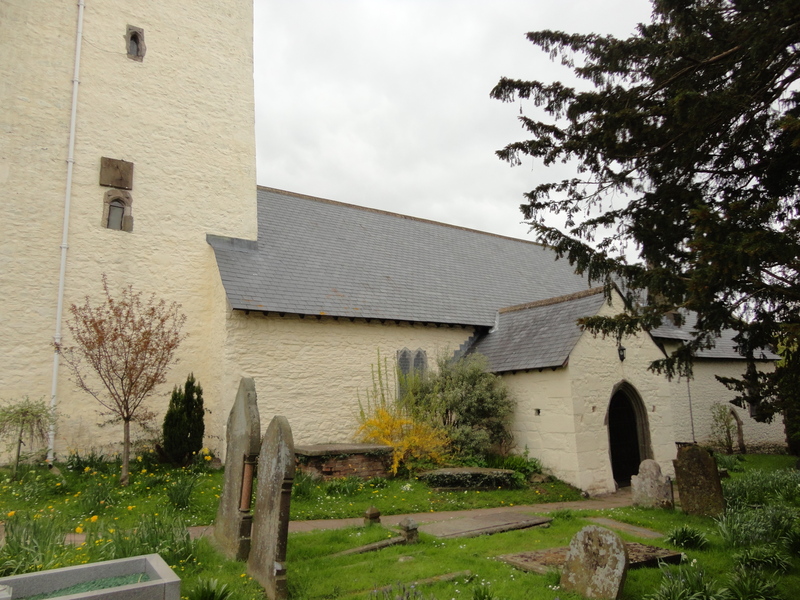 I wanted to visit St Edeyrn’s Church in old Llanedeyrn Village. The name “Llanedeyrn” is not a modern name. It is believed to be derived from the name of a sixth century monk and Celtic saint named St. Edeyrn. During the sixth century, St. Edeyrn and a fellow monk, St. Isan, were given the task of spreading the faith and establishing places of worship. 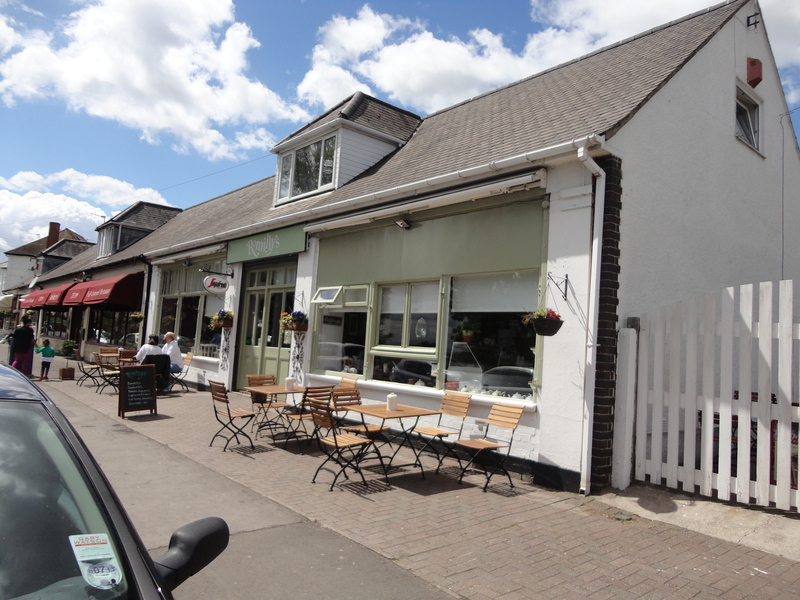 The first location chosen by the two monks was Llanishen, the place where I grew up! This area commemorates the first of the two monks St. Isan (Llan + Isan) and the other St. Edeyrn (the word “Llan” means settlement or place of worship in the Welsh language). 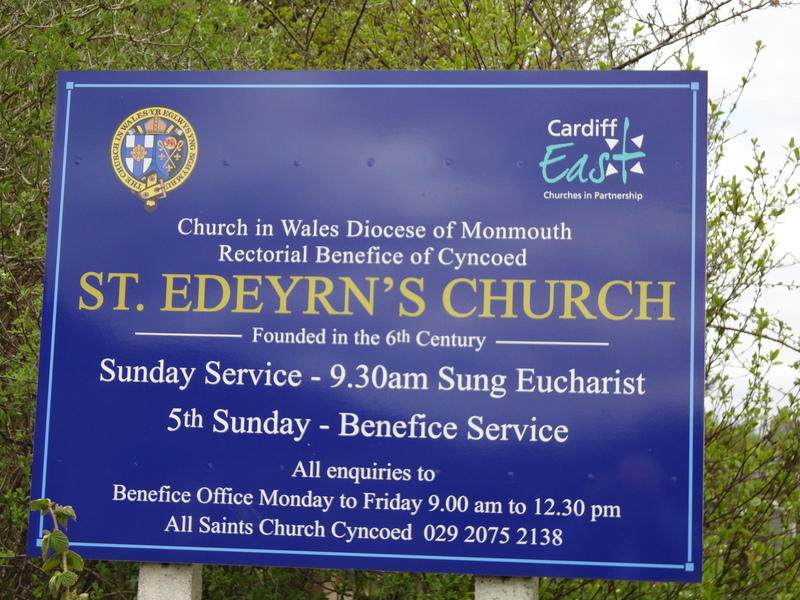 St. Edeyrn was reputed to have travelled widely and as a result there are churches in North and South Wales dedicated to his memory. St. Edeyrn gathered together a community of about 300 that lived and worshipped in the Llanedeyrn area. The original Norman style church dating back to 1123 exists only as stonework remnants beneath restoration work completed in 1888, the church today is a simple structure featuring a tower and five bells, adjacent to this church is a 15th century public house called the Unicorn. Curiously it is painted white! I love the old church and visited its grounds fairly frequently when I was teaching in Pentwyn. Today though, Alfie and I came to show our respects to two ex pupils of mine who have been buried within the peaceful grounds of this lovely old church. Sam Hully was taken from us last December after suffering with motor neurone disease; he was incredibly young at 30 to have such a devastating illness and he was incredibly brave till the end. His parents do what I do with Alfie with their granddaughter. We used to have a teacher/parent relationship, but now we have become friends and it’s a friendship I am beginning to treasure. 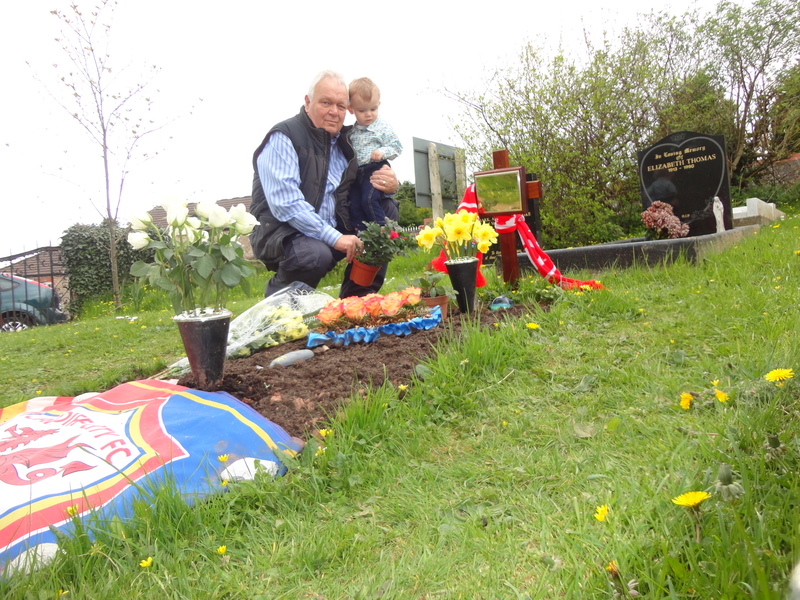 Alfie and I found Sam’s grave near the gate to the churchyard. 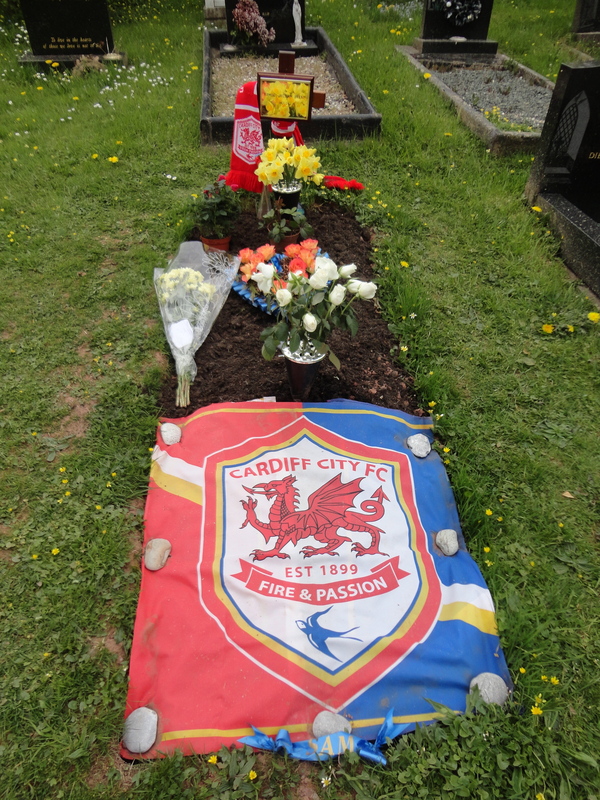 We had brought some flowers to put down on the grave – red to match the new City kit. Sam was the number one City fan. I found the whole thing very moving indeed. I have such fond memories of Sam, he was such a lovely boy! 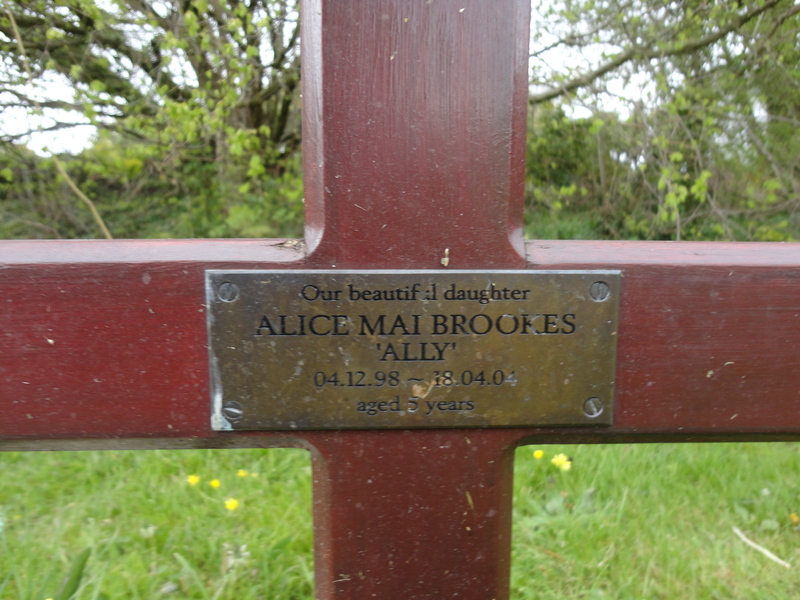 Alice Brookes did not live long enough to be in Glyncoed Juniors and therefore be a pupil of mine. She died when she was still in our Infants School. I taught her sister at the time and saw the deep sorrow her passing caused. Alice was just six years of age. 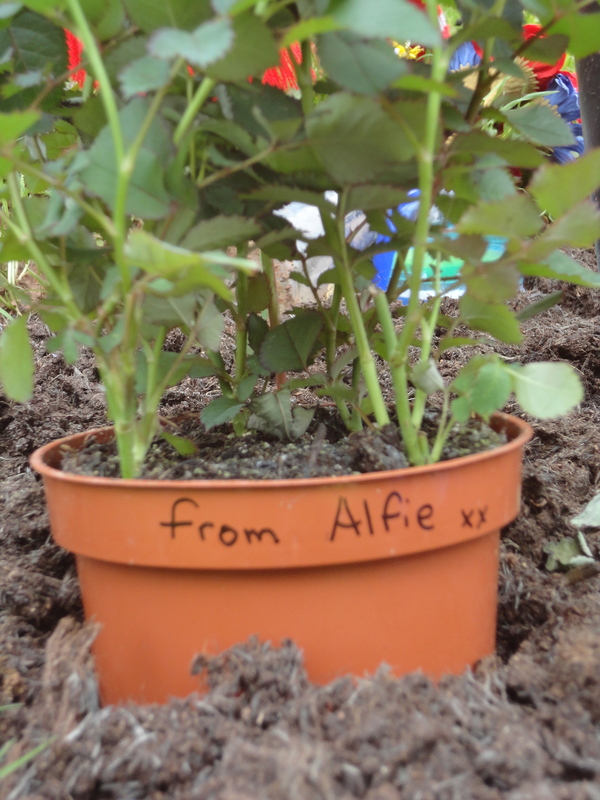 Alfie played with the windmills, which decorated Alice’s grave. It was a poignant few minutes. I am sure Alice smiled down on him as he was doing it. 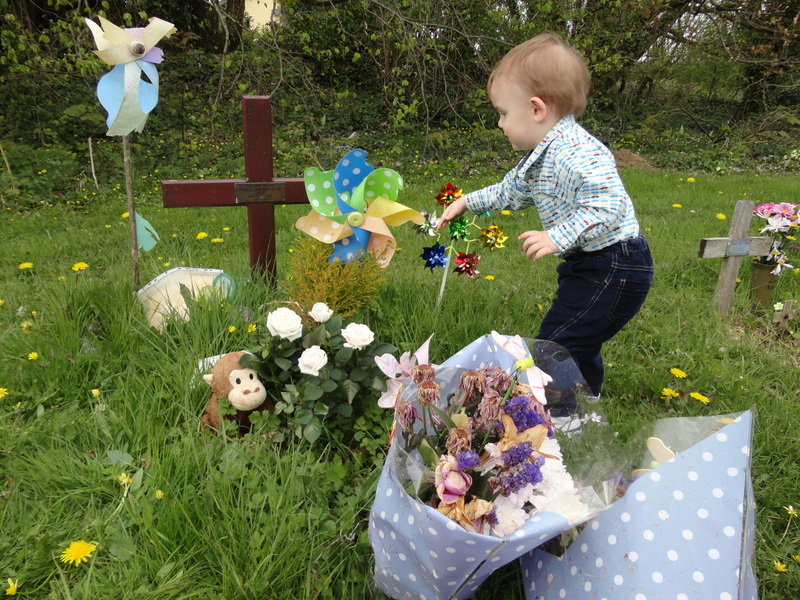 The anniversary of her passing was in April and messages and flowers from family and friends were a powerful reminder of how much that little girl was loved and how much she is missed. 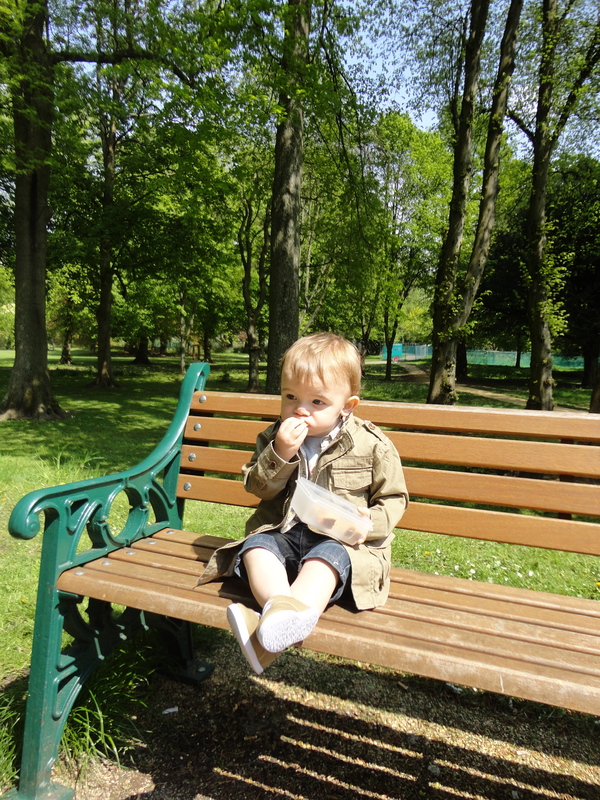 Alfie and I sat quietly in the spring sunshine; my little friend had no idea what thoughts were going through my mind. It was soon time to leave and as we came out of the church, we passed two ladies holding a beautiful plant, off to remember a dear one they too had lost. 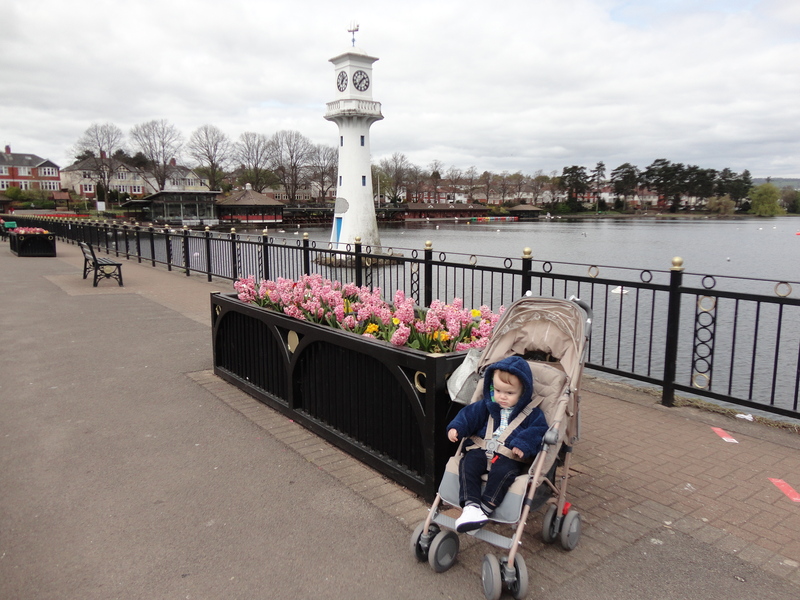 Alfie and I had plans to visit Roath Park, a place where I enjoyed many happy hours when I was growing up. 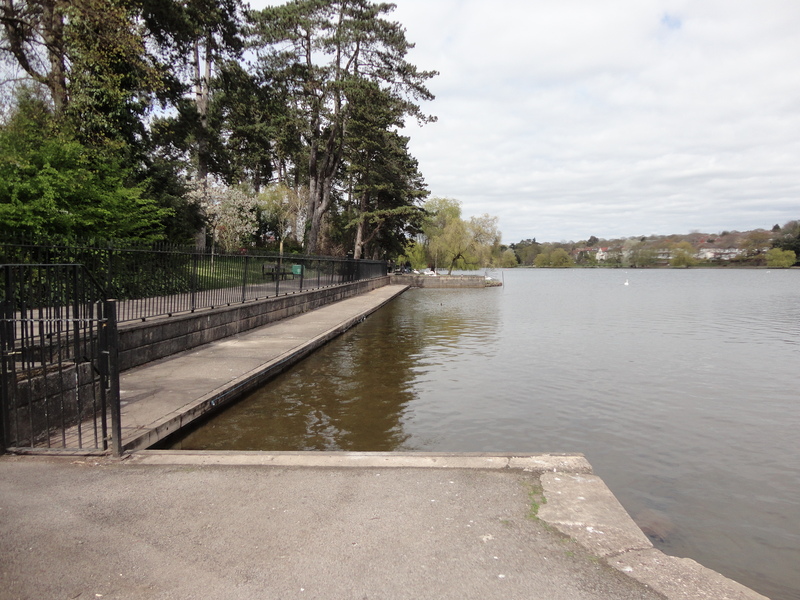 Roath Park is one of Cardiff’s most popular parks, owned by the City of Cardiff and managed by the Parks Section. 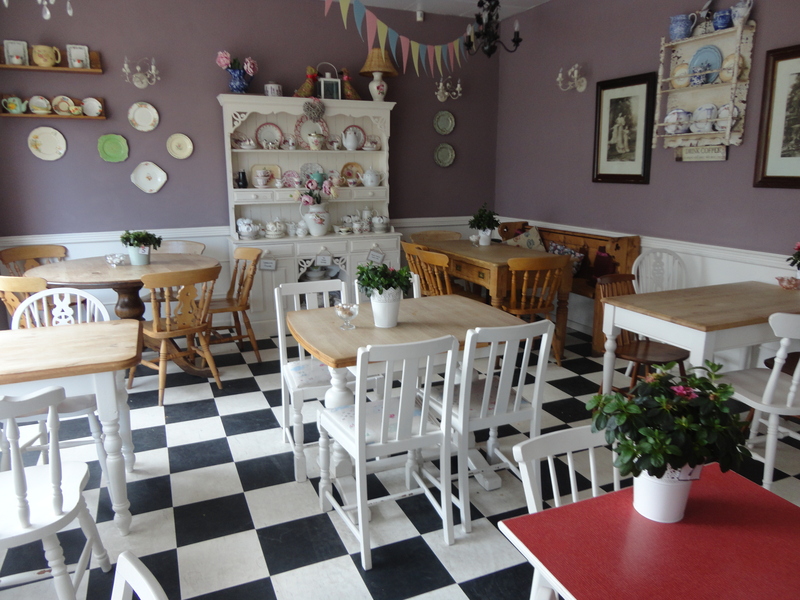 It retains a classic Victorian atmosphere and has many good facilities – it’s a really classy place!. 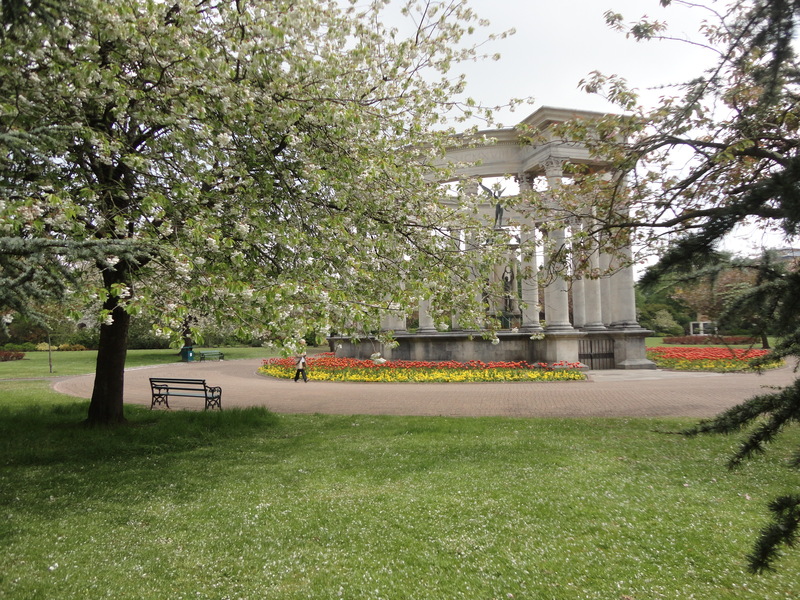 The park has recently been awarded the prestigious Green Flag Award recognizing its high quality and its importance to Cardiff. 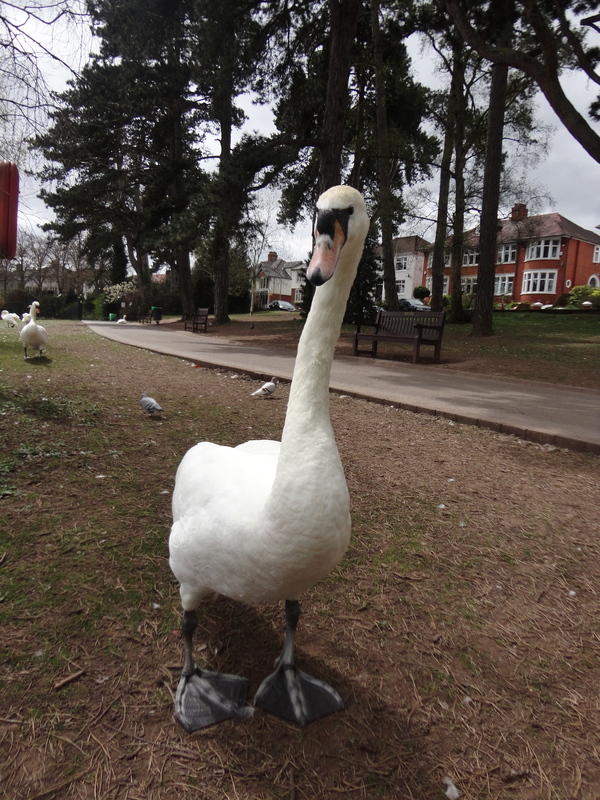 Roath Park has widely diverse environments across the park. 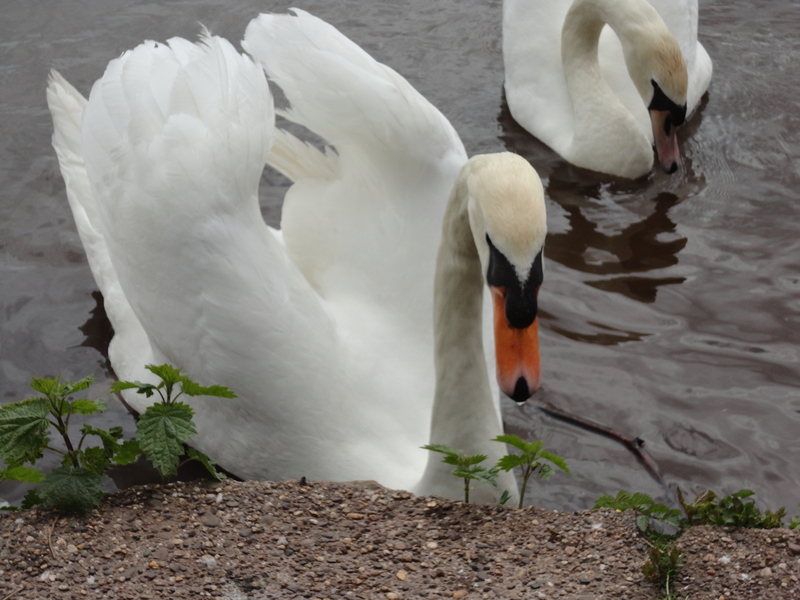 The park was built on 130 acres of reformed bog land known then as a malarial bog, and includes a 30-acre lake. It is 1.3 miles around and was formed by the damming of the Nant Fawr stream. It is a popular facility for fishing and rowing. There are four islands within a conservation area, home to many water birds. 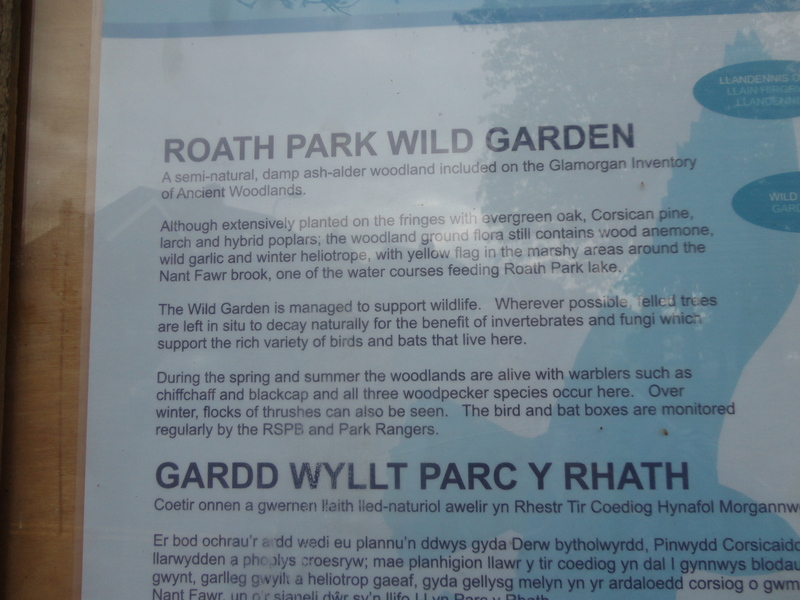 The Park occupies a long strip of land stretching from Cyncoed in the north to Roath towards the southeast. 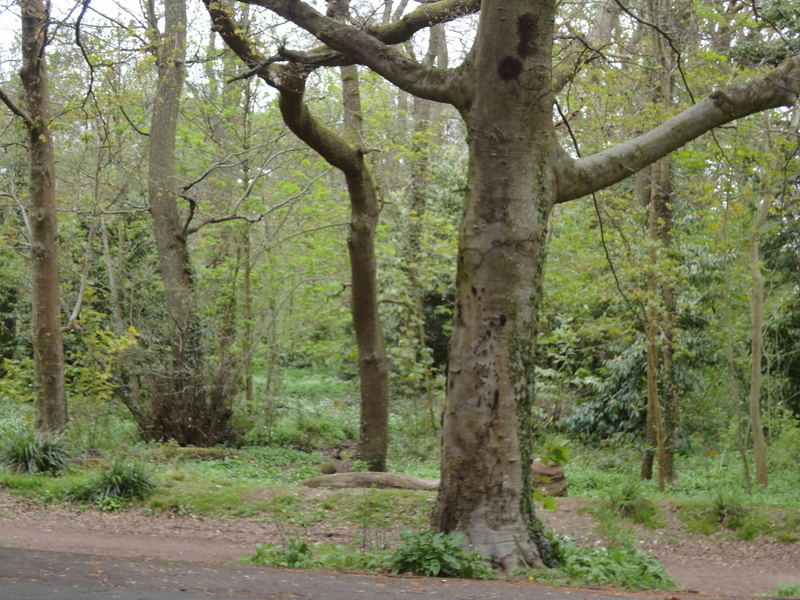 The park is divided into several parts along the Roath Brook, Nant Fawr. 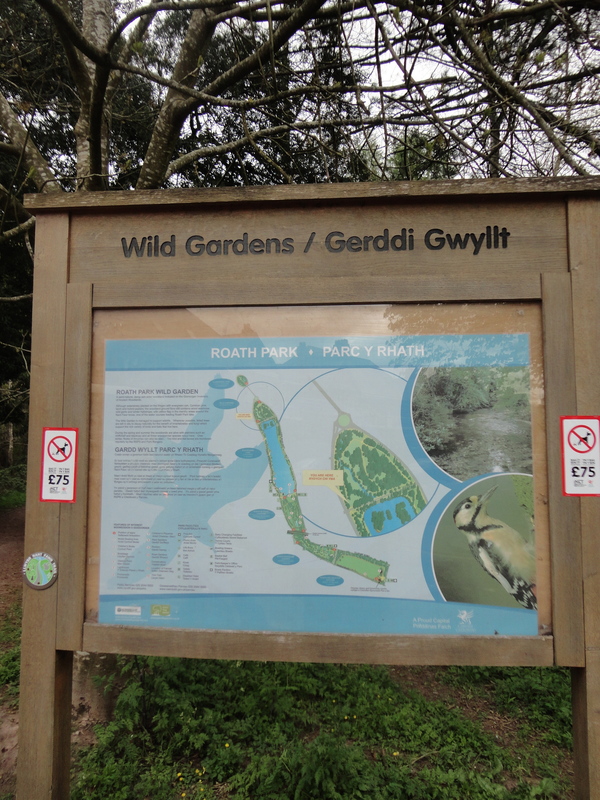 From north to south; The Wild Gardens, Roath Park Lake, Botanical Gardens, Rose Gardens, Pleasure Gardens, Roath Park Recreation Ground, Roath Brook Gardens, Roath Mill Gardens and Waterloo Gardens. It’s an incredible place. The Marquis of Bute to the city donated the land for Roath Park in 1887. The park was officially opened to the public in 1894. Work initially focused on creating the lake from an area of marshland. 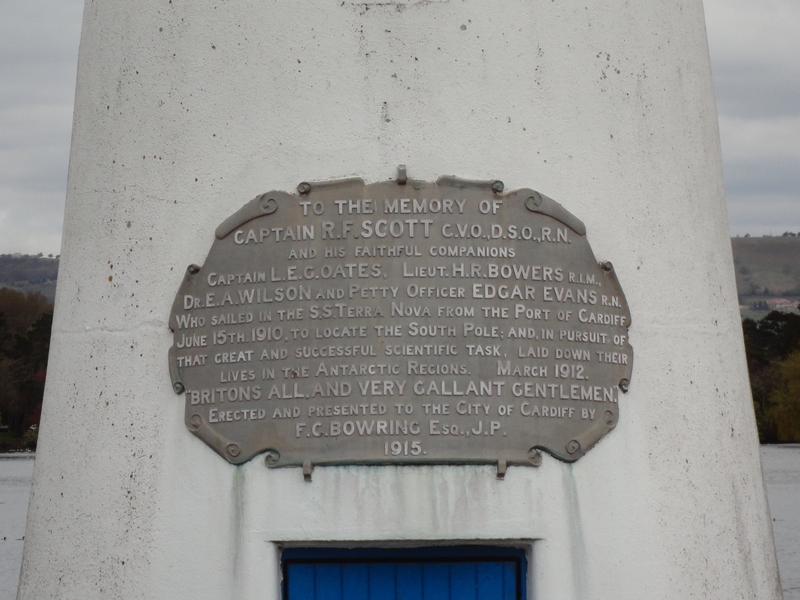 In 1915 a lighthouse was constructed in the lake containing a scale model of the Terra Nova ship to commemorate Captain Scott’s ill-fated voyage to the Antarctic, which started out from Cardiff in 1910. 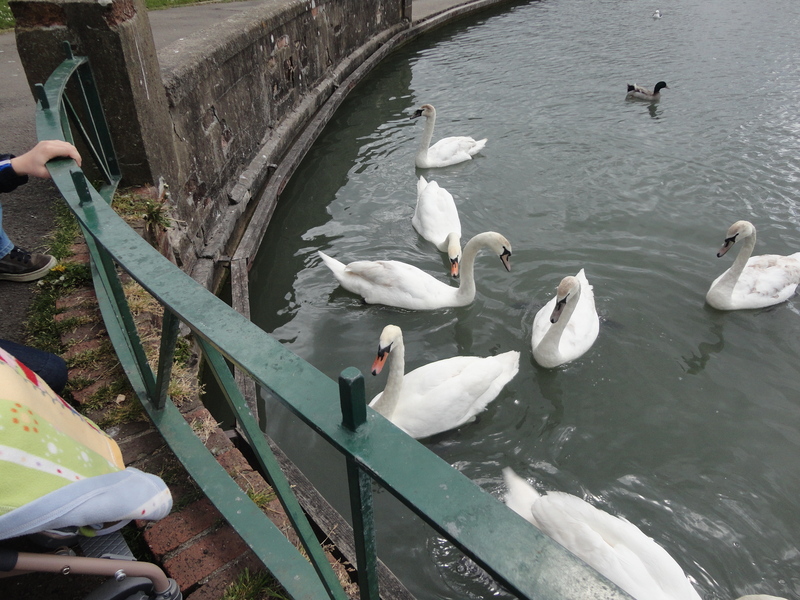 We parked the car in Lake Road West, loaded the pushchair with Alfie’s bag and lunchbox and most importantly, a bag of stale bread to feed the ducks and swans. 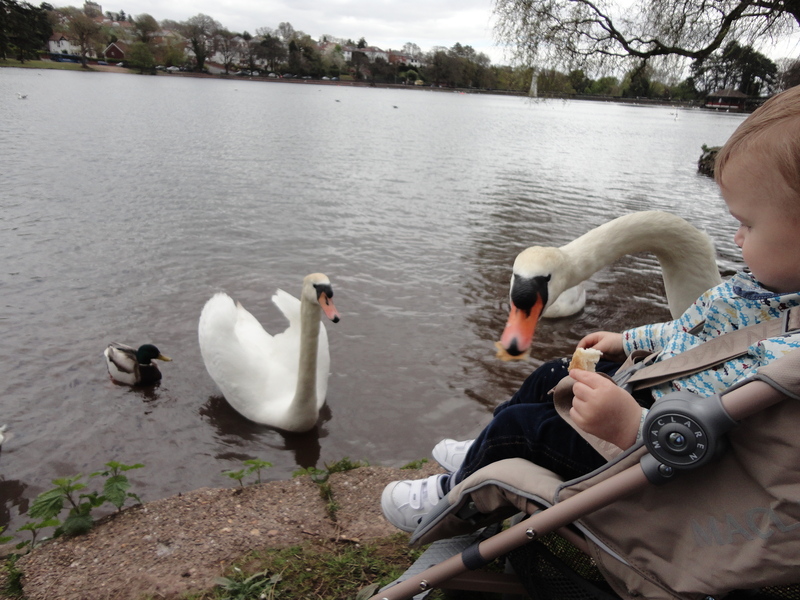 We had decided on a clockwise tour of the lake, which would mean a 1.3 mile walk for me and a 1.3 mile ride for Alfie. 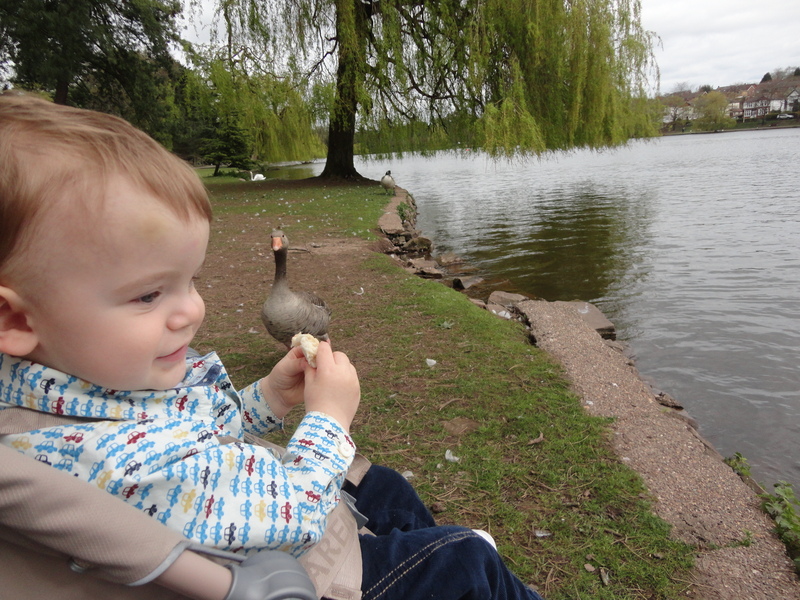 We fed some ducks and swans straight away and Alfie was totally fascinated by them, he giggled and laughed and pointed and shouted. 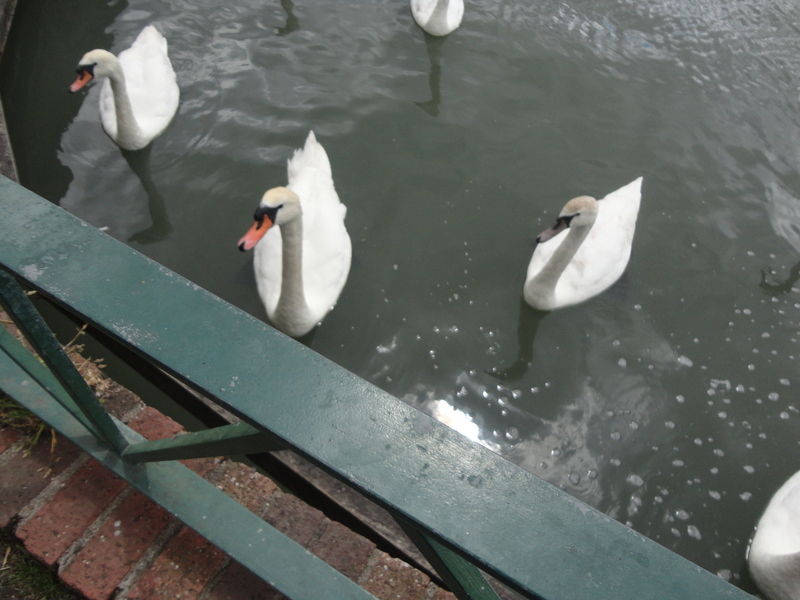 The swans were brave enough to come and take the food from our hands. It was fun! 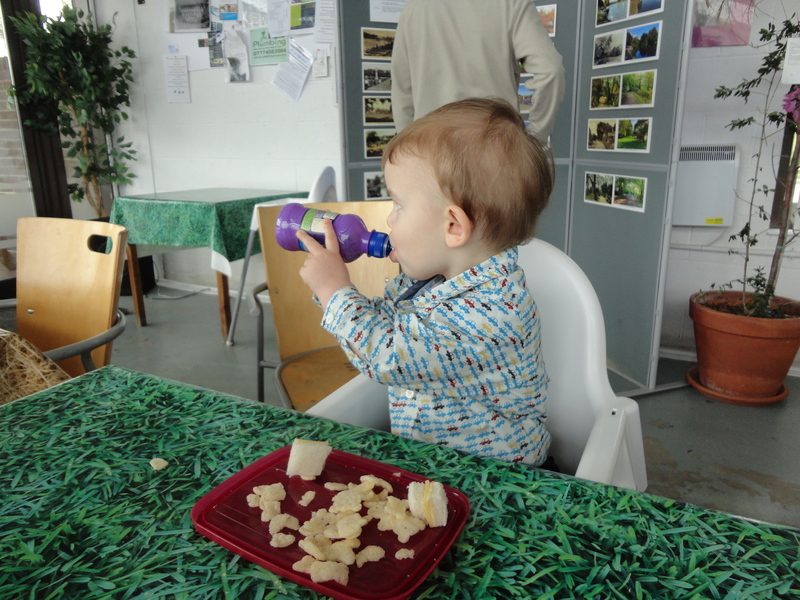 I chuckled when I looked around and saw Alfie tucking into the bread and realised it was getting around lunchtime. 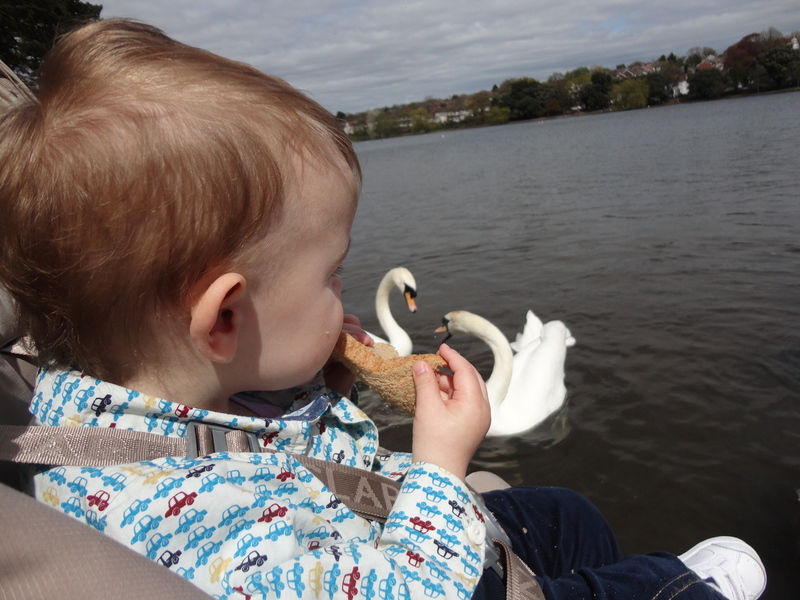 As I looked I am sure I saw two swans complaining to each other that this kid was eating their bread!! 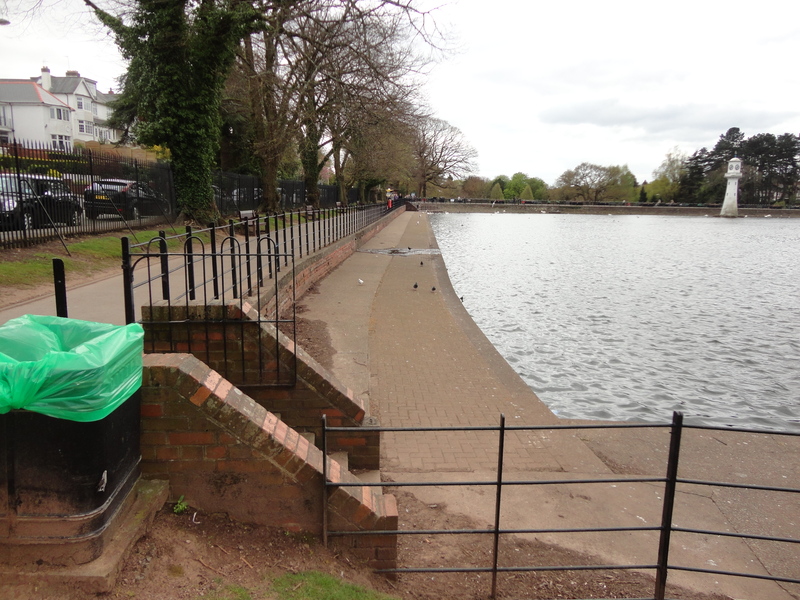 We strolled on and noticed a poster informing us that there were a number of Common Coots in the are around the lake. Then we happened to see one, she was chewing gum, had fag under one wing and was wearing a skirt that was much too short. 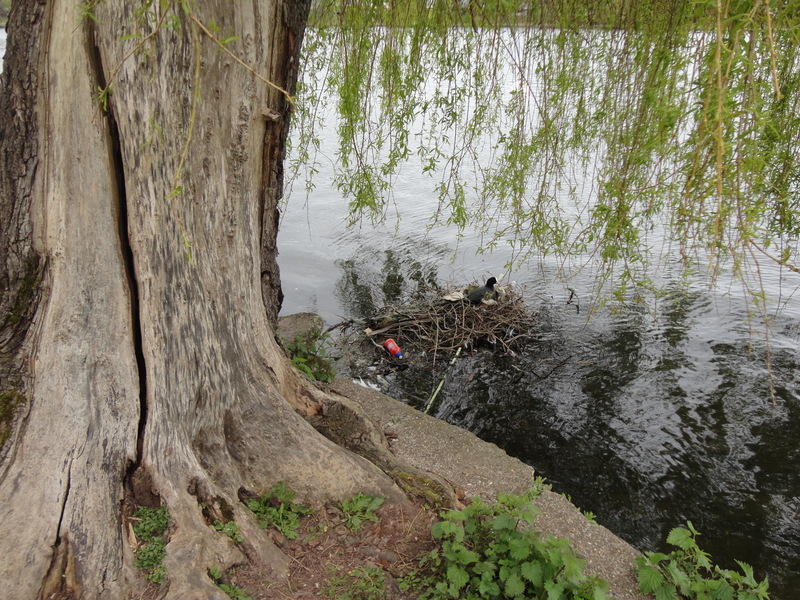 We also saw another coot sitting on her nest. We marvelled at her construction skills. We took a picture but didn’t get too close. Egg hatching is a serious business. A little further on we reached hallowed ground. I noticed a Willow Tree hanging out over the water of the lake. Spring was bringing a brighter shade of green to the leaves and my mind took me back 39 years to 1974 when one Sunday evening, I made probably the most important decision of my life and decided to ask the lady of the house if she would consider becoming my wife. After a lengthy one second to think about it she said yes… and the rest is history. I am so grateful that I have such a remarkable lady standing beside me, loving me and caring for me. She is a wonderful wife and an incredible grandmother to Alfie, Mia and Millie. We strolled on to the top of the lake where there are some islands. I used to dream of adventures on those islands when I was small. I think they are used as bird sanctuaries these days, allowing the birds to nest in peace. At the far end of the lake is something called The Wild Gardens. It’s a name I remember my mum using and I always expected to see herds of wildebeest roaming around. In truth it’s an untouched peace of land, which just grows naturally. The Wild Gardens was to be a second lake in the very first plans for the Park. That idea was abandoned on the grounds of expense. In June 1894 when the Park opened, this area had not been developed. Shortly after, in September 1894, a public shelter was built, and this was followed in 1896 by the creation of footpaths and two bridges over the brook. Apart from these additions the Wild Gardens retained much of its original state with indigenous trees, plants and wild flowers. The formal opening was on 27th May 1896, and a report of the ceremony referred to unlocking the gate. 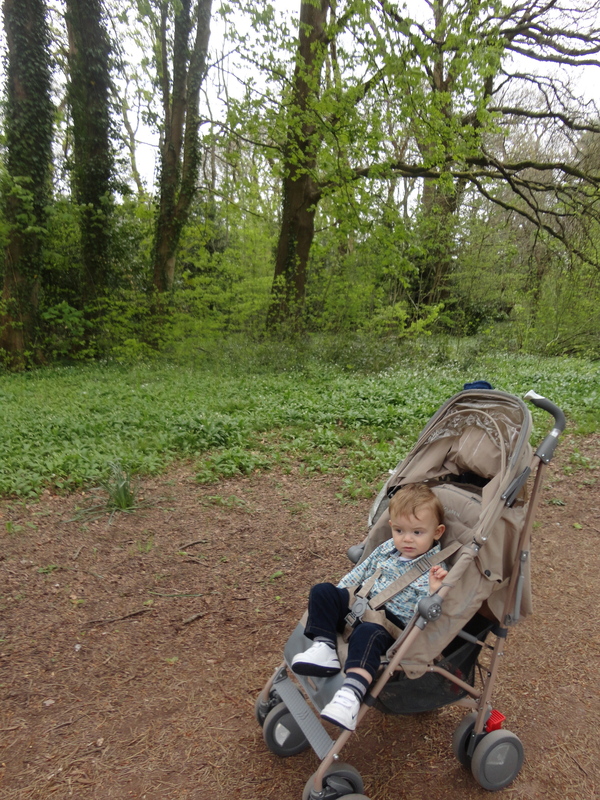 Alfie and I strolled slowly through enjoying the warm Spring weather, the peace and each other’s company. The birds sang noisily. 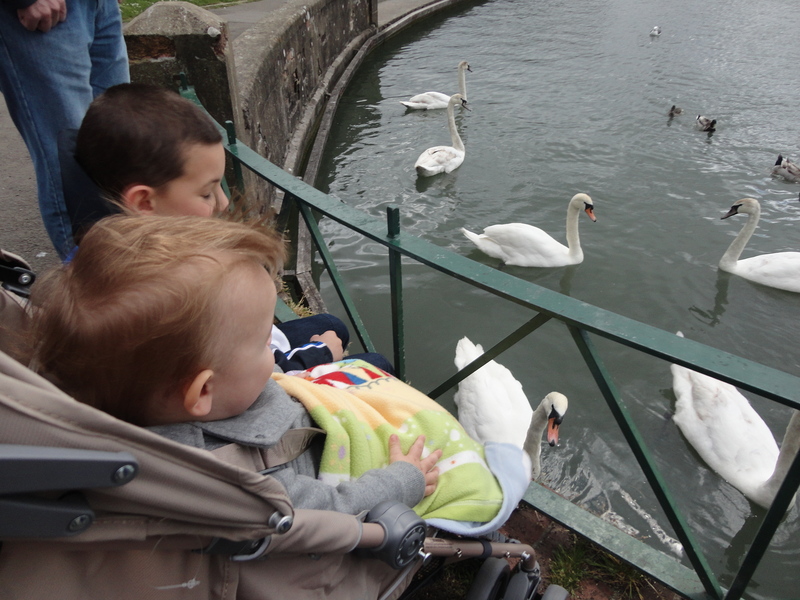 We walked back down the east side of the lake, pausing often to watch the birds. 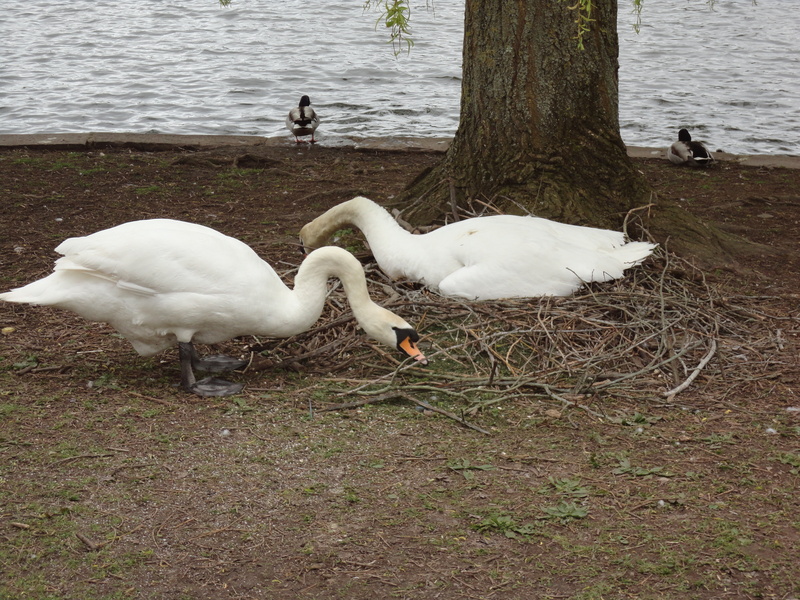 We passed two nesting swans; they mate for life…a bit like me and the lady of the house! 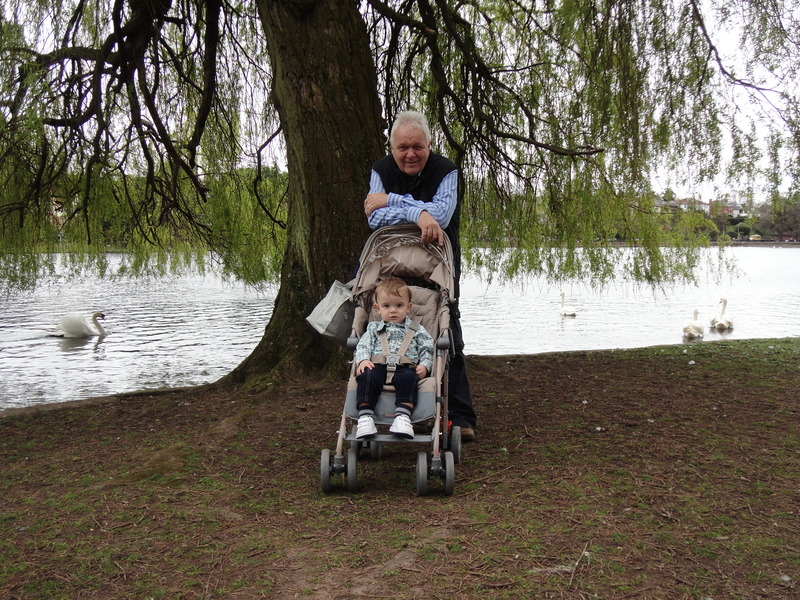 I showed Alfie where the changing huts used to be when people were allowed to swim in the lake. Further on we passed the bridge over a small weir, which controls the height of the water level in the lake, and I showed Alfie where I played Pooh Sticks every single time we visited the park when we were kids. Pooh sticks is a game Winnie the Pooh and friends play together on a warm and sunny day. And he went back for some more fir-cones. It did. It kept on doing it. Then he dropped two in at once, and leant over the bridge to see which of them would come out first; and one of them did; but as they were both the same size, he didn’t know if it was the one, which he wanted to win, or the other one. So the next time he dropped one big one and one little one, and the big one came out first, which was what he had said it would do, and the little one came out last, which was what he had said it would do, so he had won twice … and then he went home for tea. ‘The official Pooh Corner Rules for Playing Pooh Sticks’ was written in 1996 to commemorate the 70th anniversary of the publication of ‘Winnie-the-Pooh’. 1.First, you each select a stick and show it to your fellow competitors. You must agree which stick is which – or whose, as it were. 2.Check which way the stream is flowing. Competitors need to face the stream on the side where it runs in, under the bridge (upstream). Note: If the stream runs out, from under the bridge you are standing on the wrong side! (downstream). 3.Choose someone to be a Starter. This can be either the oldest or the youngest competitor. 4.All the competitors stand side-by-side facing upstream. 5.Each competitor holds his or her stick at arms length over the stream. The tall competitors should lower their arms to bring all the sticks to the same height over the stream as the shortest competitor’s stick. 6.The starter calls, ‘Ready – Steady – Go!” and all the competitors drop their sticks. Note: the stick must not be thrown into the water. 7.At this point in the game all the players must cross to the downstream side of the bridge. Please take care – young players like to race across. Remember, other people use bridges and some of them have vehicles or horses. 8.Look over the edge of the bridge for the sticks to emerge. The owner of the first Stick to float from under the bridge is the winner. Remember: Falling into the water is SAD (Silly And Daft)! I am looking forward to playing Pooh Sticks with Alfie, Princess Mia and Angel Millie when they are older. 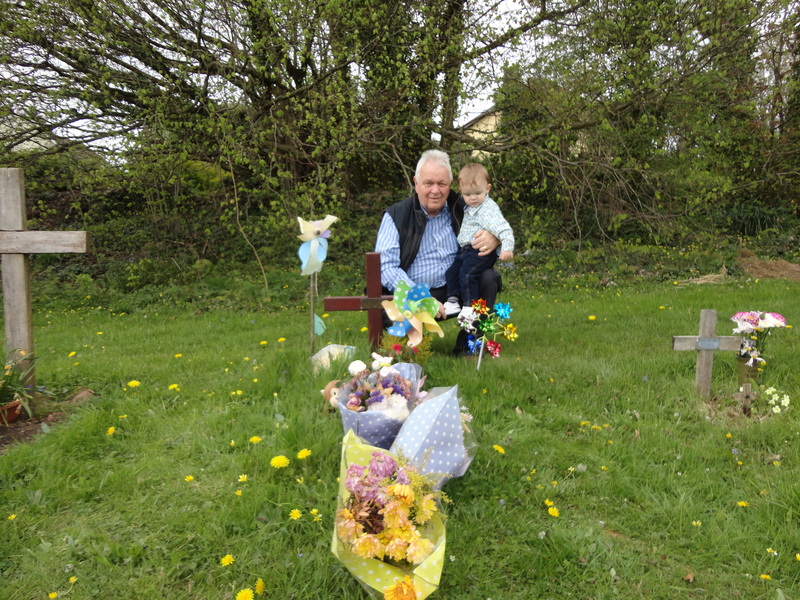 We then passed a new memorial to Robert Scott, which I enjoyed but Alfie was not so interested. We walked on to the café where I ordered lunch but then withdrew the order, as they did not accept debit cards, so I went hungry and I just took Alfie for his lunch, which I had prepared at home. The café was called The Terra Nova, the name of Scott’s ship; it was a nice place with views over the lake. As we strolled back to the car, we passed the place where we used to ride on the paddle boats, they were marvellous things with two handles which you had to turn to propel you along, I would love a go now, but they have long gone. 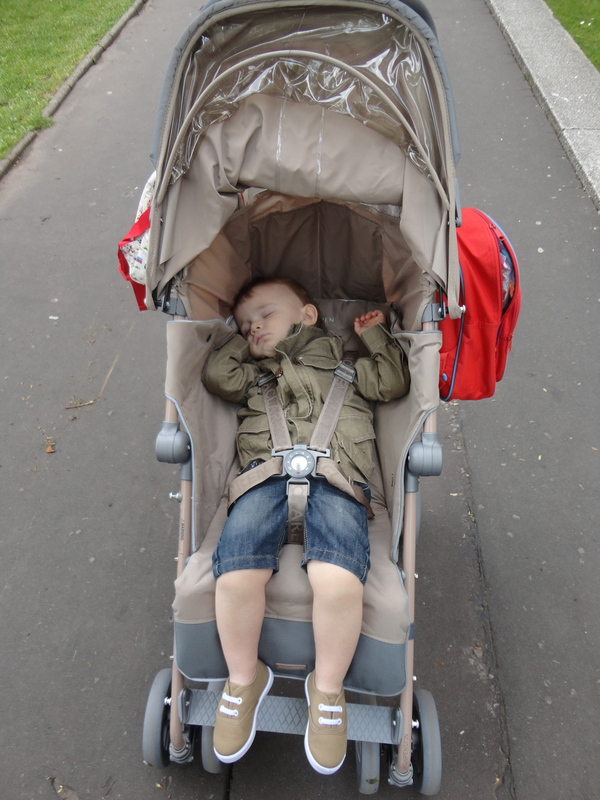 Alfie dropped off to sleep as soon as he was back in the car and I am sure he had his hands outstretched in his sleep as if he was dreaming of Pooh Sticks. 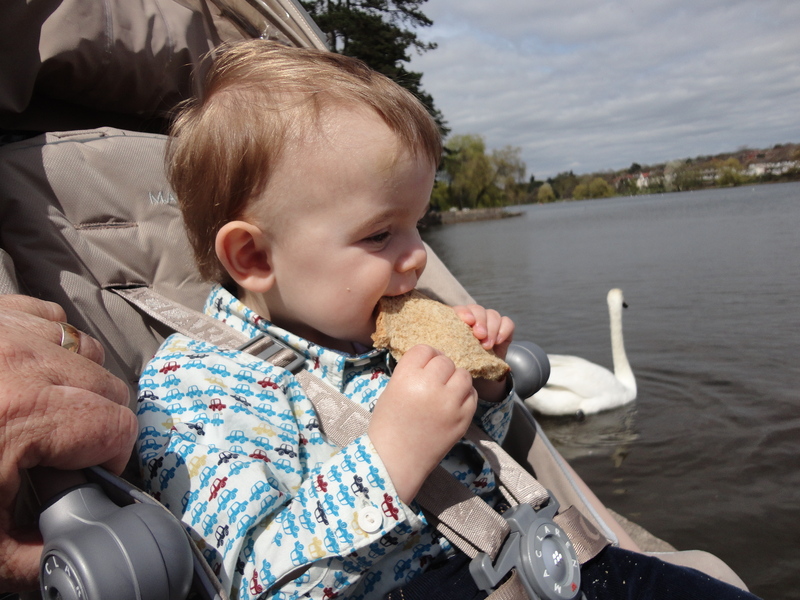 I still love Roath Park and now Alfie does as well. Happy days! He’s the ladies’ pride and joy! So go the words of a jolly old song I remember hearing many years ago. I have no idea whether the words are true. As far as being the ladies’ pride and joy, I can only say that I am sure that it applies to the lady of my house and her thoughts about me. Yesterday I had a remarkable chance to find out. For all my life I have loved trains, my earliest dreams were about driving the steam engines I used to watch and travel on as a nipper. I spent many hours dreaming dreams in the Barry Scrapyard owned by Dai Woodham. Sadly I am not sure my dream of being a train driver will ever come true. 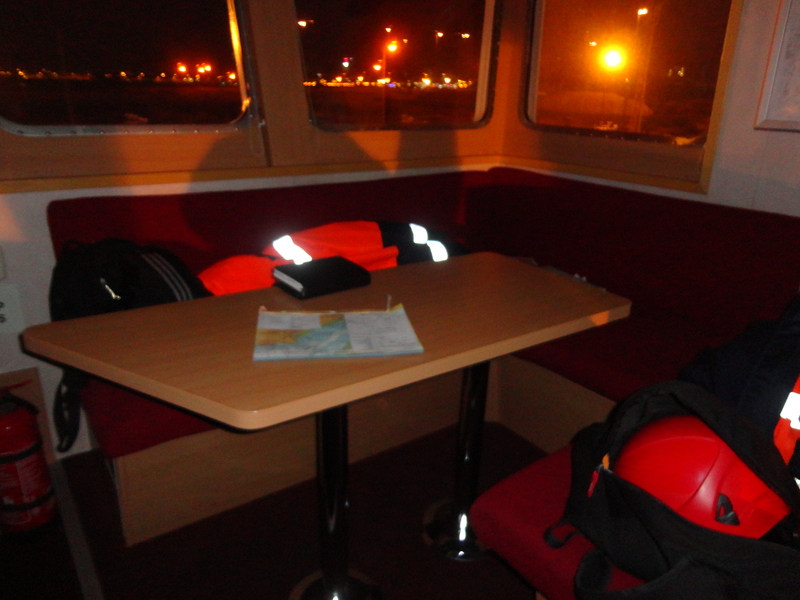 Imagine my surprise then to be offered the chance not to ride on a train but on a ship. My friend Bob became the creator of dreams yesterday when he offered me the opportunity to travel on a ship sailing the murky waters of The Bristol Channel. 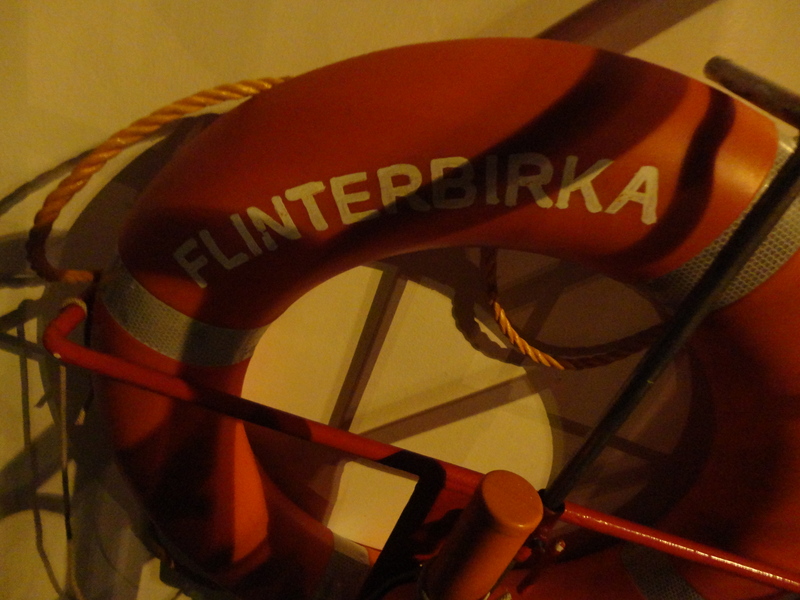 The Flinterbirka is an 83-metre long ocean going vessel weighing 3481 tons dead weight. 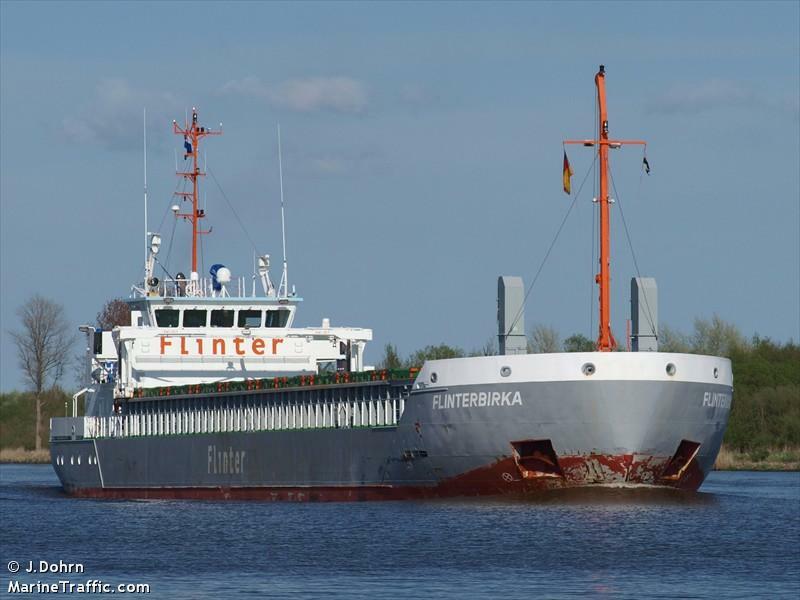 It had recently sailed from Latvia carrying a consignment of wood to Cardiff Docks. Bob is a ships’ agent and my friend. Knowing that I like to make ordinary days special, he arranged with the ship’s captain, a fine Dutchman to take me from Cardiff Docks, down the Bristol Channel to Barry Docks where part of the cargo had to be offloaded. 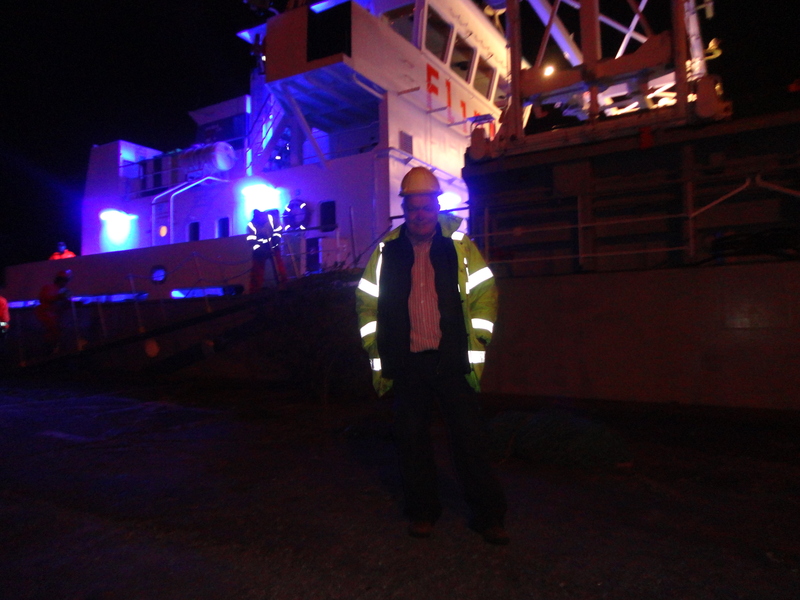 Bob dropped me off on the dockside shortly before 9.30pm the time the ship was booked to travel through the lock gates of Cardiff Docks for its epic voyage to Barry. In the eyes of the world a mere hop in the dark, but to me a chance to explore a world of which I knew nothing about. 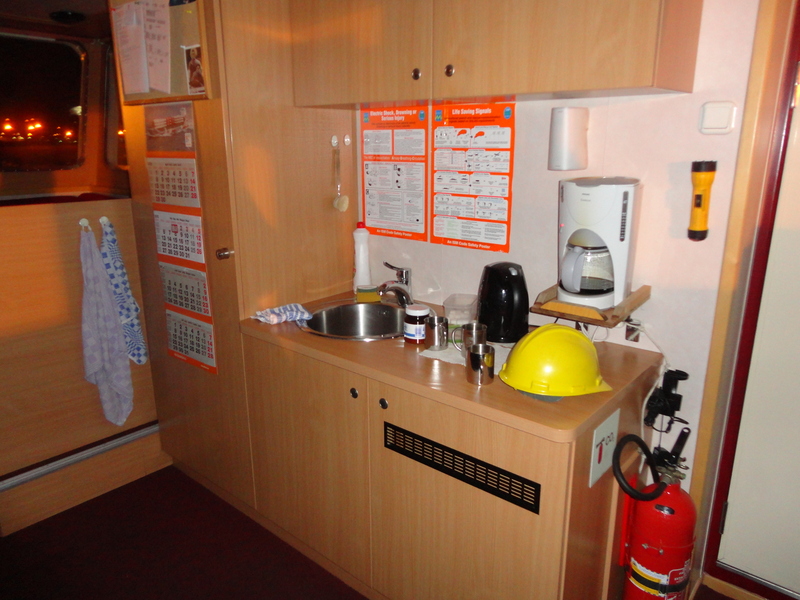 I was about to become a merchant seaman. I often wondered what it would be like to be called an able seaman and now I was about to find out! JK eat your heart out! 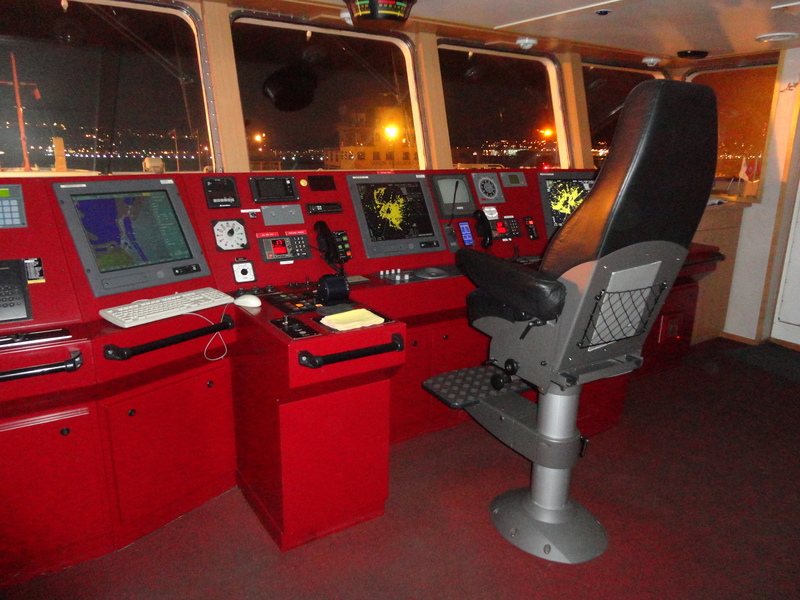 I made my way to the bridge of the ship and met the captain. He invited me to make myself at home, find my sea legs and enjoy the voyage! I wanted to salute him and say ‘Aye ‘Aye Cap’n, but I thought better of it. I said it in my mind though. I gazed at the bank of computers and radar screens, fascinated by everything I could see. Shortly before departing we were joined by the two pilots, one trainee and one real pilot. The waters of the Bristol Channel are dangerous and the ships’ channels have to be negotiated with great care. We made our way through The Roath Dock and then through a cut and crossed the Queen Alexandra Dock. 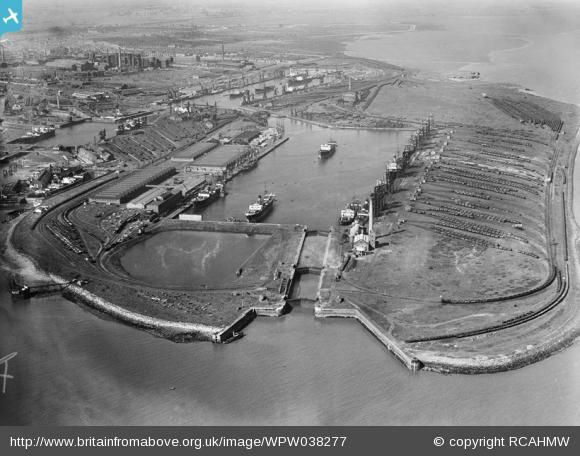 The Queen Alexandra Dock, the last & largest of Cardiff great docks was opened by King Edward VII on the 13th July 1907. By then, coal exports from the South Wales Coalfields via Cardiff totaled nearly 9 million tons per annum. By 1913, this had risen to 10,700,000 tons, making Cardiff the biggest coal exporting dock in the world. At the end of the dock there is a lock, where we stayed for a short while to allow a smaller ship to join us. We went down to the level of the open sea outside. I gazed across at the barrage and the great city of Cardiff beyond. The sea was calm and all was well. 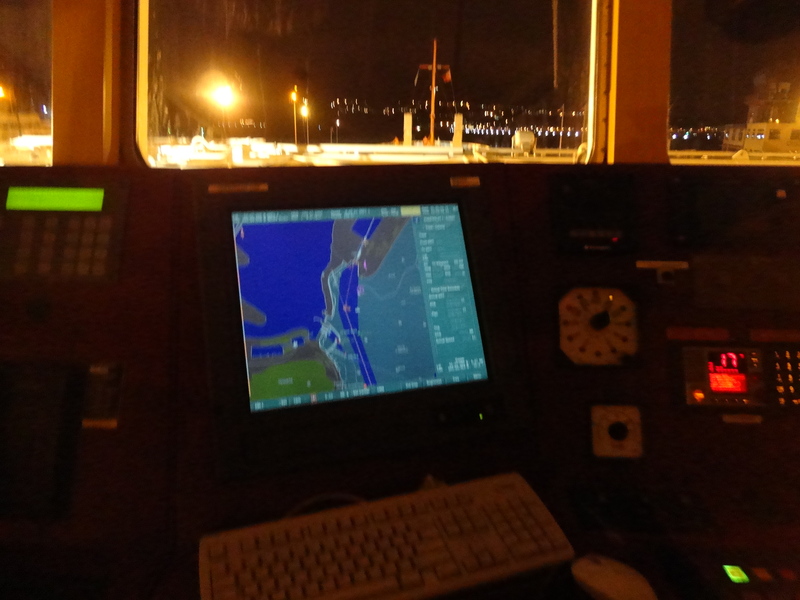 As we left the port, the trainee pilot took control and guided the ship out through the channel, past Penarth Pier and along the coast. 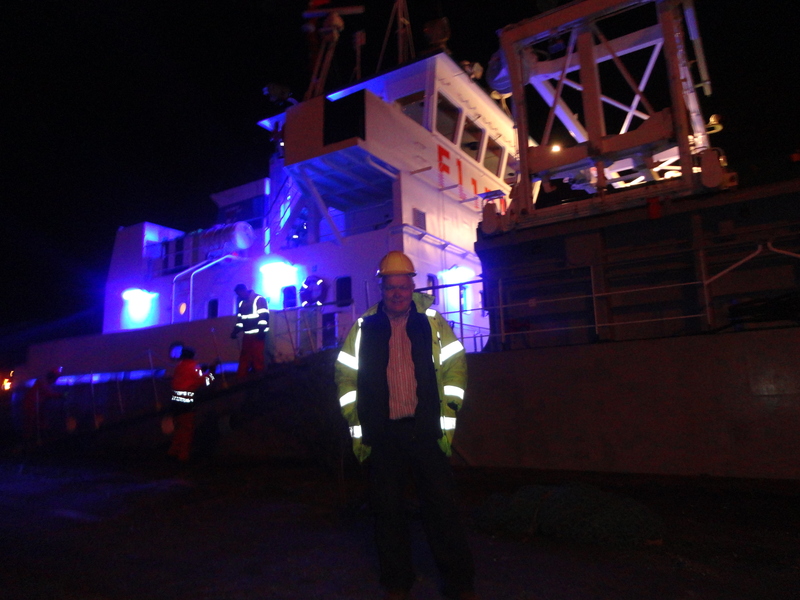 The hum of the engine and the sea breeze in my face caused me to think about coming out of retirement and becoming a real merchant seaman. I thought of some of the great sea farers of history, Christopher Columbus, Sir Francis Drake, James Cook and Ferdinand Magellan and I can honestly say none of them had ever been as excited as I was as we sailed down the coast. For those great men The West Indies, The New World, New Zealand and other famous places were their playground but for me something better, far better. 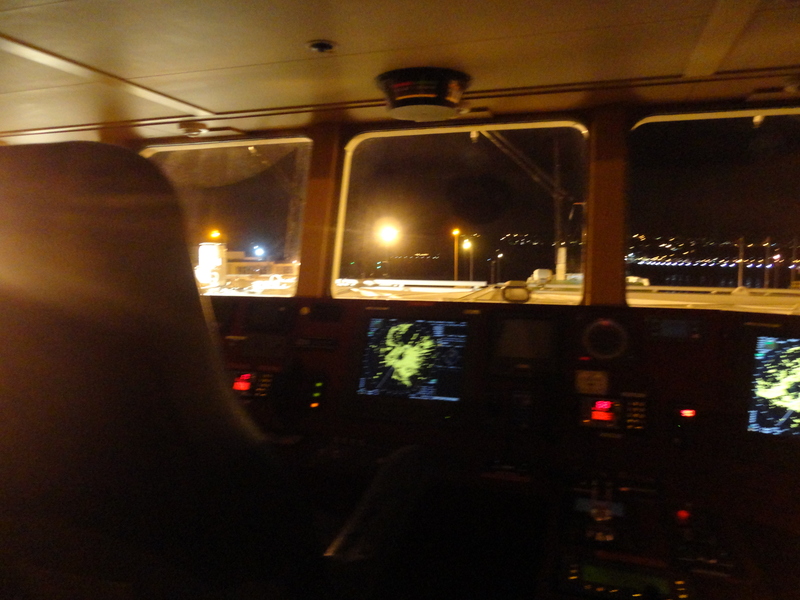 We sailed past Lower Penarth, Lavernock Point, and Swanbridge with the lights of the Captains Wife glimmering in the mild Spring night. Then the excitement of seeing Sully Island shrouded in mystery, covered with a cloak of darkness. 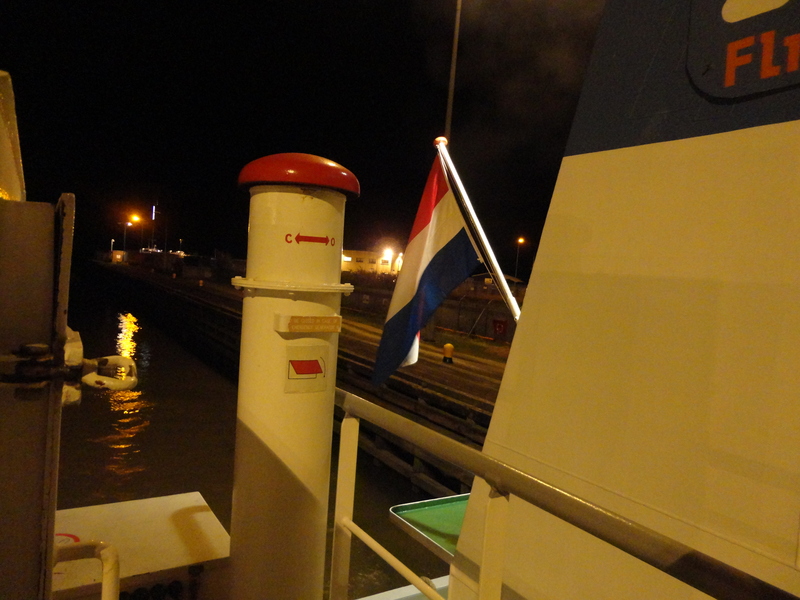 As we passed Sully the captain made me a cup of real Dutch Coffee, it was beautiful, sipping it in the moonlight with the sea breezes ruffling my graying hair. Next came the bright lights of Dow Corning with Cadoxton perched above it. 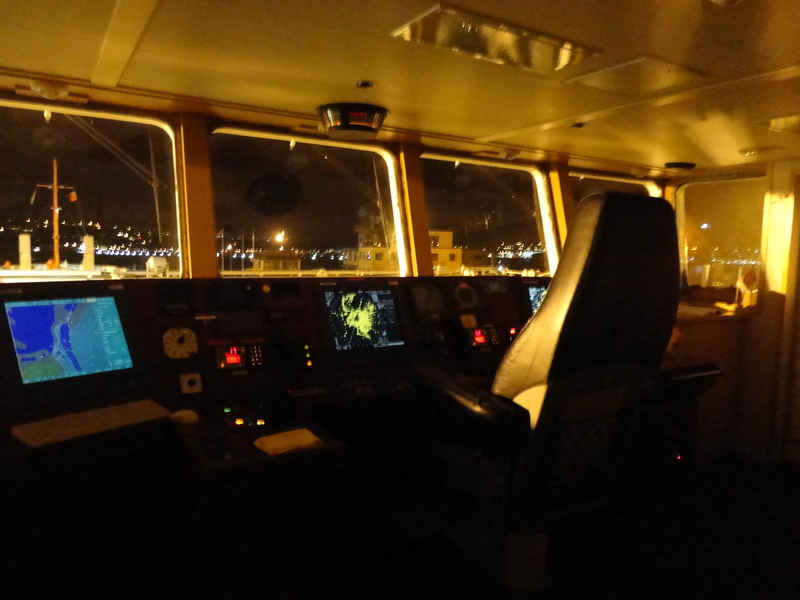 I hovered between the bridge chatting with the captain and the outside standing on deck watching my fellow seamen working away below me. 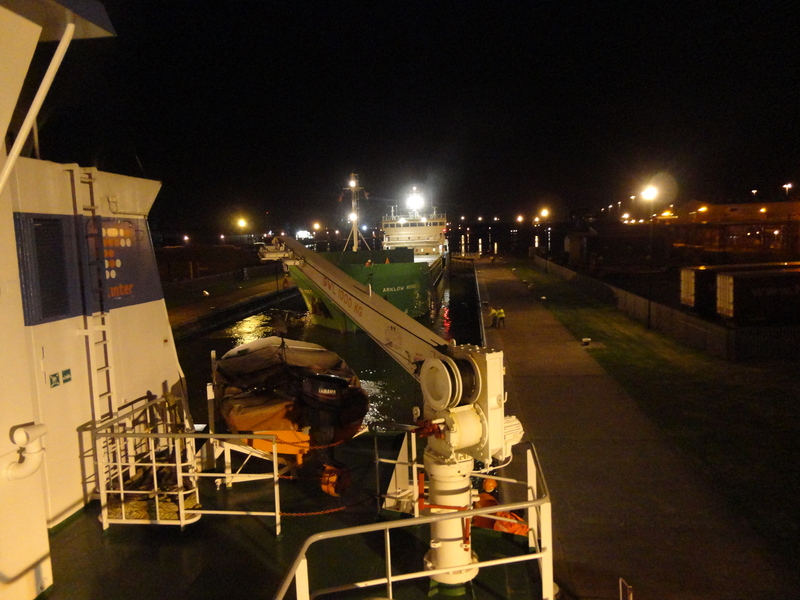 The flashing green light ahead marked our destination, the lock gates to Barry Docks. Visitors to the seaside town of Barry which lies to the west of Cardiff, might be forgiven for thinking that the place held nothing more important than a pleasure beach, a fun fair and a few empty docks that seem to have little or no purpose. Yet there was a time when Barry was the largest coal exporting port in Britain, possibly even the world. That may have been a long time ago and the town’s days of glory may be gone, but what a glory they were. 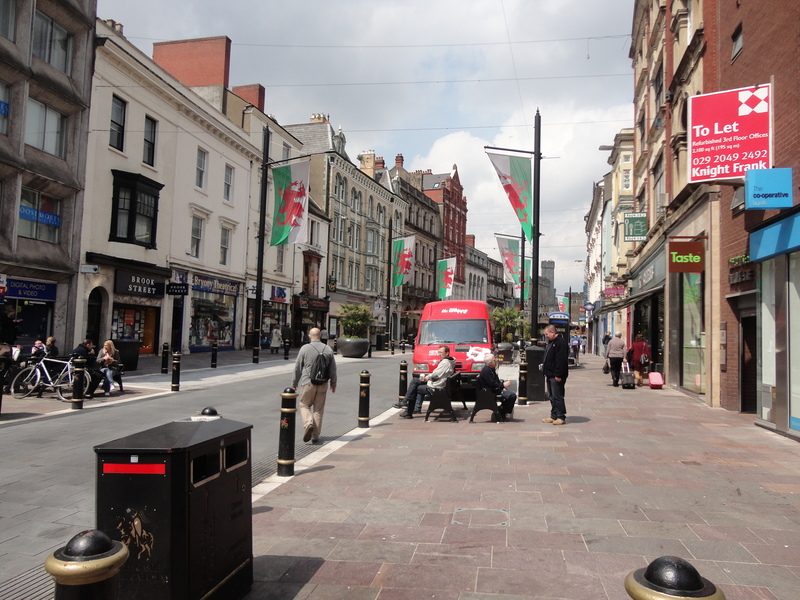 The development of Barry as a port was down to two things – the rapid growth of the south Wales coal trade and the dynamic personality and business acumen of David Davies, the very first Welsh millionaire. Work began on the new dock at Barry on 14 November 1884, along with the construction of the new railway link. Everything was completed in double quick time and the dock opened for trade in 1889. I thought of the history and the thousands of ships to have entered this historic port as the pilot and then the captain steered the ship carefully into the dock entrance and again into the lock. 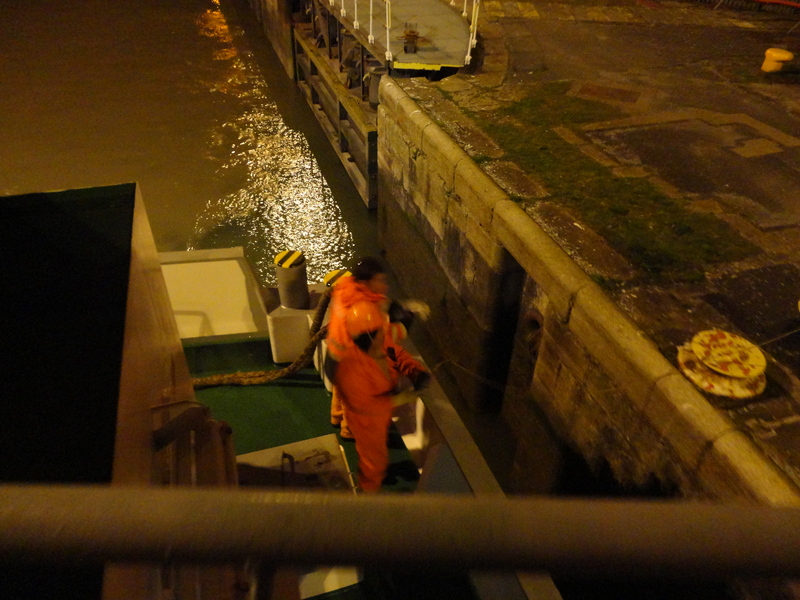 This time the lock took us up to the level of the water inside. 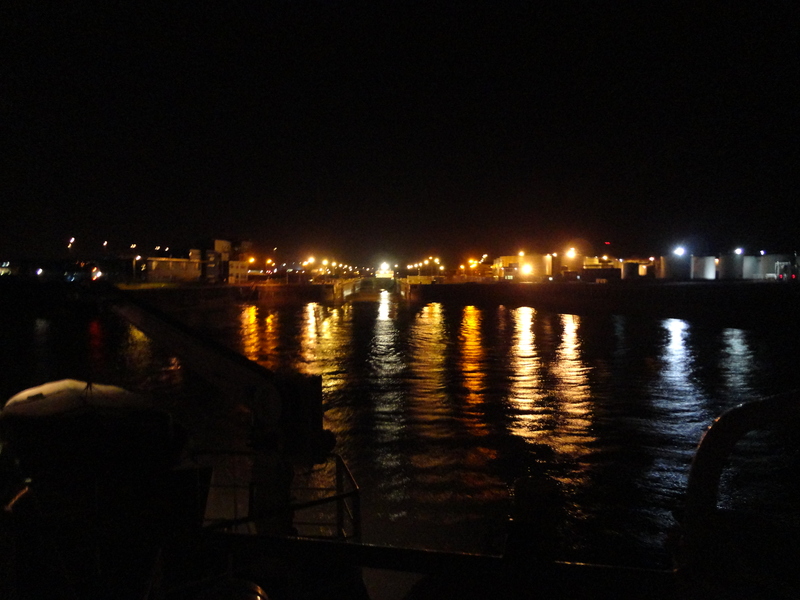 Before long we made our way through another cut before berthing at the dockside. I thanked the captain for his invitation and fine hospitality and helping to turn an ordinary day into something rather special.I shook his hand but held back from giving him a salute, although in my mind that’s exactly what I did… and he deserved it! Waiting down on the dockside was a friend who will probably never know how much I appreciate his thoughtfulness. He was there to take me home and I was about to find out if the lady of the house, like all the other nice girls, really does love a sailor. Maybe she’ll call me Popeye and I can call her Olive!! 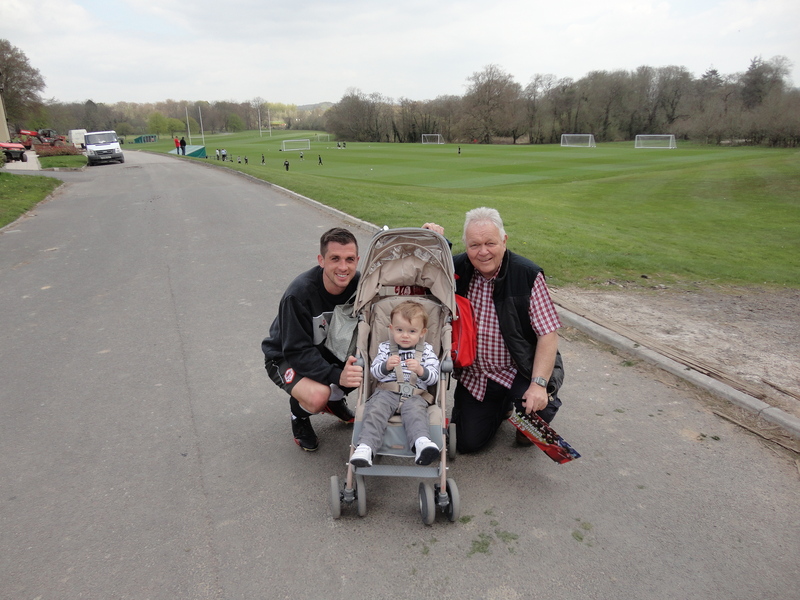 Adventures with Alfie – meeting Cardiff City. 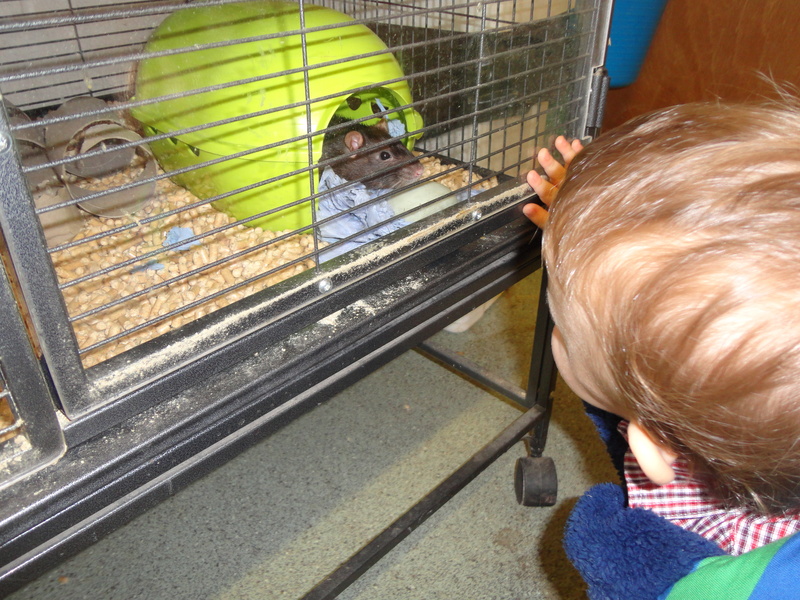 Alfie’s mum was called into school today and his Nana Jean who normally looks after him on a Wednesday is poorly, so The Adventures with Alfie Team was called into action. 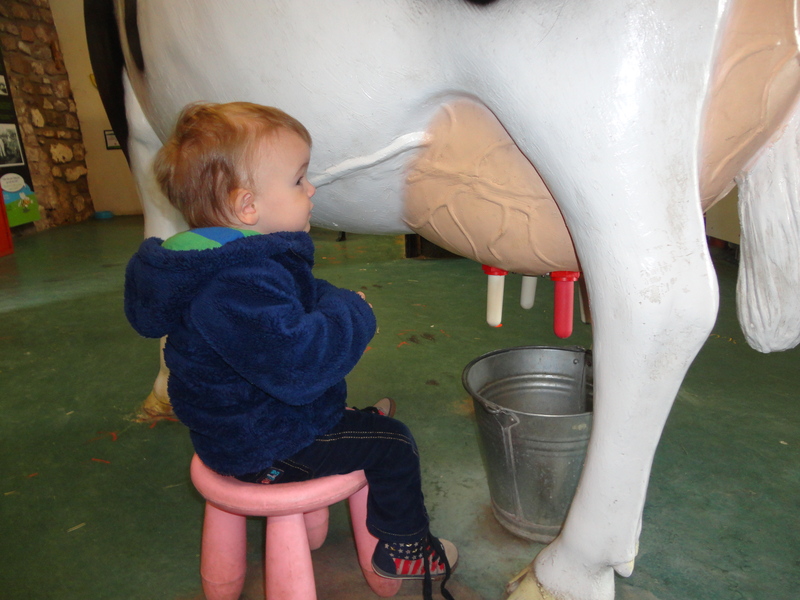 The request for childcare came with an odd request from Alfie’s dad. 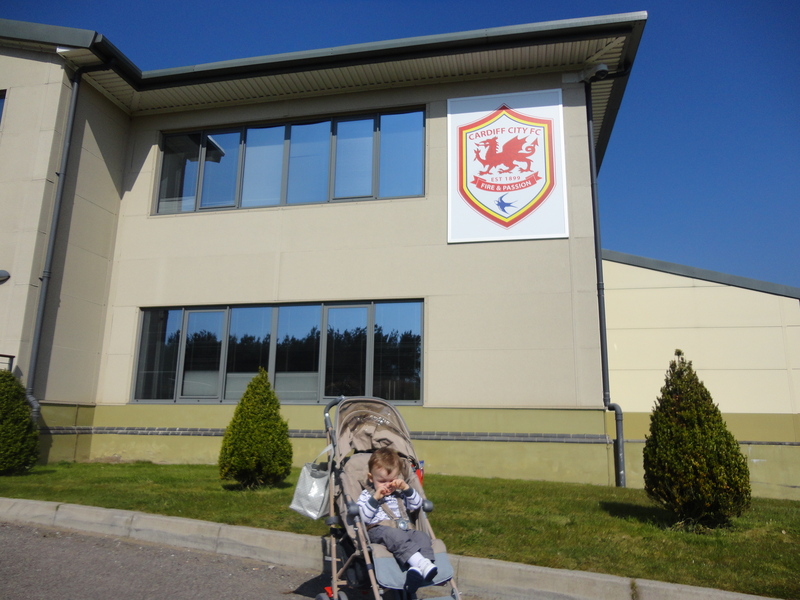 I was asked if I could take Alfie to the Cardiff City Training Complex at the Vale Hotel in The Vale of Glamorgan to collect some Cardiff City autographs. He provided me with a kid’s size shirt in red and a picture, which looked like a pull-out from a cheap magazine, of Malky’s Maestros. It was a challenge, but life is all about challenges and tackling them as best as one can. I had no fears. I have been collecting football autographs since Adam was a boy. I had thousands of City autographs from when City were a great team in the Cardiff City 1 v 0 Real Madrid days. I have also spent hours outside Old Trafford with my boy (age 34) trying for a Ryan Giggs or Wayne Rooney! 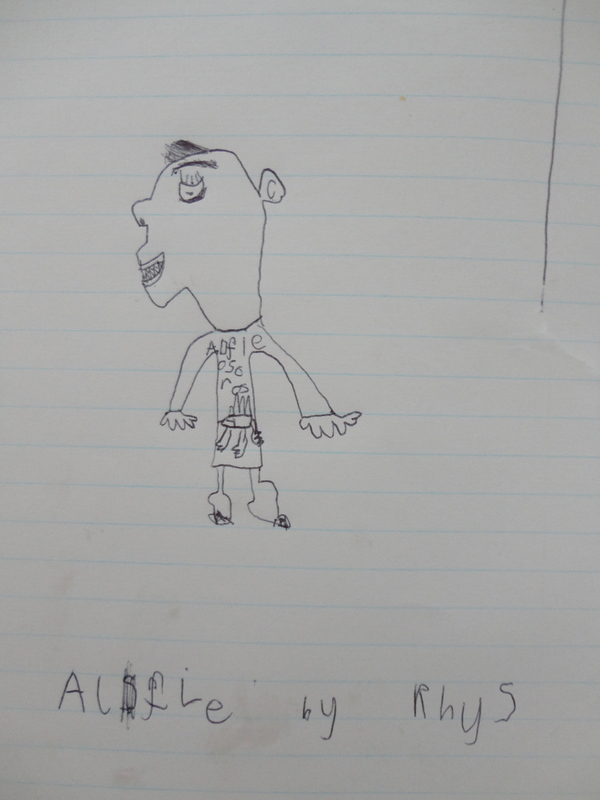 Alfie was dropped off just after eight in his pyjamas – seemed like I had to do the full works. I coped well and at 9.30 a.m. we were fit and ready to go. It was a beautiful day and the drive up to the Vale hotel via the Ely Link Road and the M4 was pleasant. 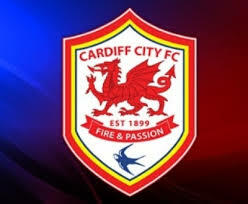 When we arrived I didn’t have a clue where to go so I pulled into the cark park next to the building with a massive Cardiff City badge on it… seemed a good bet this was it. The BMWs and the Audis and the Porches next to my aging Ford Focus gave me that idea I was in the right place. We got out and strolled around. There was this guy with a strong valleys accent holding a red football shirt. I guess he was doing the same thing. 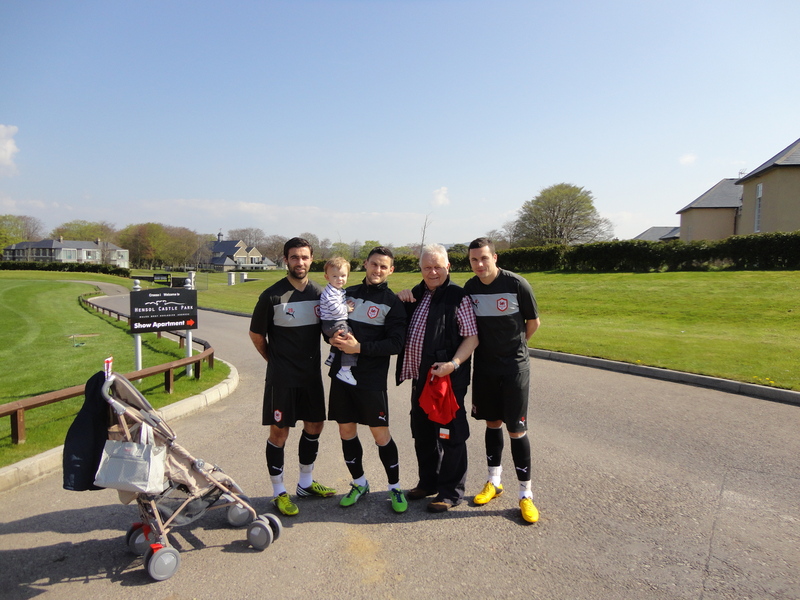 We chatted and before long the team started to come out and jog to the training pitch. I got as many autographs as I could and a few pictures too. I would like to have made them stand in a line so I could get them all, but this was not possible. 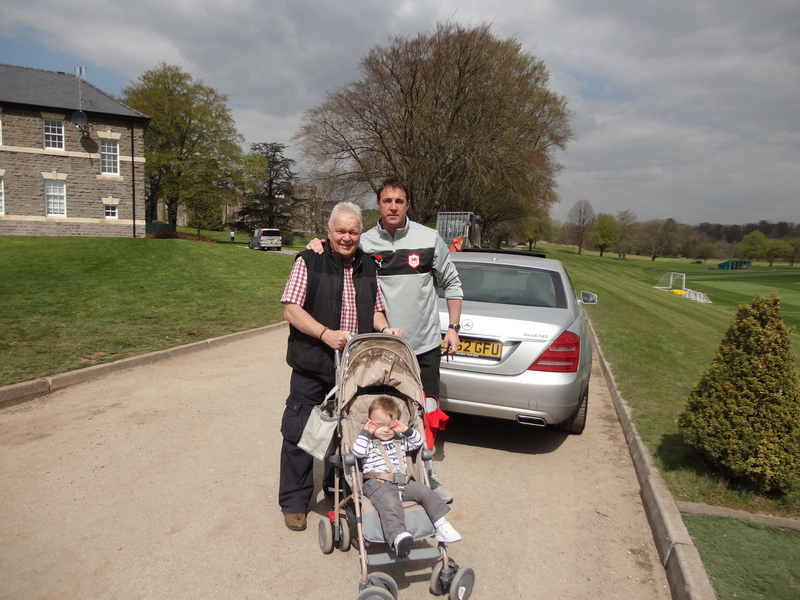 I had a few funny looks from some of the players – an old geeky looking guy with a kid in a pushchair asking for autographs and photographs, but I must say most were really pleasant, especially Alfie’s favourite player, the home grown star Craig Bellamy, who lifted Alfie out of the pushchair for a ‘proper photo’. 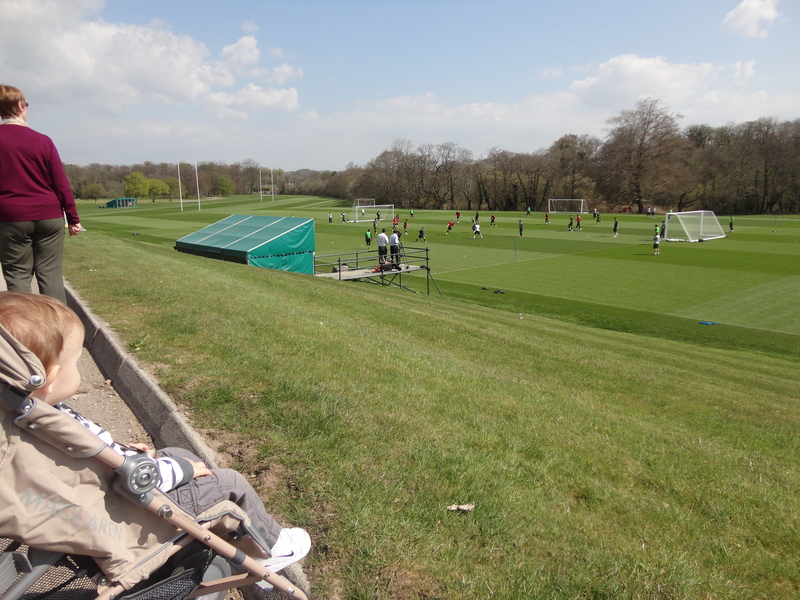 Once all the players had passed by I had one more to get and when I asked this guy wearing a ‘City’ top he laughed and told me he was just cutting the grass in the hotel… silly me. I still don’t recognise all the modern players but ask me about the proper City team with Bob Wilson, Gary Bell, Dave Carver, Ronnie Bird, Mel Sutton, Alan Warboys etc. and I would never have made that mistake! My valleys butty and I then strolled down to watch them train. It was a warm spring day and we had a good time. 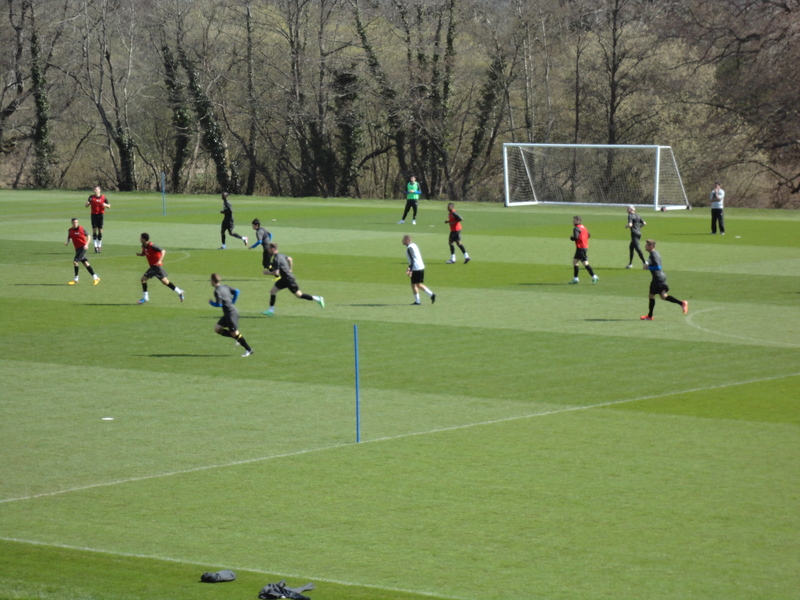 For a while we watched the team being put through their paces. 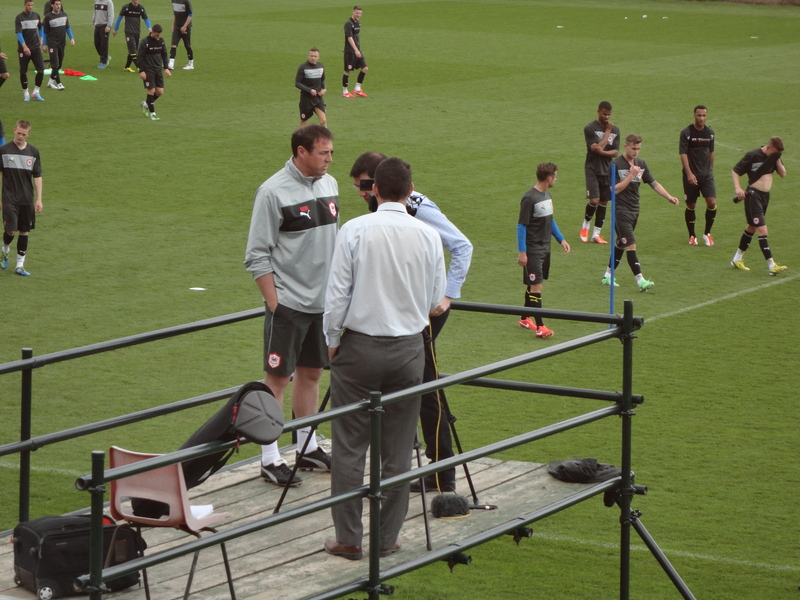 Malky the manager drove up and started talking to a few odd bods before being interviewed by some newsy looking chaps. Then he strolled up and started talking to us. 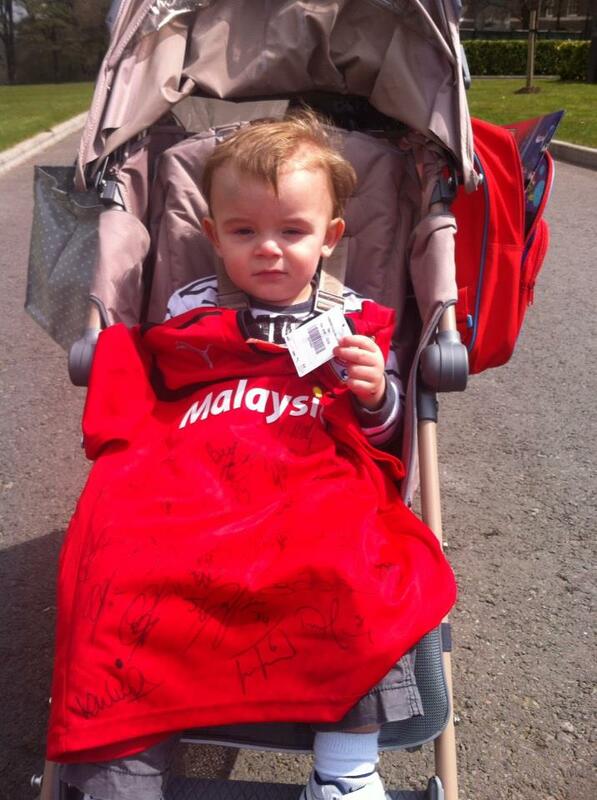 He signed Alfie’s shirt and picture before jetting off to plot the downfall of next year’s premier league teams. I thanked him for getting into the Premier League. I started watching City in the early sixties, just after they had been relegated from the old Division One. It’s been a long wait – about fifty years – so the handshake I gave him was well deserved. 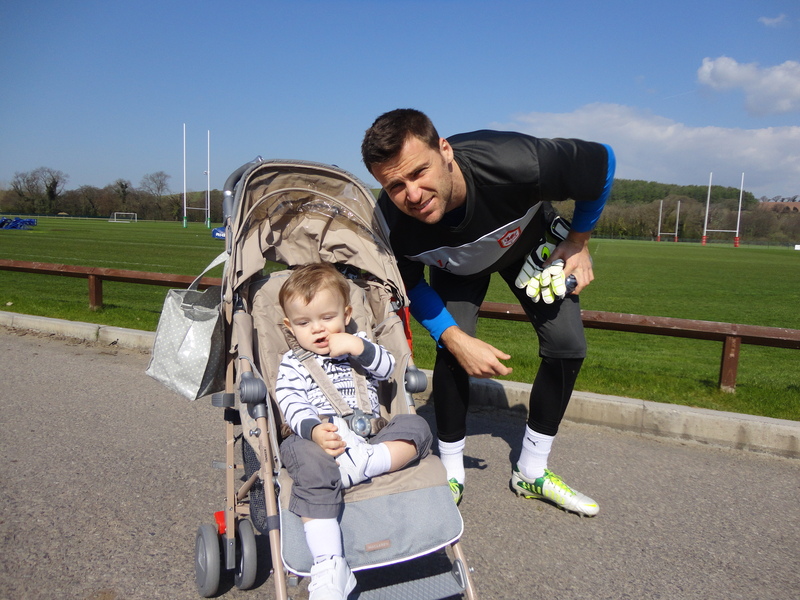 As training drew to a close I managed to get a few more autographs before returning Alfie to our home and a fun filled afternoon with Aunt Bes.I hope Alfie’s dad is pleased with us. Dedicated to Sam Hully…my old pupil and friend….